Again, I had to change my route due to the weather. 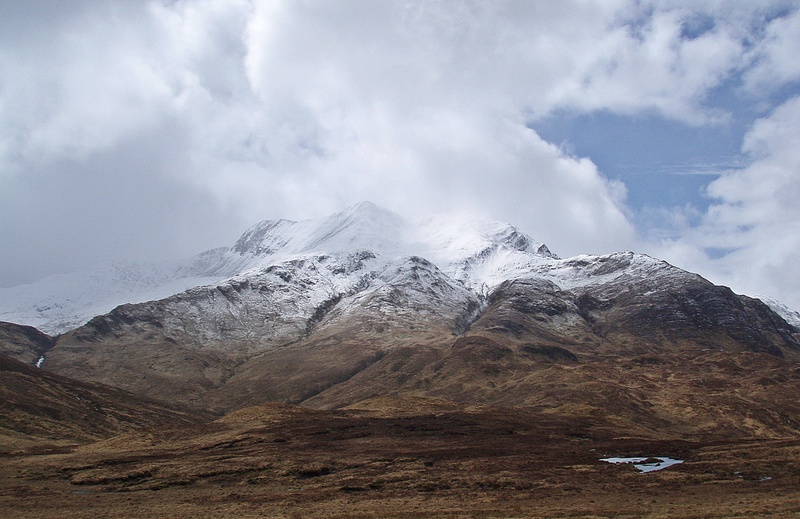 The worst weather happened to be on day 4, for which I had planned a high route along the Mamores. 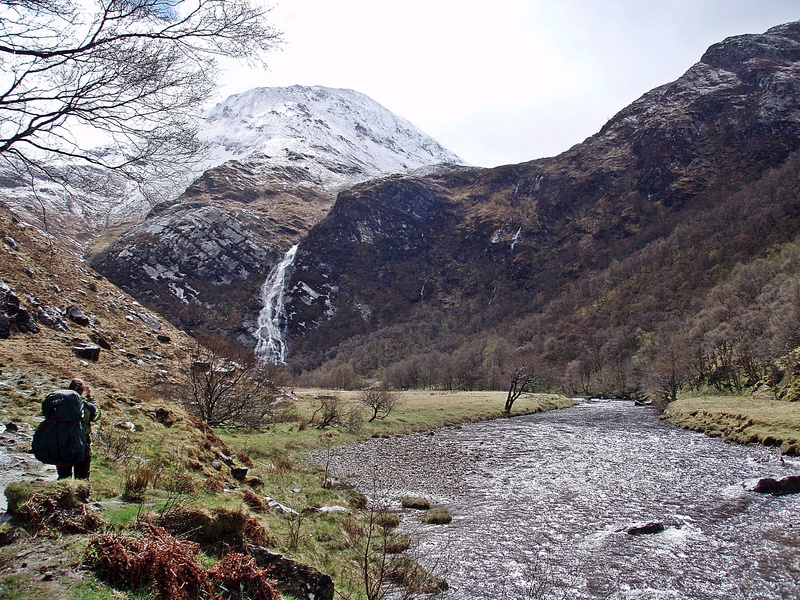 My Munro-bagging friend Dunja was going to join me and bag some of the summits en route, so it was quite frustrating for us both when we had to stay low and walk through Glen Nevis instead. 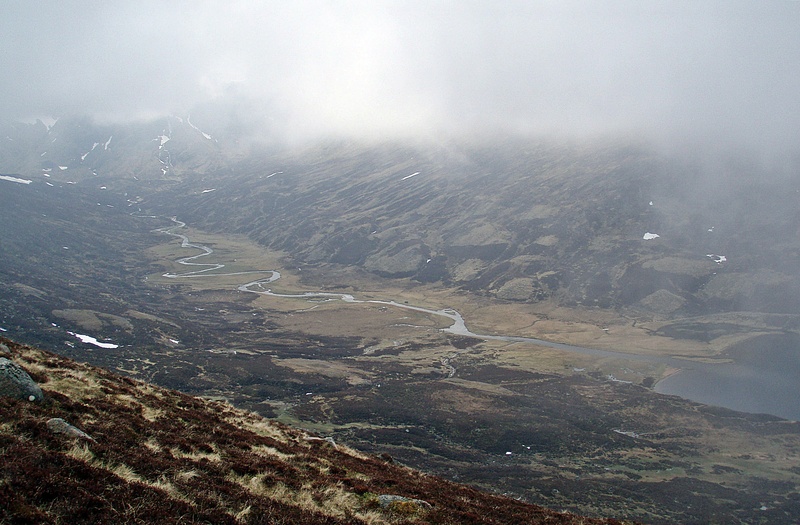 But apart from that, I could follow my route as planned, and even managed to climb one new Corbett and one (repeat) Munro. 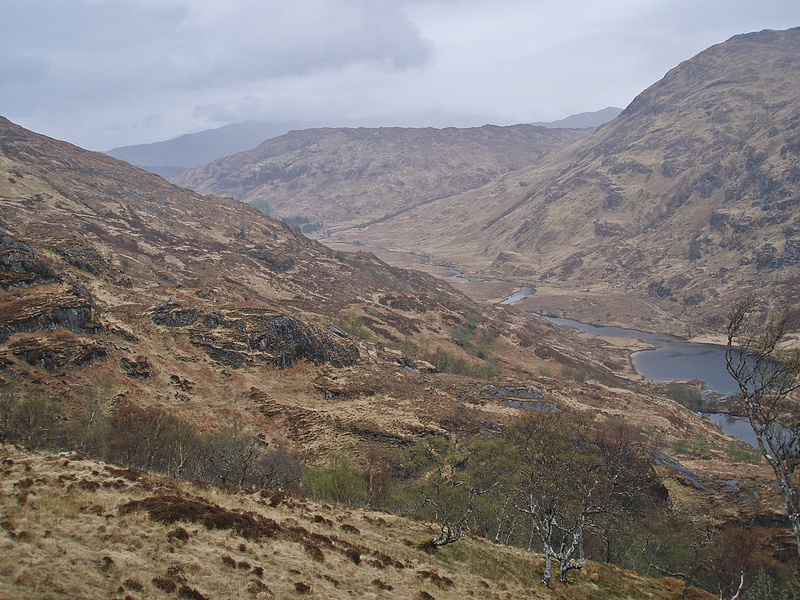 The journey to my start point went smoothly: first a taxi to the bus station at 06:10, then a bus to Fort William and a connecting one to Lochailort. On the way down S the weather was nice and sunny, and from the A82 N of Spean Bridge I could see Ben Nevis and the Aonachs, still under a massive snow cover. 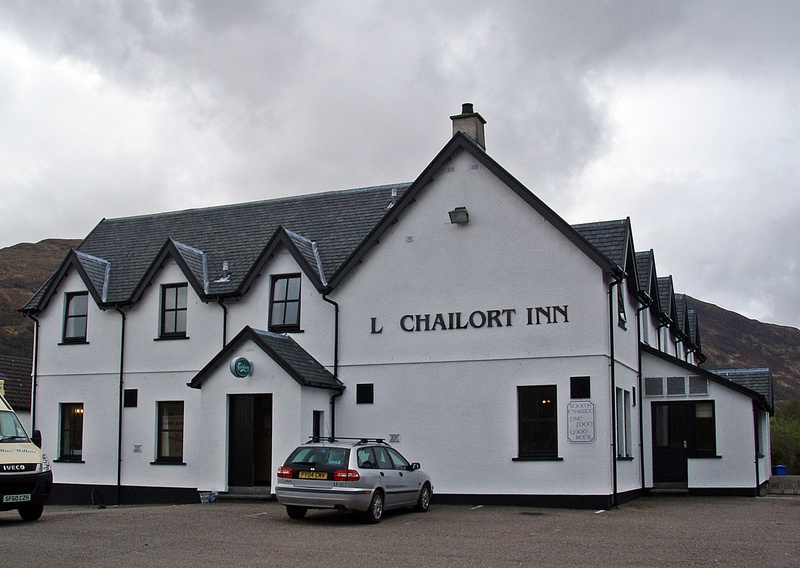 The bus driver dropped me off outside the Lochailort Inn at 09:40. On my way in, I met my first fellow Challenger for this year, first-timer Stuart who was heading to Oban bothy. 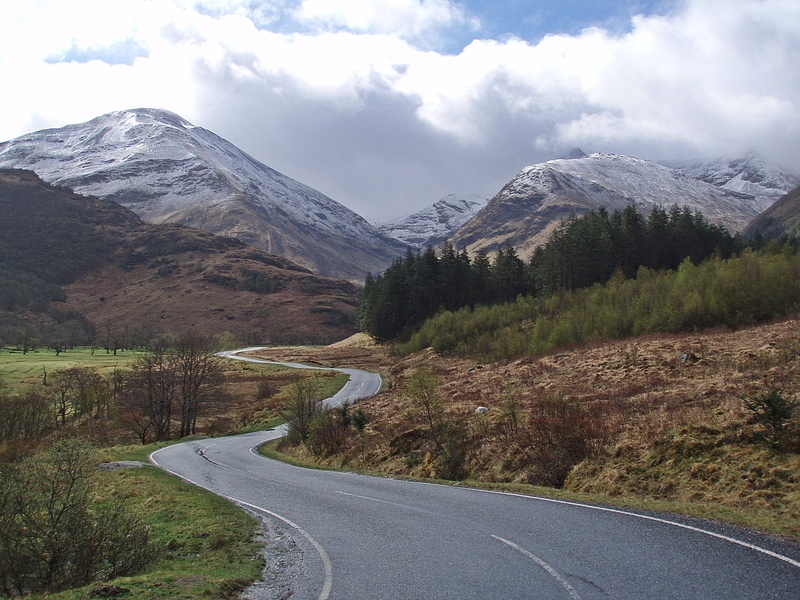 After a brief chat with him I signed out, did a bit of re-packing, put my gaiters on and finally set off at 10:00 along the A830. At Arieniskill I left the road and followed the path along the Allt na Criche. I had had breakfast at home at 05:00, but now I was getting hungry again and stopped for a short break. 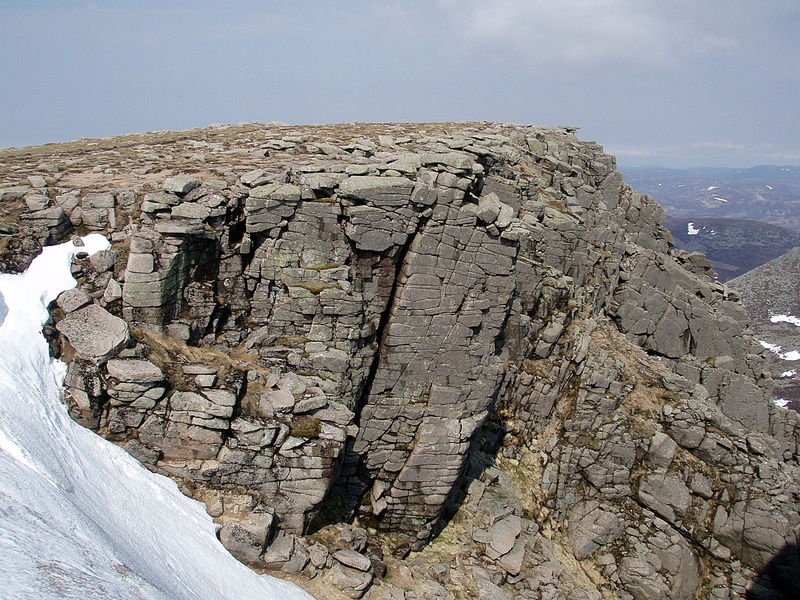 I had walked this way before, and was aware that I had drifted off too far E. A quick check with Viewranger confirmed that I was heading towards Prince Charlie’s Cave, a route that is not recommended as it leads into very steep and bouldery terrain. 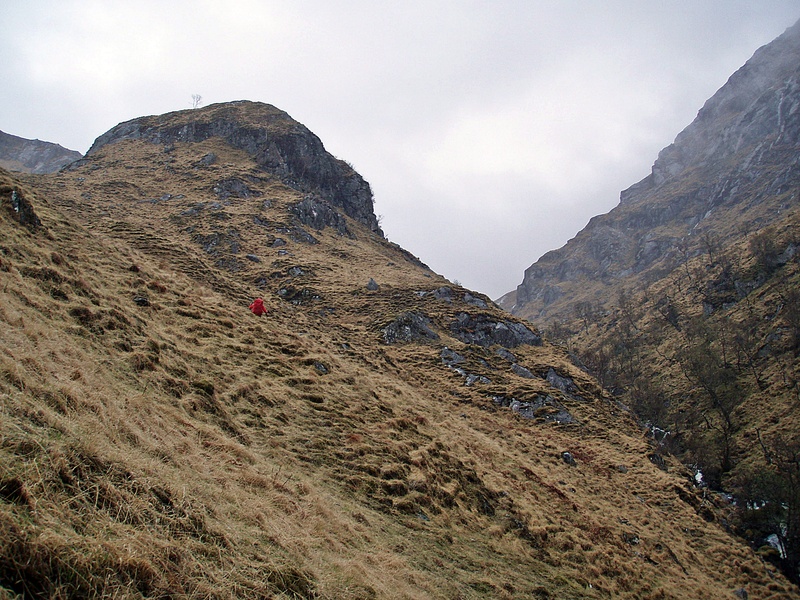 When I corrected my route W towards the higher path, I noticed a walker in a red jacket on a rocky outcrop ahead of me, presumably another Challenger checking out a descent route to Loch Beoraid. 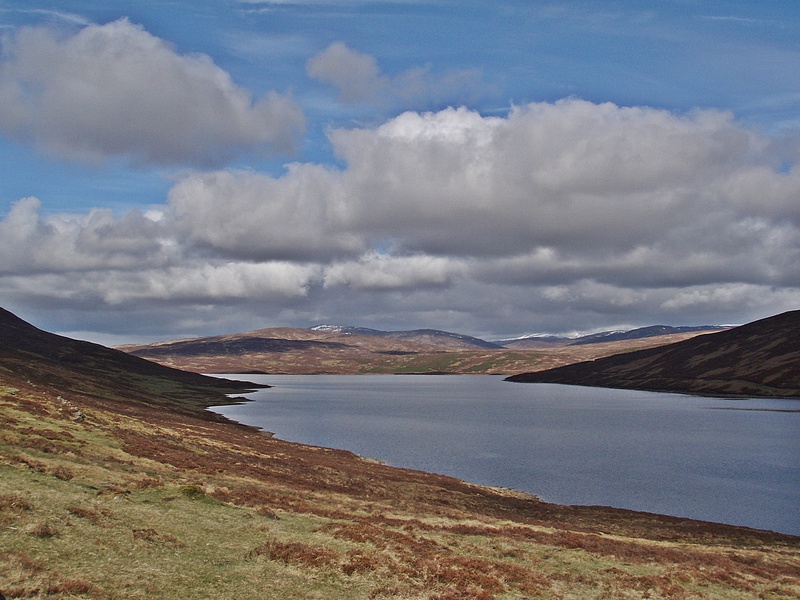 After I had found the right path again and walked on it for a few hundred metres, I had to leave it and find a way down to the loch. 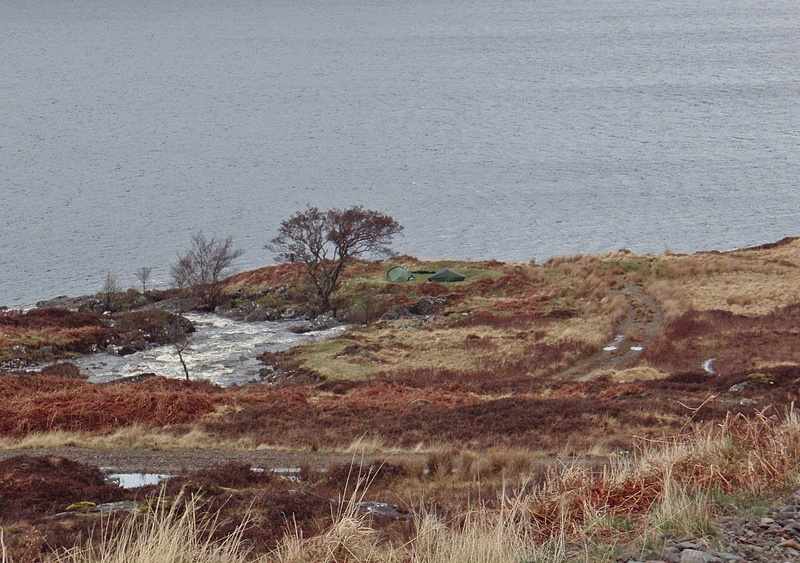 While I followed a stream to the footbridge between Loch Beoraid and Lochan Lòn a’ Ghairt, I could see a group of three walkers, one of which I had seen earlier (wearing the red jacket), taking a break by the boathouse at the end of the track. 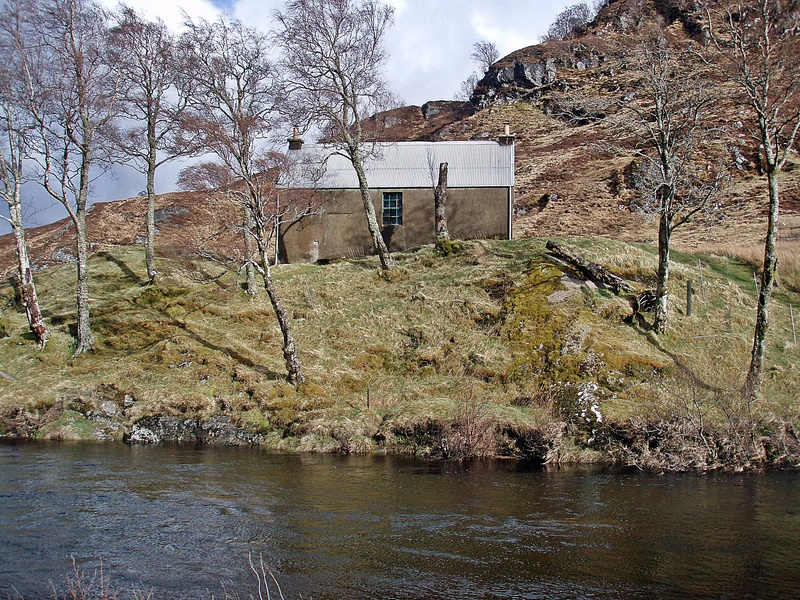 I reached the boathouse at 13:00, but the other walkers had left shortly before I arrived. In the meantime there had been a few drizzly showers, but from now on it kept raining continuously for the rest of the day. 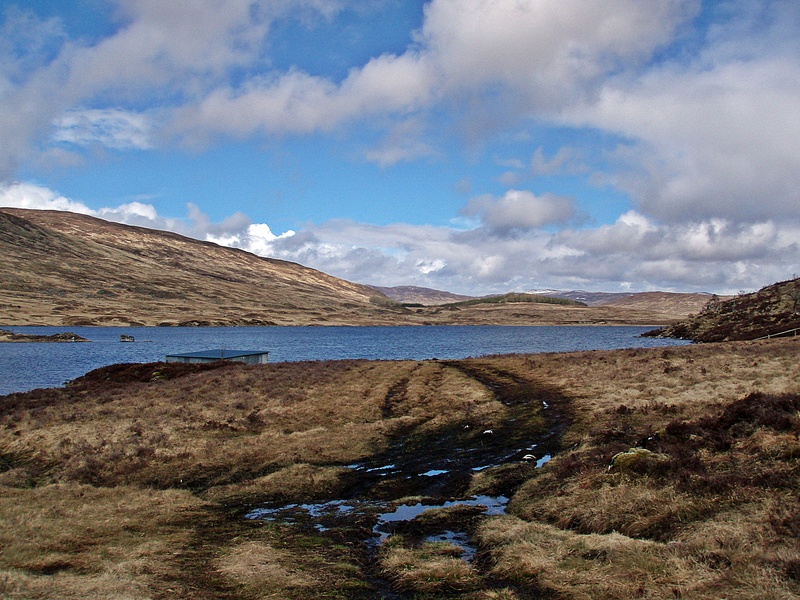 After another short break I started walking along the path on the N bank of Loch Beoraid. In opposite to various trip reports I had read, there is actually a continuous path, although it is very boggy in places. 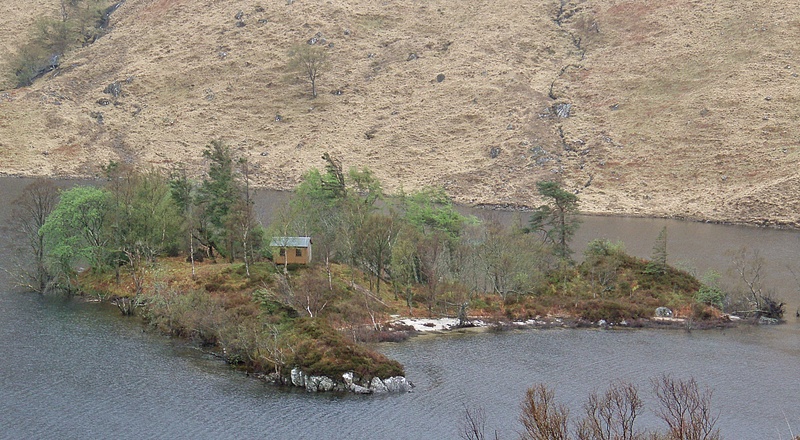 Small island in the loch. Last year, the first one of my boots started leaking on day 3, but this year they really excelled themselves: My left boot let water in at around 14:00 (that’s four hours into the walk!) and the other one less than an hour later. 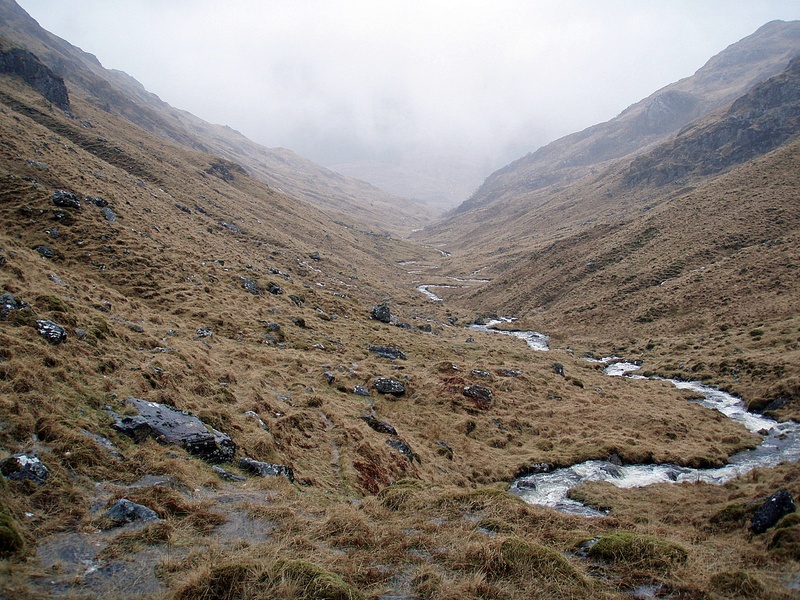 And at that stage I had not waded through any streams yet, it was really just water from the soggy terrain and the rain from above. 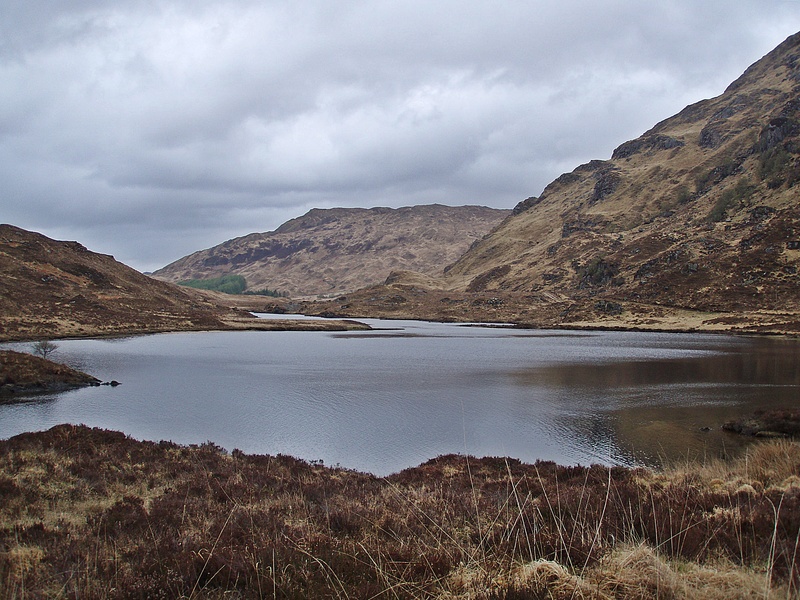 It took me three hours to walk the length of the loch, and I arrived at Kinlochbeoraid at 16:00. From the distance I saw someone collecting water from the river, and it turned out to be Andy, the Challenger in the red jacket who had stopped for a break in the ruined building. I was glad to find some shelter from the rain and joined him. 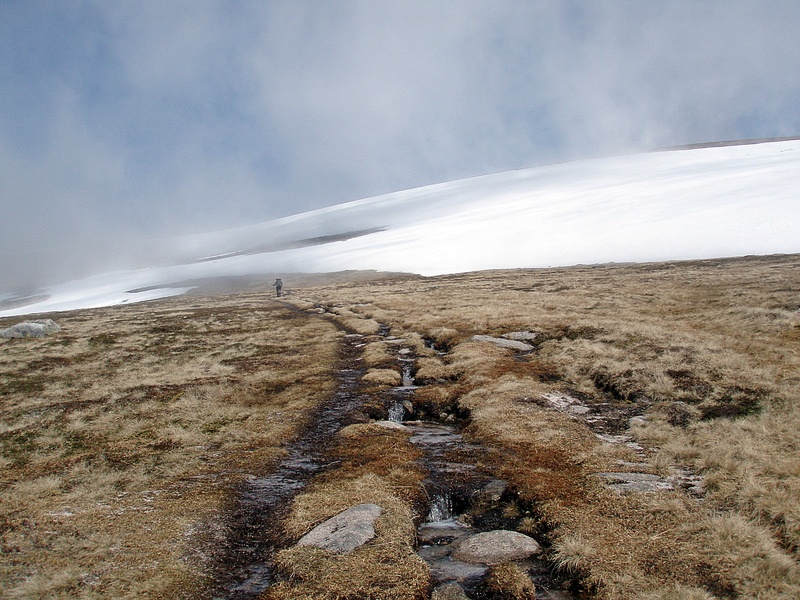 Andy was planning to follow the path into Coire Odhar Mòr, camp somewhere along the way, and climb Sgùrr nan Coireachan and Sgùrr Thuilm the next day. After my break, I continued on the path behind the house, but in hindsight I should have probably forded the river right in front of it, because it was shallow and slow-flowing. 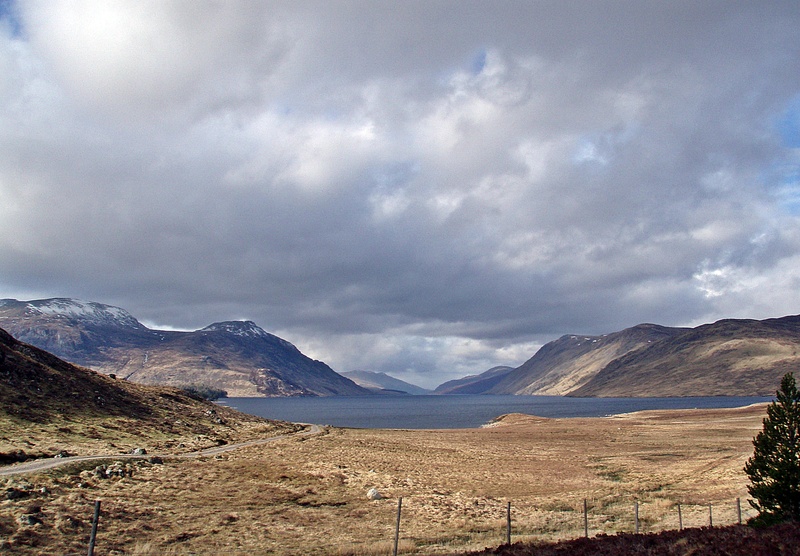 Looking back to Loch Beoraid. 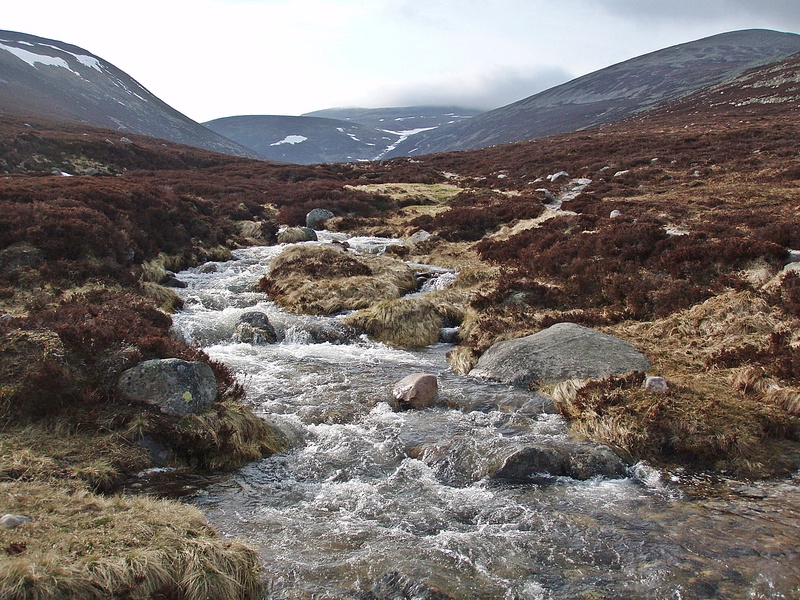 When I reached the Allt a’ Choire, I didn’t even consider changing into Crocs because my boots were soaked already anyway. 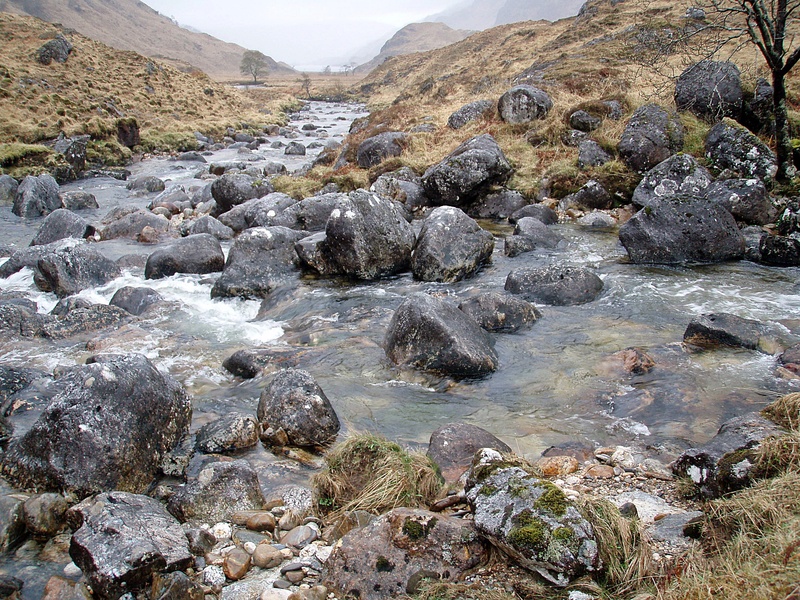 I forded the river carefully and slowly, as it was fast-flowing, a bit more than knee-deep, and the large rocks in the river bed were quite slippery. Shortly after the ford I met Keith and Charlie who had stopped for a bite to eat. 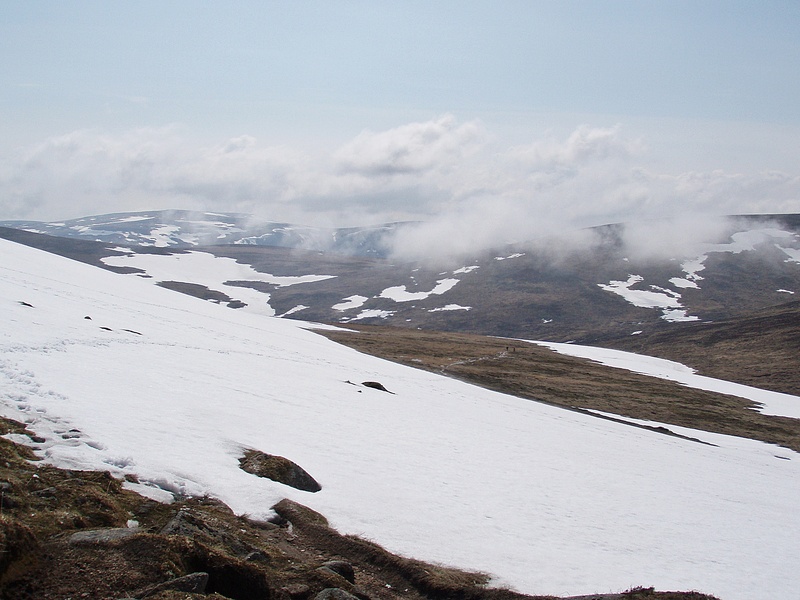 They had walked over the hills which must have been quite strenuous in these conditions, and were now heading to Corryhully bothy for the night. While we were talking, we were caught up by Andy who had changed his mind and was now also on his way to Corryhully. 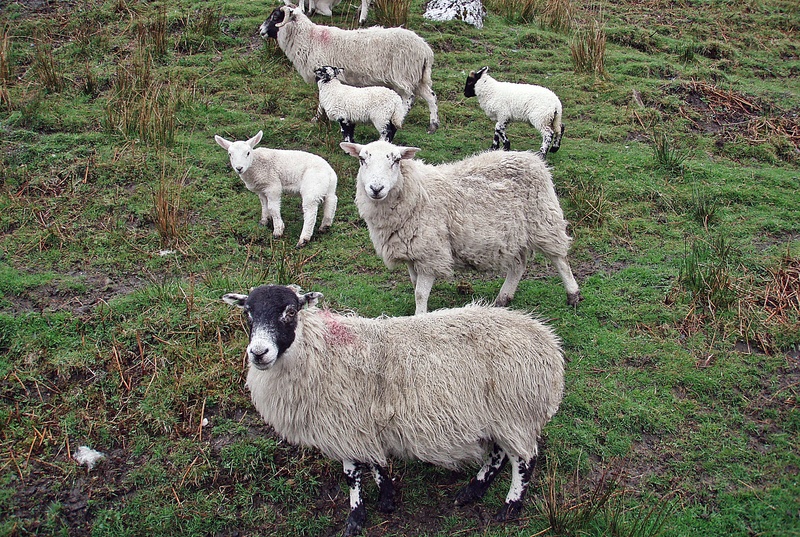 I was starting to feel cold and said my goodbyes to the others, but they soon followed and we all headed up Gleann Donn. 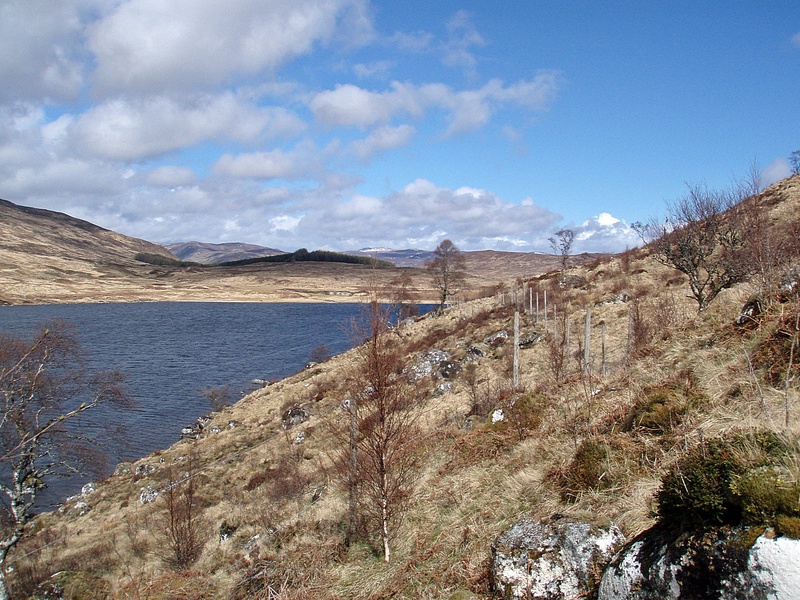 View back to the loch. 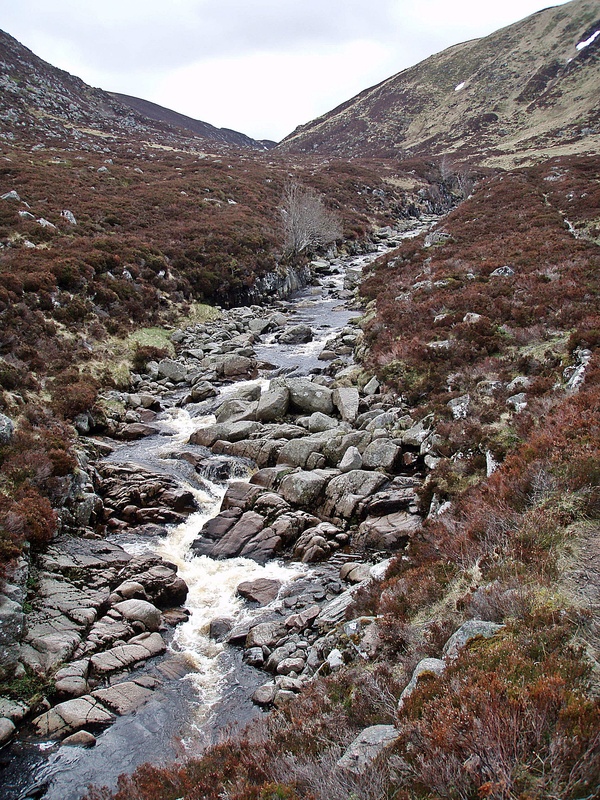 Further along the glen, the Allt a’ Ghlinne Dhuinn flows in a narrow gorge and we had to climb up the steep slopes on its N bank to continue on higher ground. 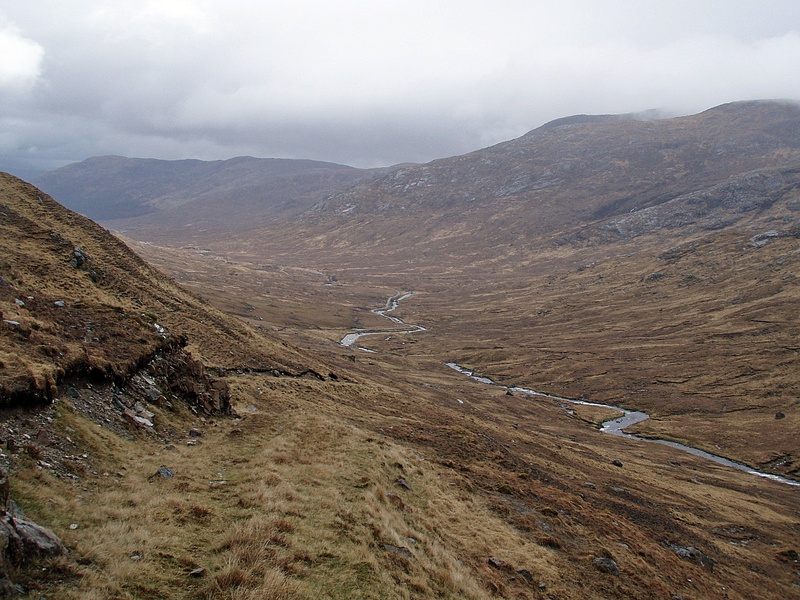 On reaching the bealach, Andy had already disappeared into the distance, whereas Keith and Charlie had fallen behind. 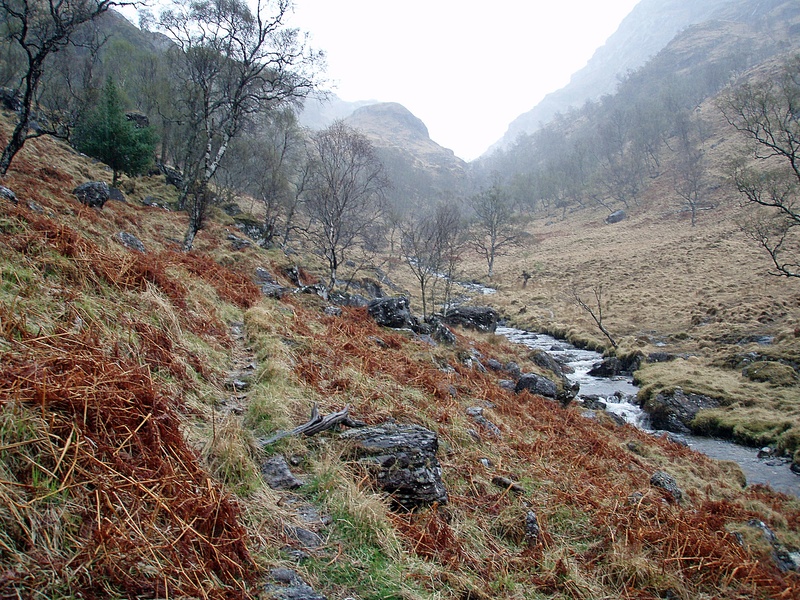 The terrain was waterlogged and I was hoping the going would become easier once the path further down the glen was reached. 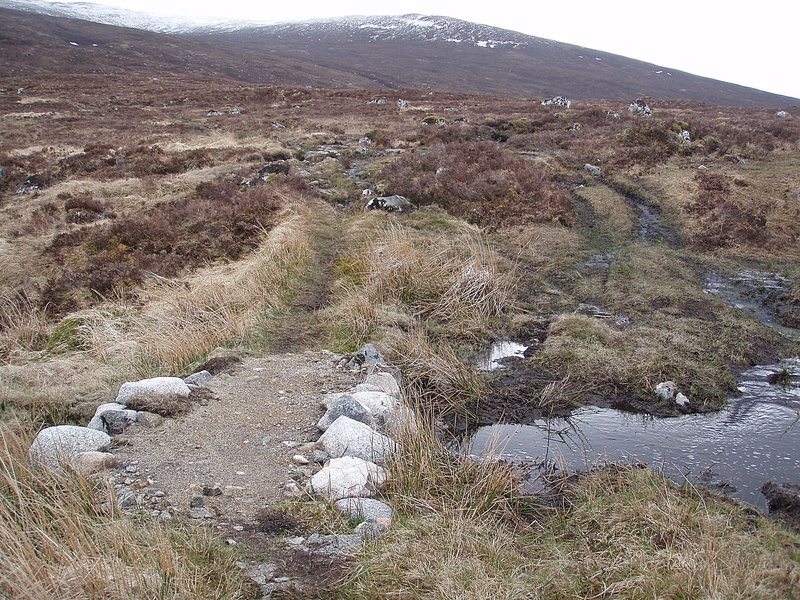 The “path” didn’t really make much difference, and some of the tributary streams of the Allt a’ Chaol-ghlinne that had to be forded, were ankle-deep. 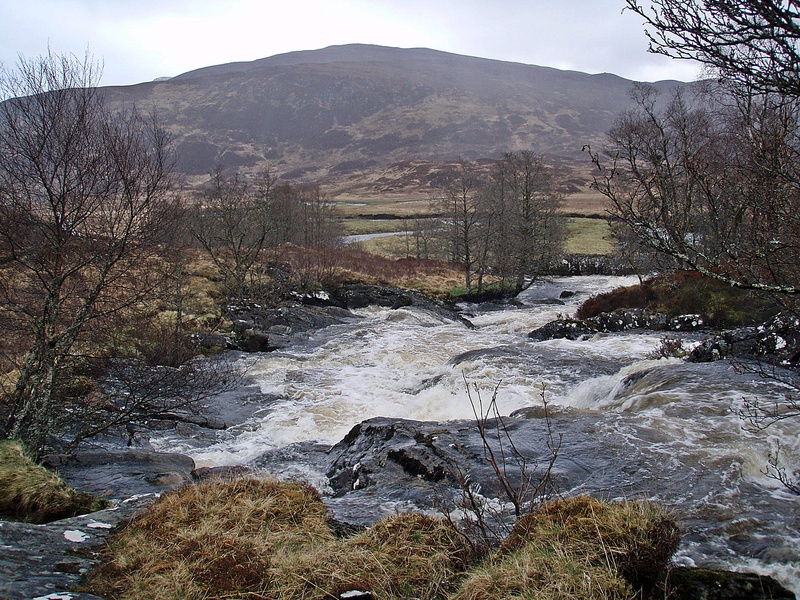 The raging Allt a’ Chaol-ghlinne from the bridge near Corryhully, Keith and Charlie just visible at the top of the track. 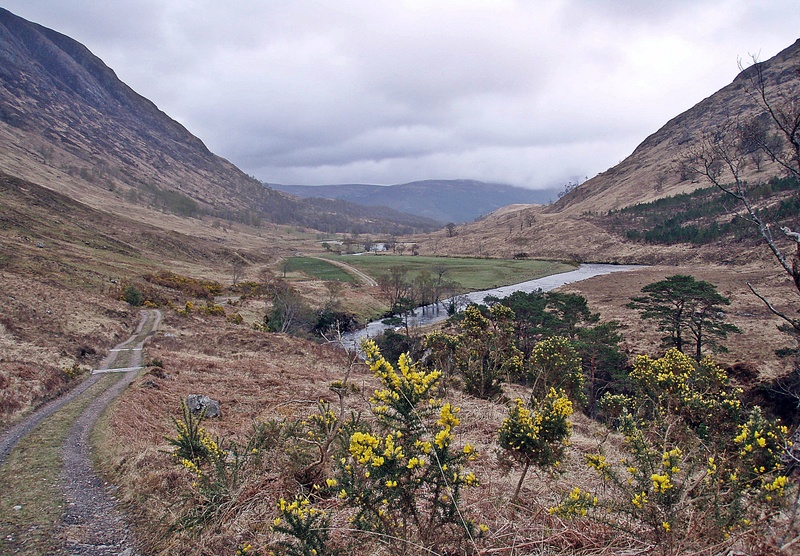 I turned S onto the single track road through Glen Finnan, looking out for a camp site. 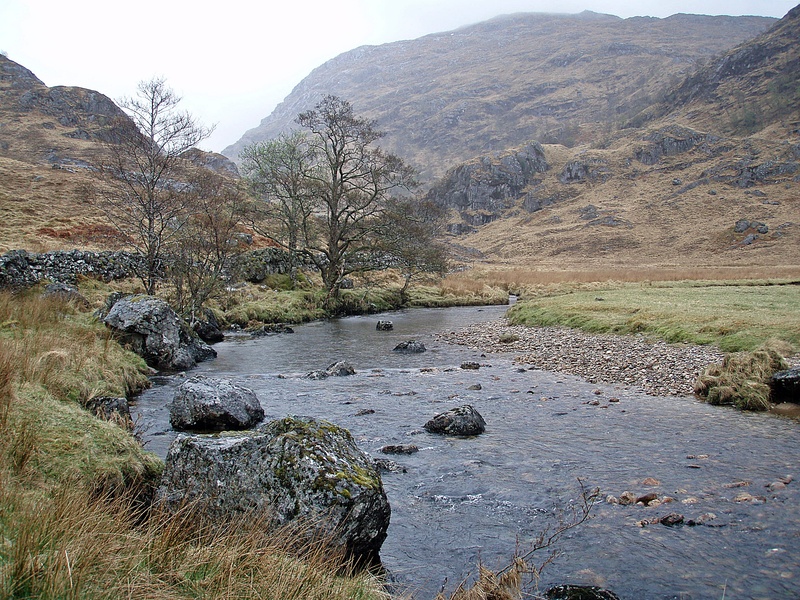 On my last walk along here at Easter I had checked out a few good camp spots, but they were all close to the River Finnan and would be far too noisy in these conditions. In the end I settled for a pitch under some trees right beside the road (which I would normally avoid), but at least it was sheltered and far enough away from the raging river. After I had been lying awake since 05:20, I finally resigned to the fact that I couldn’t fall asleep again. Instead I had a leisurely breakfast, took my time to get ready, and was on my way at 08:00. I crossed the road and followed the boardwalk across the Callop River. 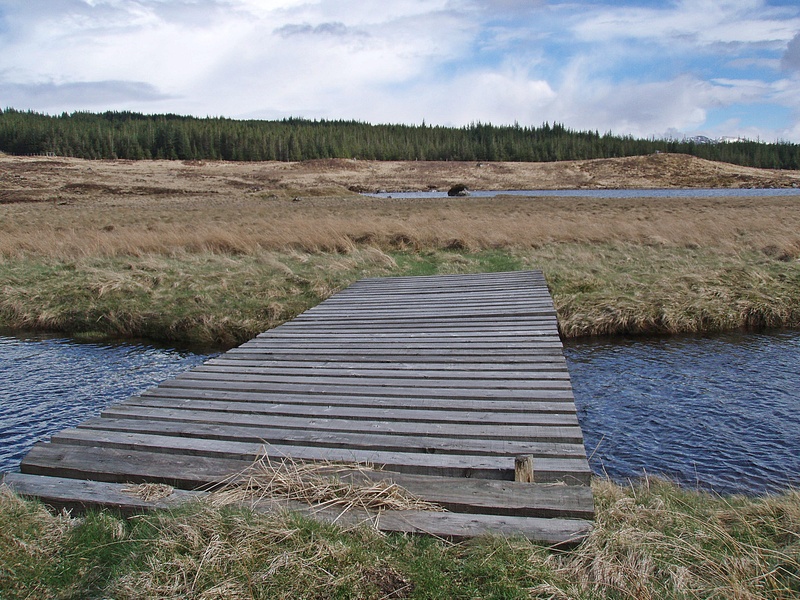 The boardwalk joins a former quarry road along the river, and then leads towards Callop. 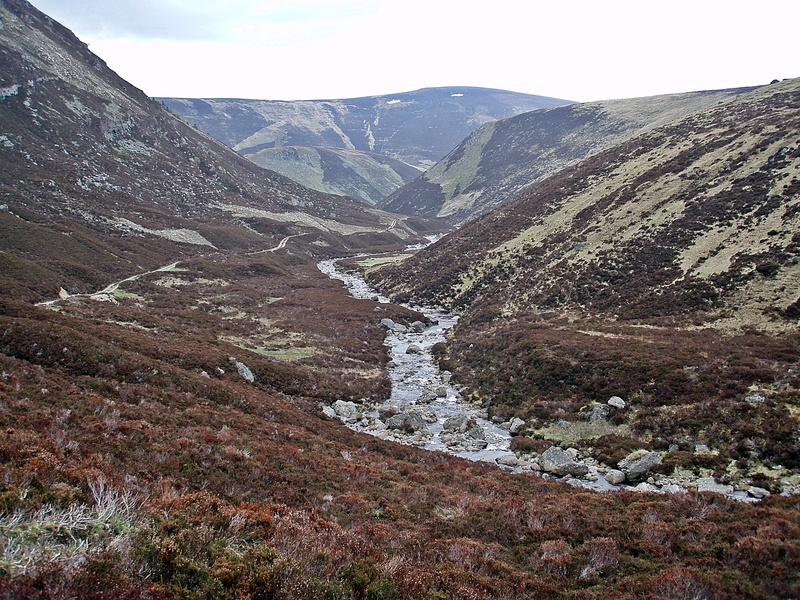 I walked up the track past the farm and along the Allt na Cruaiche. 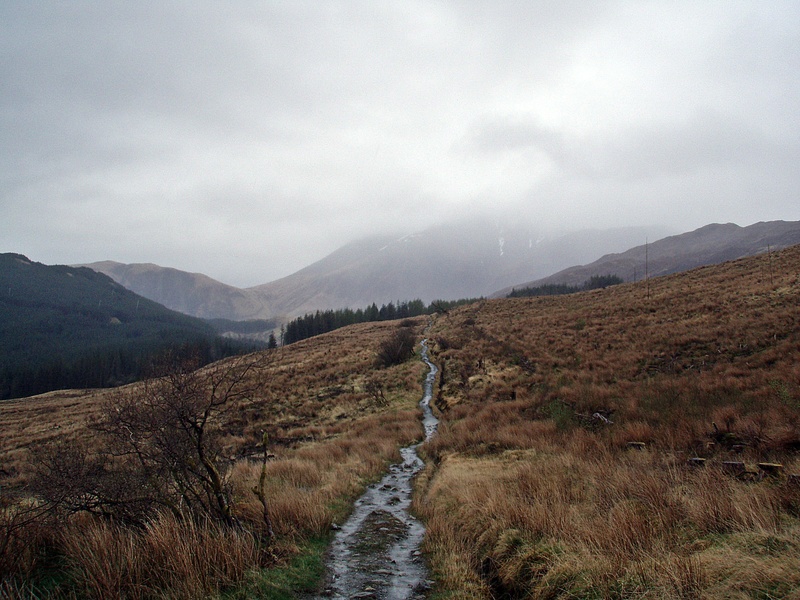 At the end of this track, a very wet and boggy path continues up the hillside and leads all the way to the head of Cona Glen. 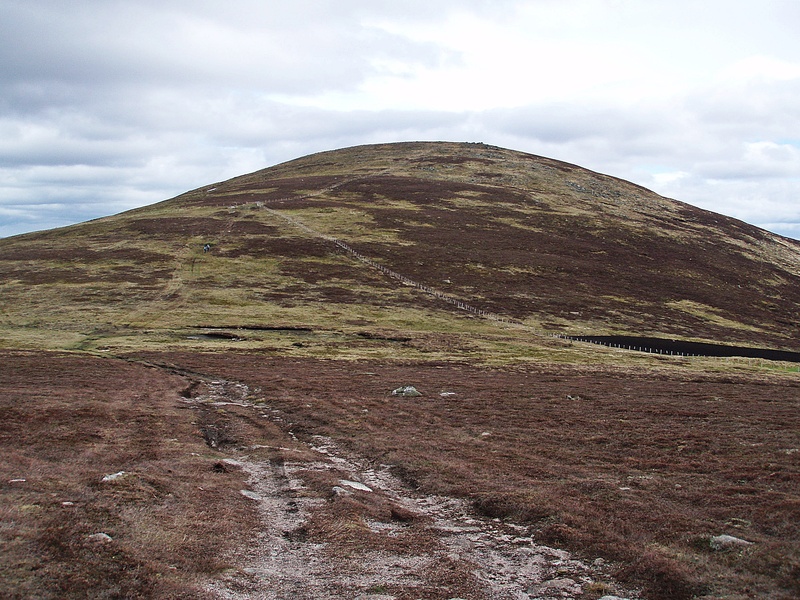 During this part of the walk I was caught up and overtaken by a group of six hillwalkers, but they were on a day walk and not on the Challenge. This section seemed endless (the fact that it had been raining for the last few hours didn’t help), and I was glad when I eventually reached a good track again leading into Cona Glen. 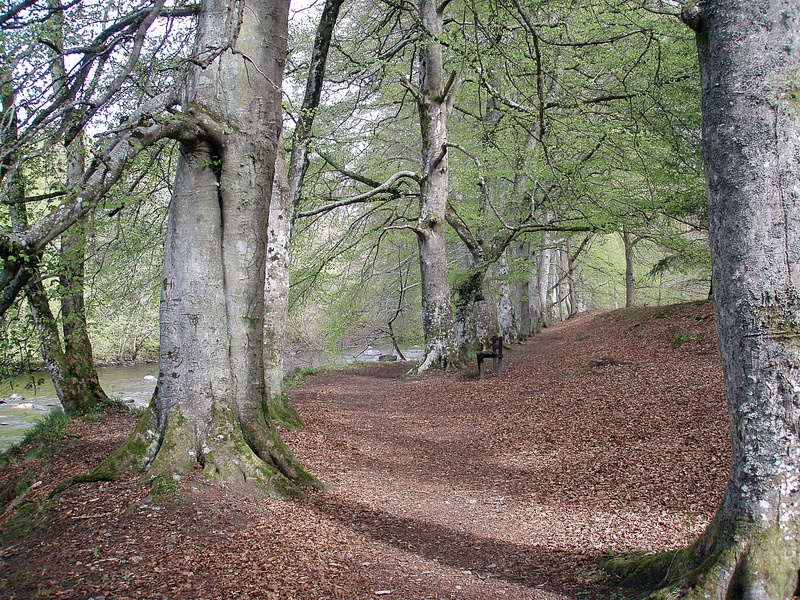 At the bottom of the glen, the track improves and becomes almost a road with a gentle incline, the surface resembling some kind of soft yellow loam/sand. With every step, I sank in about a centimetre deep, but I could still walk a lot faster than on the waterlogged path earlier on. But all of a sudden, my left foot sank into an ankle-deep hole. I fell forward, rolled to my side and ended up lying on my back like a turtle, unable to get up. I was glad no one had seen my fall – it must have been hilarious to watch, and when I realised I had not hurt myself, I couldn’t help laughing about it. After freeing my hands from the trekking pole straps and undoing the rucksack straps and hipbelt, I managed to get up. 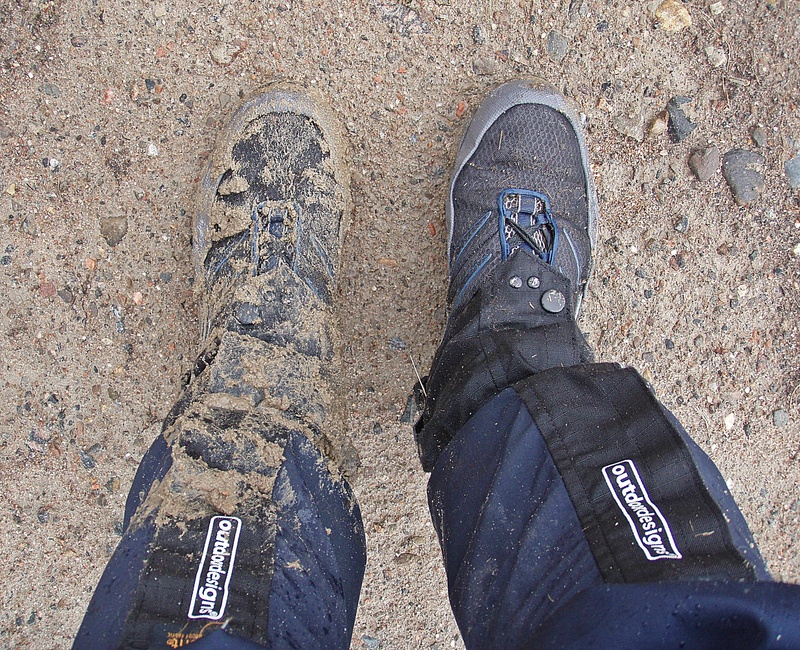 I could brush off the dirt from my jacket and trousers, but my left boot and gaiter looked a bit messy. Instead of washing them in a stream, I thought I’d better let the sand dry and brush it off properly when I got to the bunkhouse in the evening. 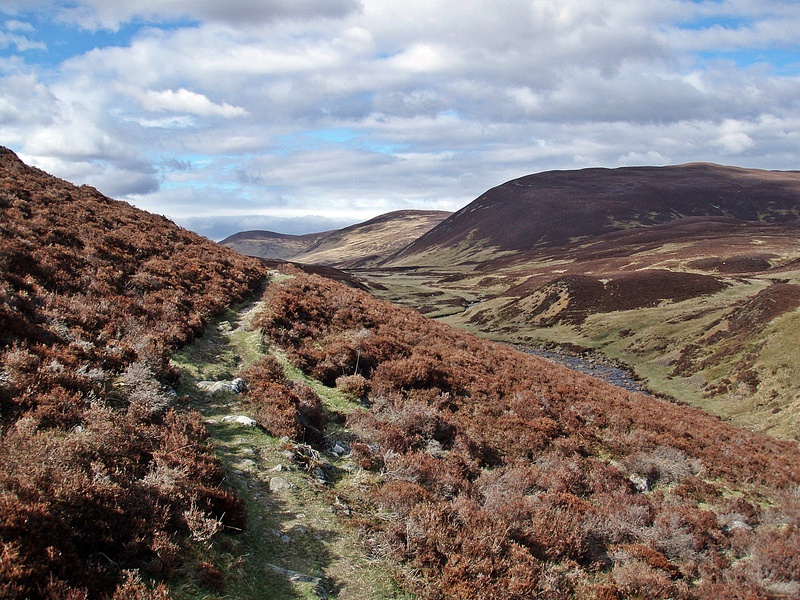 Approaching the end of Cona Glen. 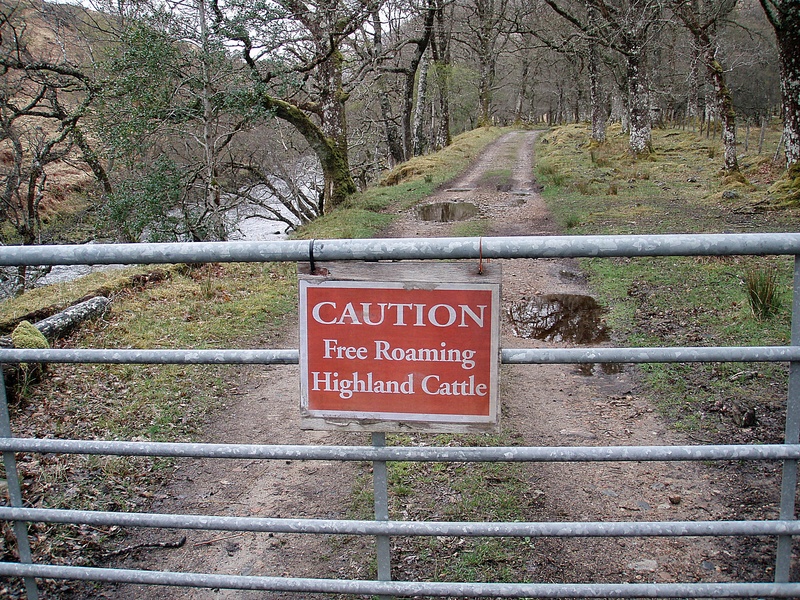 Shortly after, I reached this gate and when I closed it behind me, I saw this warning sign – just as well, because if I had seen it on my way into the glen, I would have probably turned back! 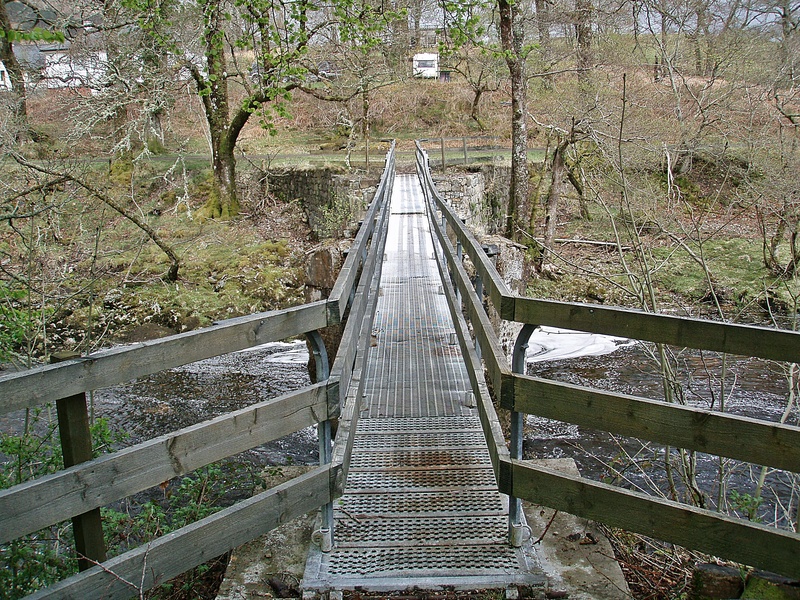 Near Aryhoulan I came across a footbridge that’s not marked on the Landranger map, I used it as a shortcut that saved me a few hundred metres detour to the main road. It had stopped raining some time earlier, and now even the sun came out. 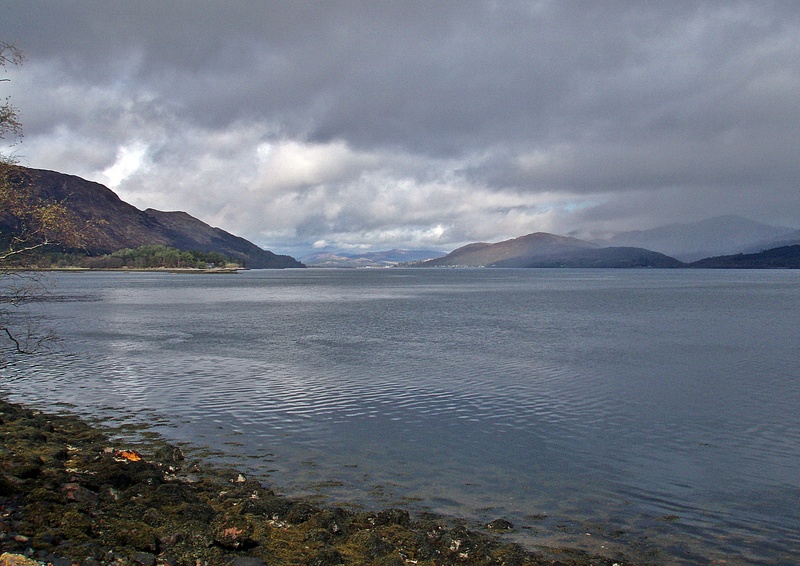 It was warm and sunny by now, and I enjoyed the walk along the bank of Loch Linnhe – but with it being a road walk, my left ankle was beginning to hurt again. I tried to walk on the grassy verge whenever possible, which helped a bit. 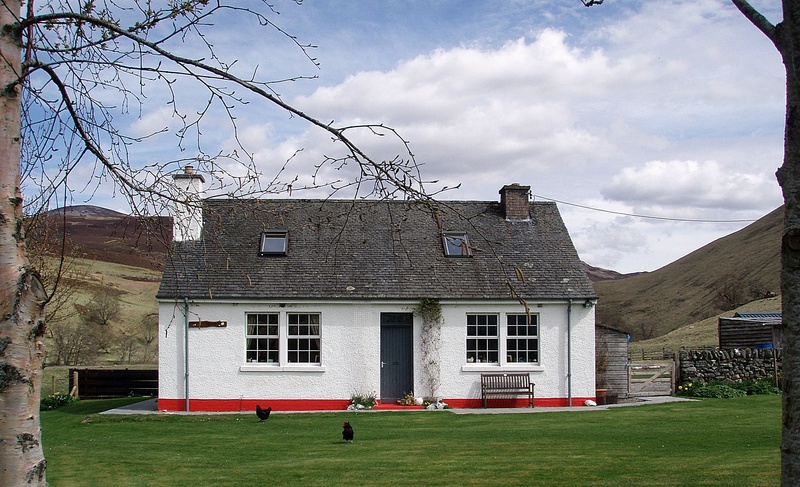 I had booked an en suite single room at the Corran Bunkhouse, and had planned to have a bar meal at the Inchree Centre nearby. 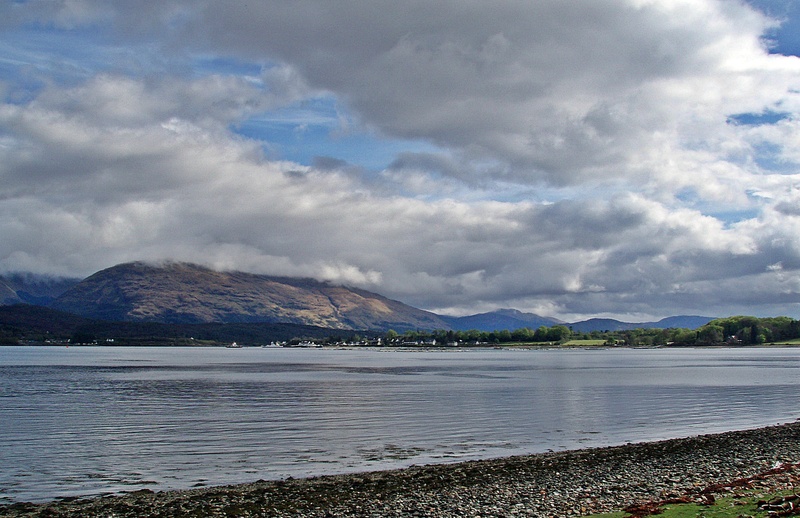 But when I approached Corran, I thought I might as well have dinner at the pub and then have a quiet evening relaxing at the bunkhouse. 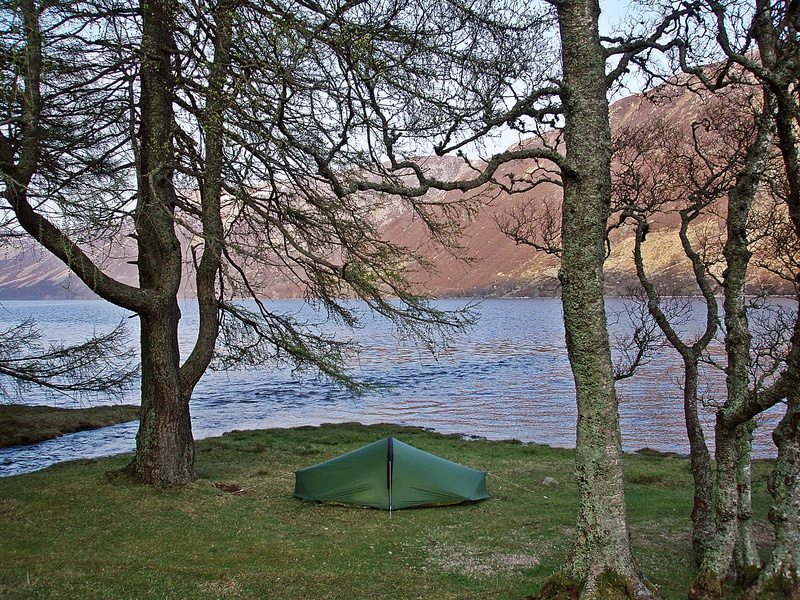 Under the trees outside the Corran Inn I noticed a couple of tents, and I assumed they must belong to Challengers. And so it was, at the bar I met Alan who had vetted my first Challenge route in 2011, and his walking companions Rod and Bernard. It was 17:15 now and after ordering a pint of cider, I was delighted to hear that bar meals would be served from 17:30. 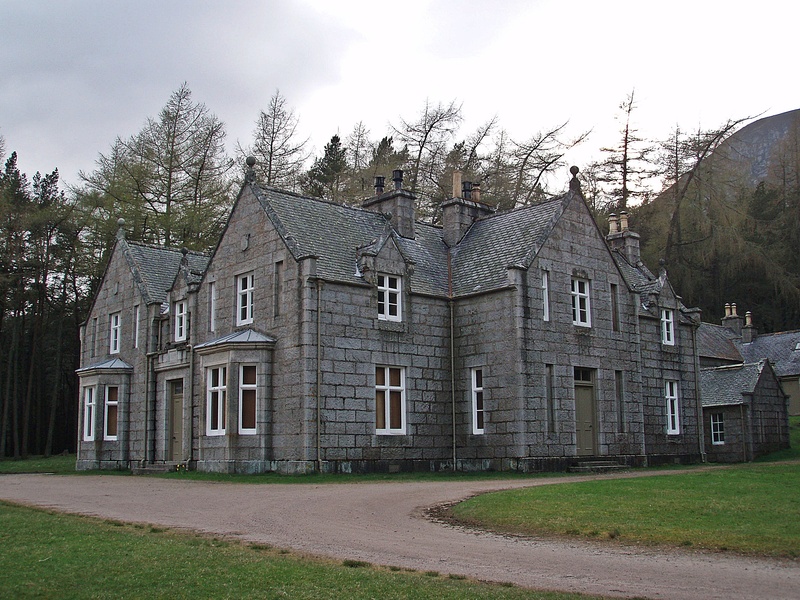 I made a quick phone call to the bunkhouse to let them know I would arrive later than 18:00 (just to make sure they would not give my room away in case it got busy on a Saturday evening). We found a table and discussed our respective routes, and I got some very useful advice about my planned route through the Fetteresso Forest. Then it was time to order some food, I had a prawn and apple cocktail, followed by scampi & chips. Later we were joined by Adrian, another Challenger I remembered from 2011. After another cider I took the ferry which is free of charge for foot passengers, and checked into the bunkhouse. First I had a shower, then I spread out various wet/damp clothes over the radiator and elsewhere in the room, and put my tent, shoes and gaiters into the drying room over night. Then I spent the rest of the evening with a hot chocolate and some biscuits, lying on the bed and checking the weather forecast, the TGO Challenge message board etc. on my smartphone. Downstairs in the kitchen I met Laura, and we had breakfast together. 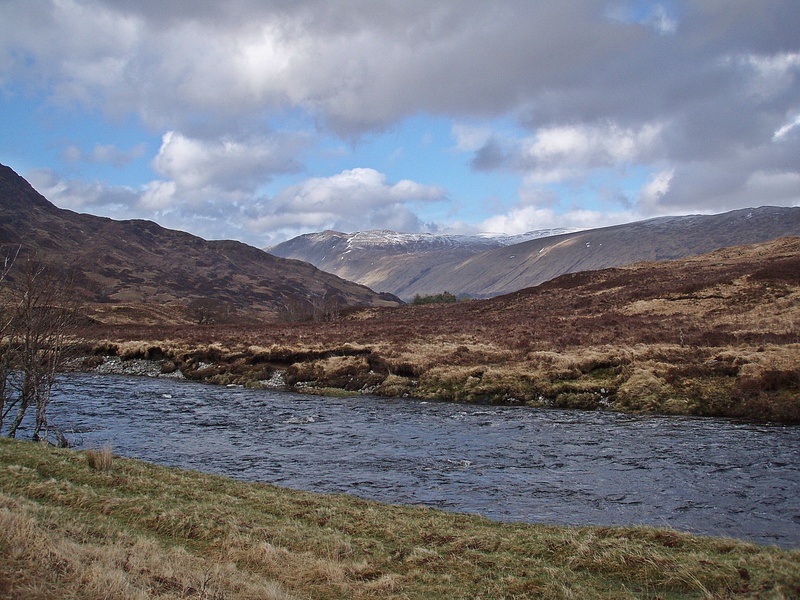 She had started from Acharacle and was heading to Kinlochleven today, but after she had twisted her knee during a fall in Glen Gour the previous day, she had decided to walk along the road instead of the WHW. My tent and my boots were nearly dry after a night in the drying room, and after cleaning my gaiters with a hand-brush I had found in the kitchen, they looked almost civilised again. 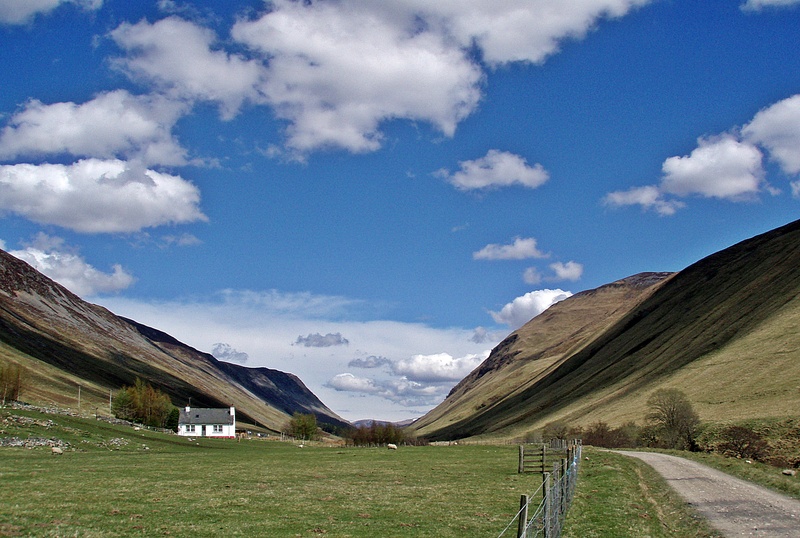 When I left the bunkhouse at 08:30, the weather was dry and quite warm. 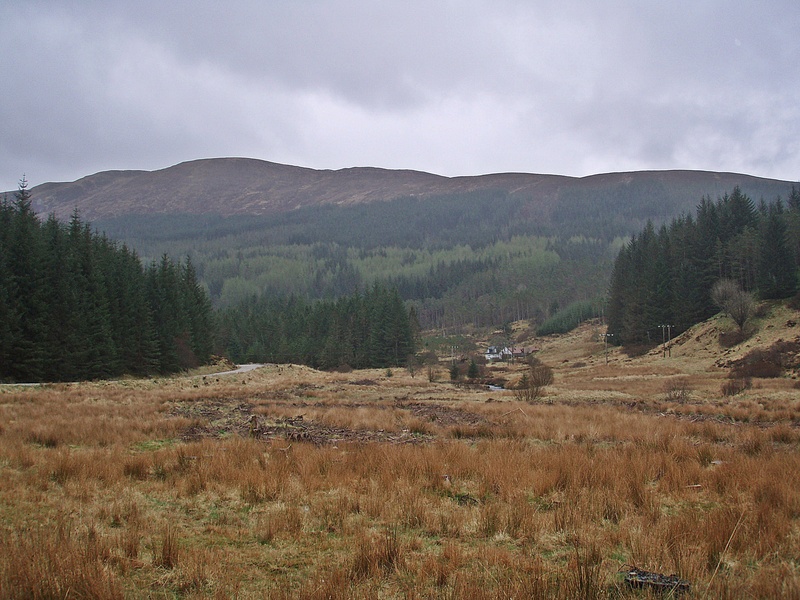 At Inchree I took a shortcut from the road past some chalets and the restaurant into the forest, and soon I was on the track into Gleann Righ. 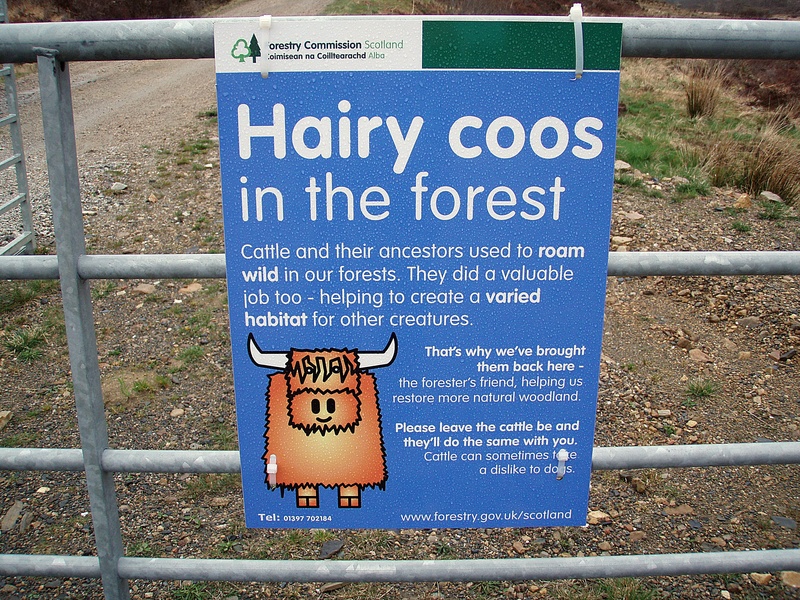 I passed another worrying sign at a gate, but thankfully I didn’t see any “Hairy coos”! 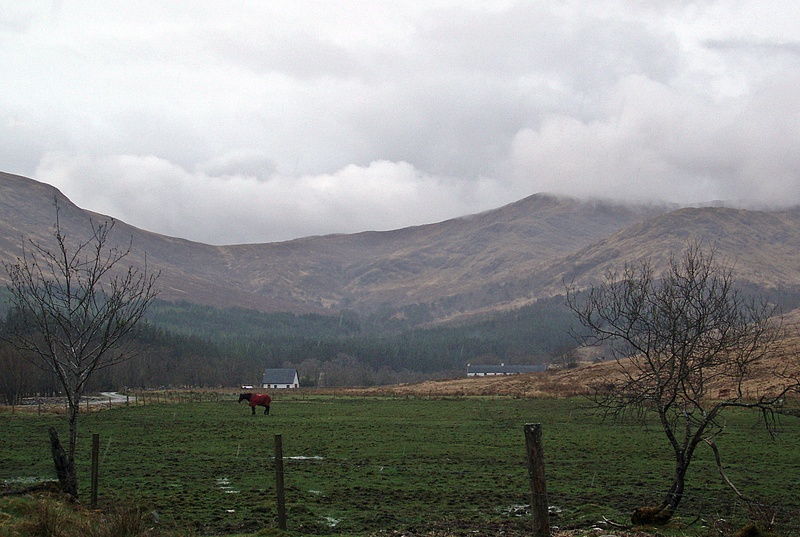 It had started raining by now, and walking on a gravel track, I didn’t find the glen very inspiring. At the edge of the forest I climbed over a stile and followed a path/sheep track over some heathery lumps towards Lochan Lùnn Dà-Bhrà. 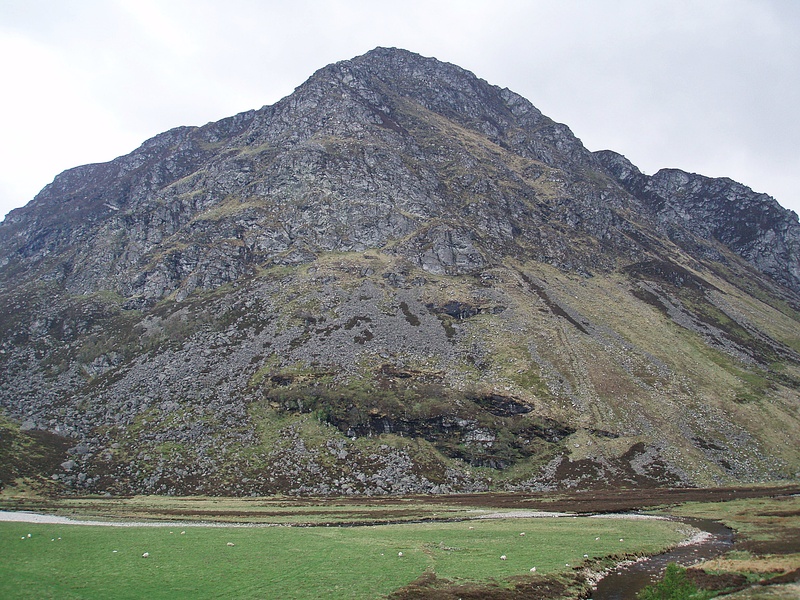 Here I was caught up by Adrian who was also on his way to Kinlochleven, and after a quick chat I soon lost sight of him. I joined the WHW and took shelter from the wind and rain behind an information board, to have a quick snack. From now on I had walking groups of various sizes behind and in front of me. 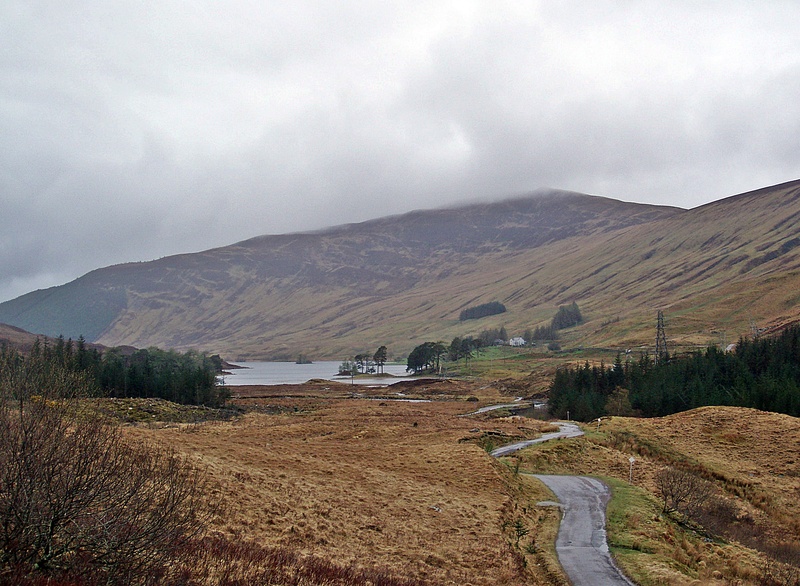 The weather was miserable – cold, wet and windy – and I just wanted to get to Fort William as quickly as possible. I had booked a bed at the YH, but when I arrived it was too early to check in. The YH assistant, although being busy cleaning the hostel, was very helpful and showed me a back room where I could leave my rucksack and trekking poles. First I phoned Challenge Control, then I called a taxi to take me to the town centre. After some shopping for supplies, I got another taxi back 😳 (with a long, hard day ahead of me tomorrow, I just couldn’t face any more road walking). 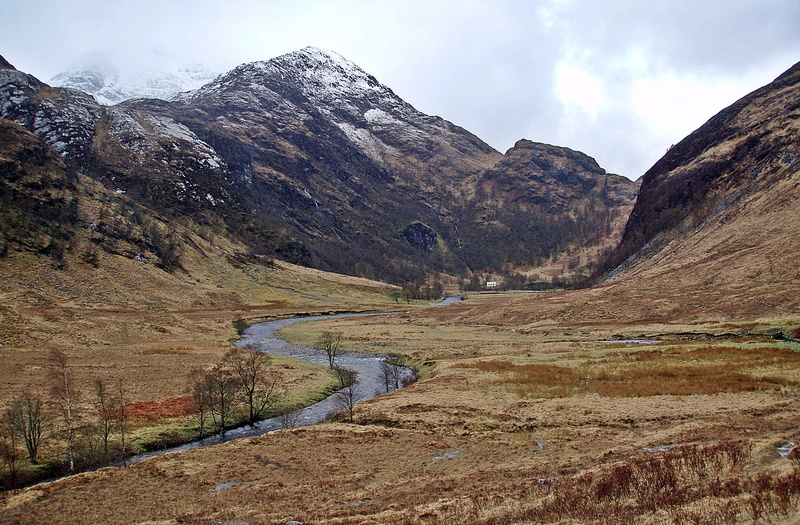 I checked into the hostel, had a shower, washed some clothes and walked a few minutes down the road to meet some friends in the Glen Nevis Bar. Dunja arrived just after 18:00, followed by Alex and Howard a short time later. The three of them had met in May last year when they all joined an MBA work party at Shenavall bothy, and Dunja and Alex had also been in Inverie over Hogmanay, but I had not met Howard before. We had a nice evening with interesting conversations and good food (although I was devastated to find out that the haggis – which I had been looking forward to – had been taken off the menu, allegedly due to the lack of demand!? ), and were later joined by Alan, Rod and Bernard (and a fourth Challenger in their group) at a table nearby. They were staying at the camp site, so did Dunja, while Howard was also staying at the YH. We walked back to the hostel together, and I had a quiet night with only one other roommate in a 16-bed dorm, which was actually two rooms connected with an open doorway in between. I woke up at 05:30 and thought I had heard thunder (? 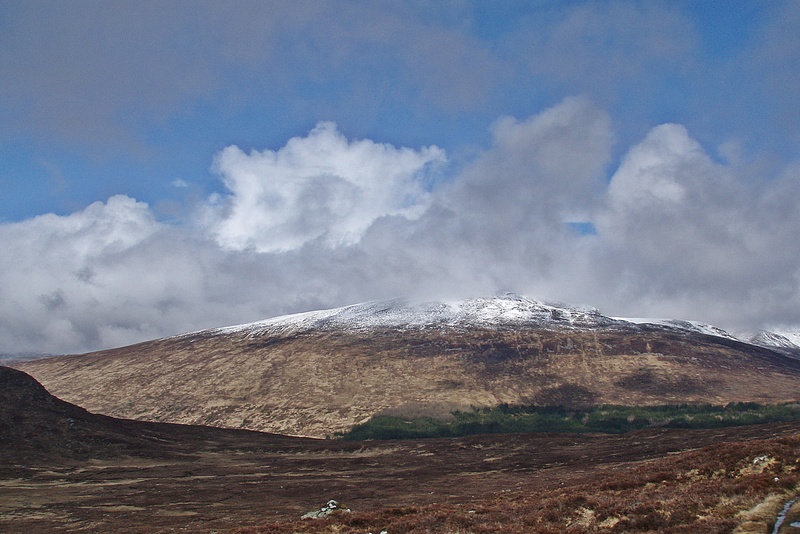 ), and later I saw fresh snow to a low level on Meall an t-Suidhe right outside my window. The evening before in the pub we had discussed the weather forecast (which was horrible) and the fact that there was still far too much snow on the ridges, and had already decided to walk through Glen Nevis instead. It took me a while to stuff all the food that I had bought into my rucksack, but somehow I managed, and went to the reception area to wait for Dunja. We had arranged to meet at 08:30, and when she didn’t turn up I thought she might just have changed her mind about walking with me today. After two attempts to call her mobile (which was switched off), I started walking towards the camp site at 09:05 to find out what was going on. 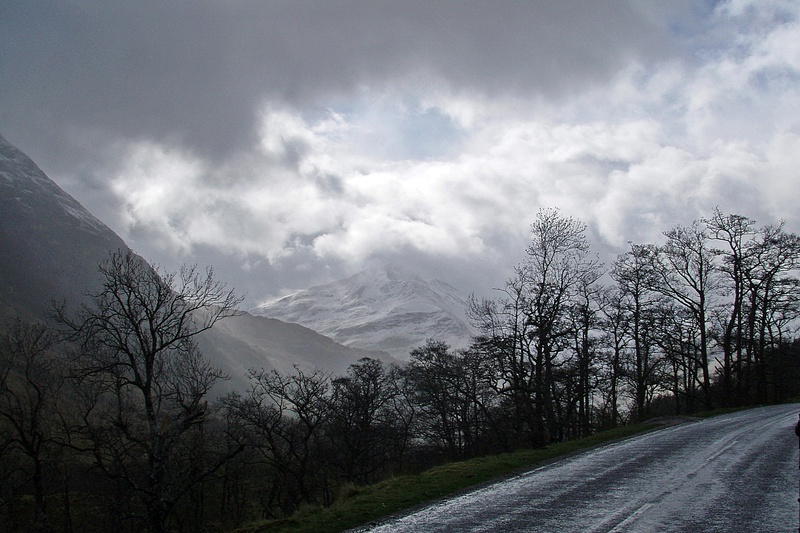 A few minutes later she came walking along the road, explaining that she had a very unpleasant, cold night in her tent with hail and snow showers, and it had taken her a bit longer to get ready in the morning. … but also some sunny spells. 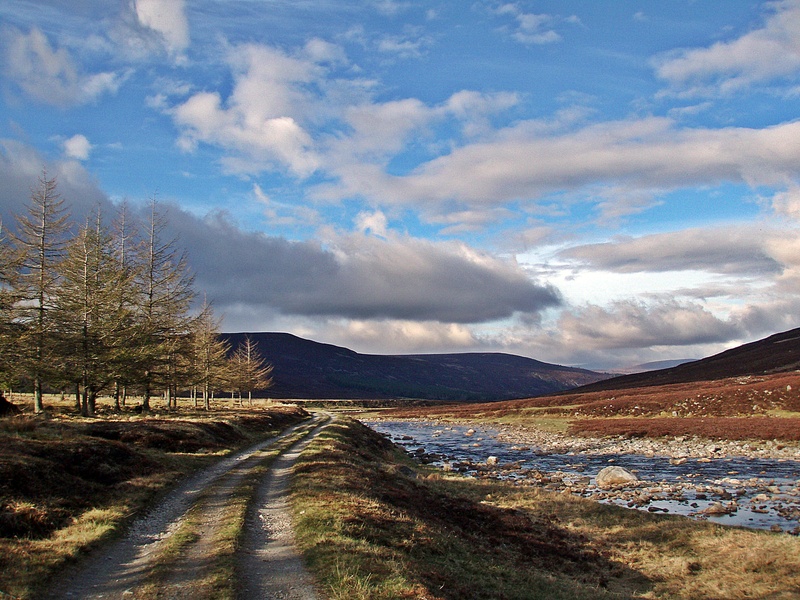 At Achriabhach we could leave the road and use the path along the river. I waited while Dunja went looking for a geocache at the Lower Falls. After she found it, we continued along the path. 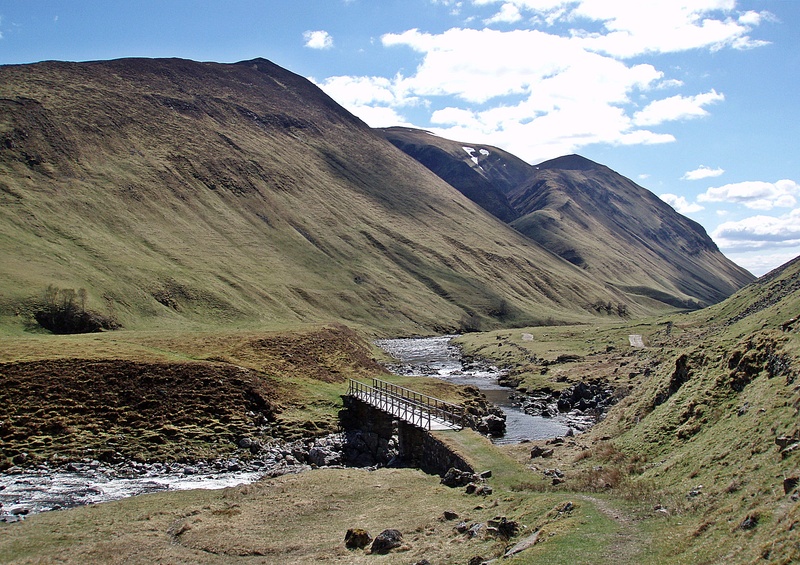 After crossing a footbridge, and another 20 minutes of road walking, we reached the car park at the road end and the start of the walk through the Nevis Gorge. 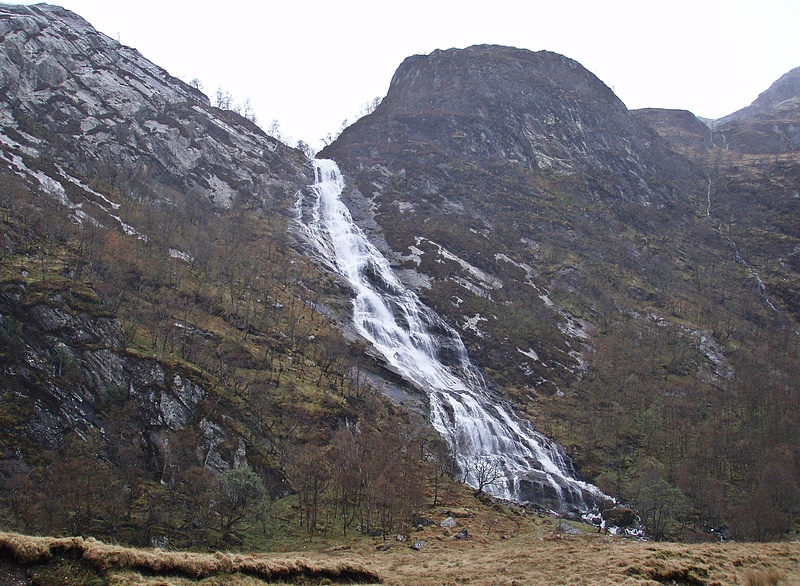 In spite of the weather, we met quite a few walkers on this section, and we soon arrived at the Steall Falls. 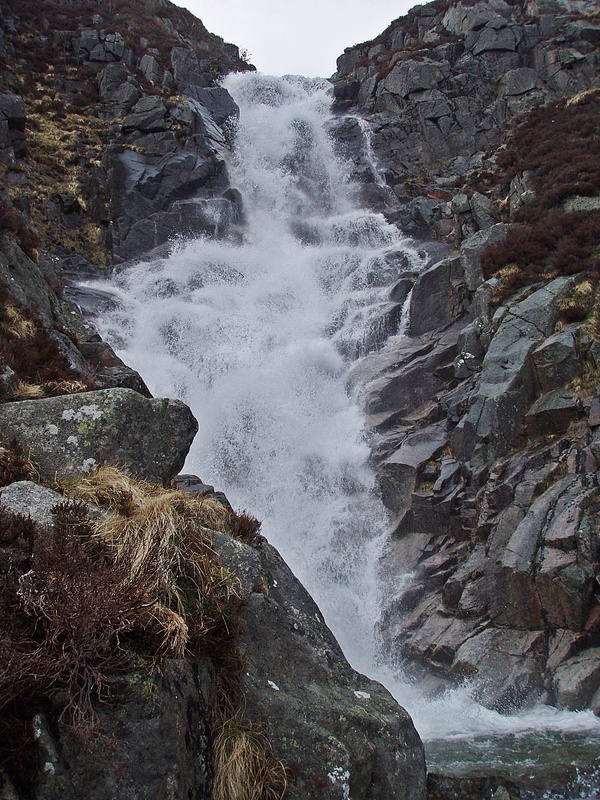 At least there was one advantage to the weather being so wet – the waterfalls were quite impressive! 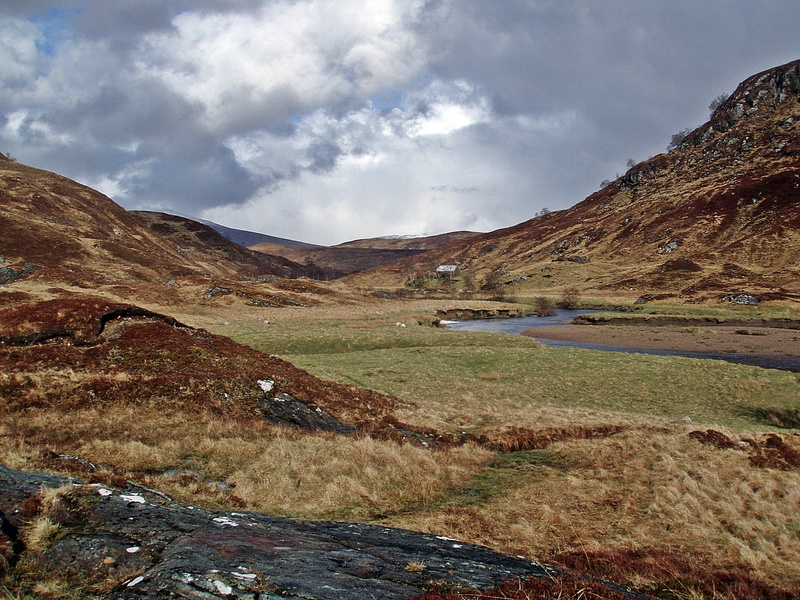 Looking back to the Steall Meadows. 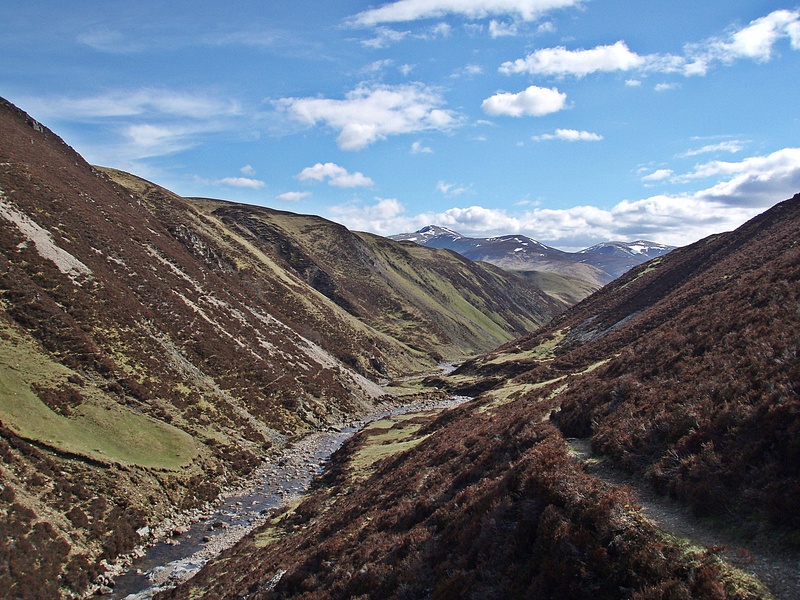 View W along the glen. 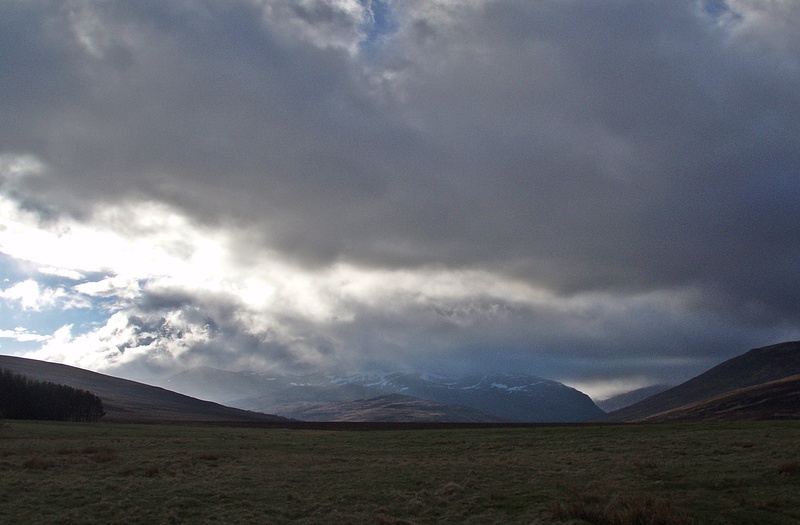 The weather was a wild mixture of rain/snow/hail showers and some sun in between, and a strong cold wind. The terrain was waterlogged, and apart from a five minute stop to have a quick bite to eat (taking advantage of one of the short spells without rain) we couldn’t take any proper breaks. 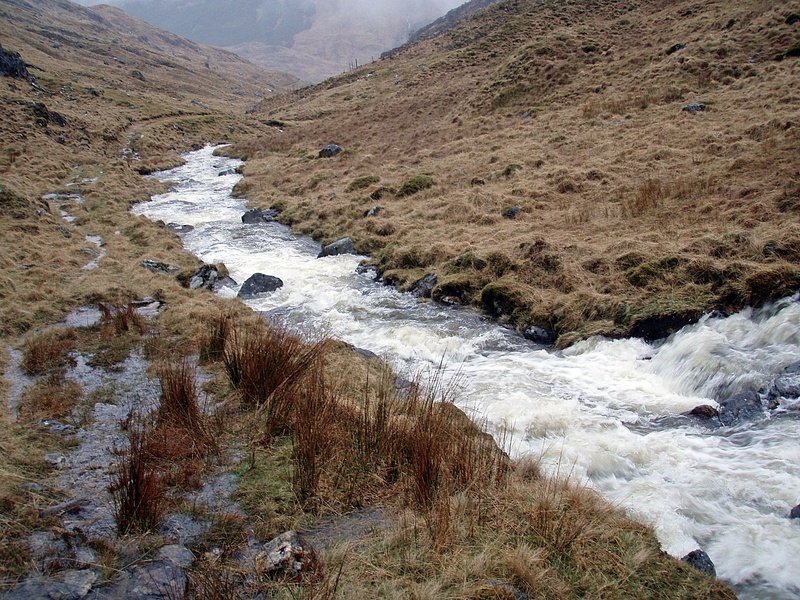 We reached the ford across the Allt Coire Rath during a heavy hail storm, and walked upstream where there are several small islands separating the river. 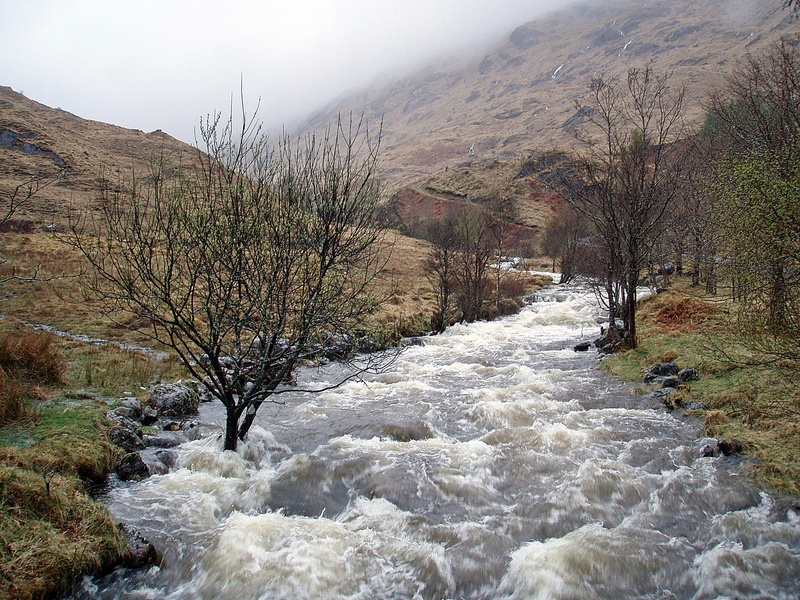 On previous occasions I have always managed to get across with dry feet, but today the river was in spate. My feet were wet anyway, so I just waded through and waited for Dunja on the other side, who took a bit longer trying to find a better crossing point. Shortly after, we noticed a group of four walkers in the distance behind us, and another single one ahead of us. We caught up with him, and it turned out he was a Challenger who had to drop out of the event because his walking partner had fallen ill, and he didn’t want to continue on his own. 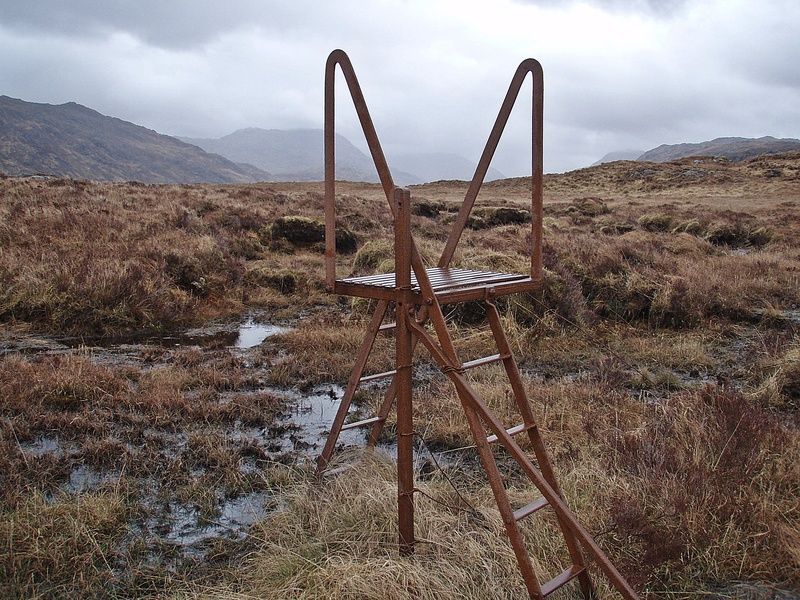 Instead he was trying to climb some Munros in the area, but today he had to turn back because of the weather. 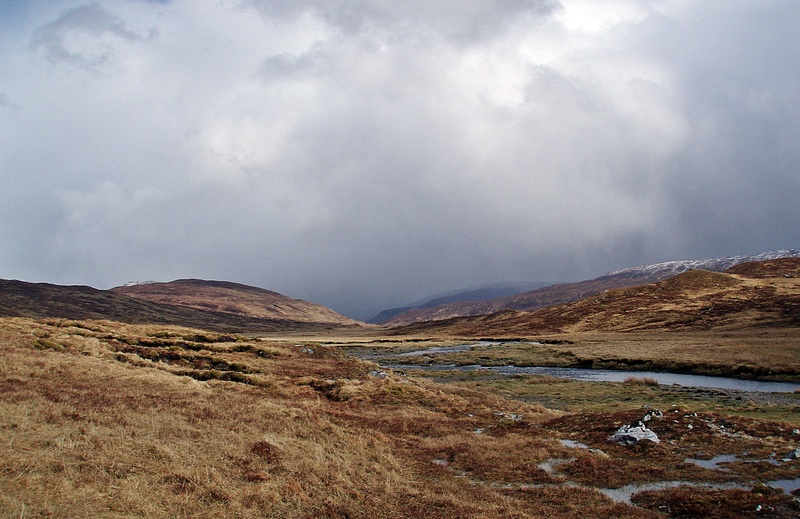 We were all heading towards Meanach Bothy, and after fording the Allt nam Fang we arrived there at 17:00, two hours later than I had estimated. Half an hour later Alan’s group arrived as well, they were the walkers we had seen earlier. 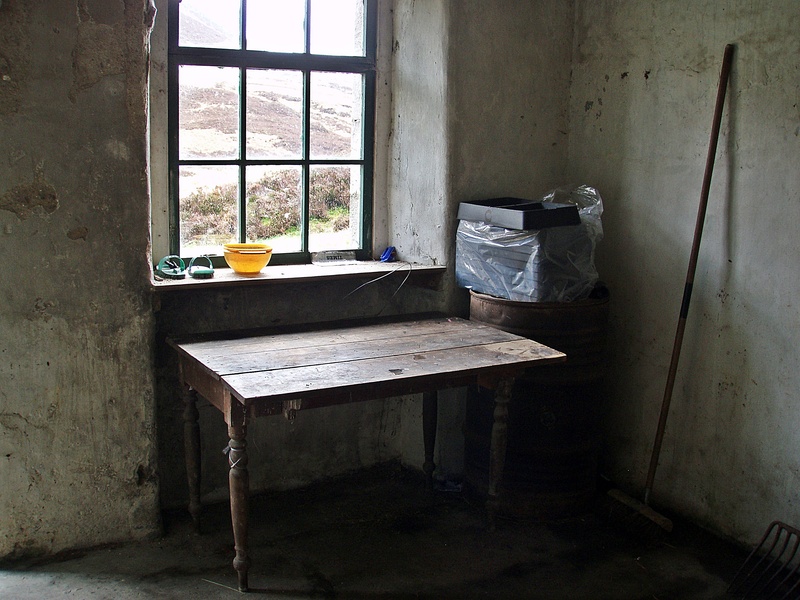 They were planning to camp somewhere further down the Abhainn Rath, whereas Dunja and the “ex-Challenger” decided to stay in the bothy. 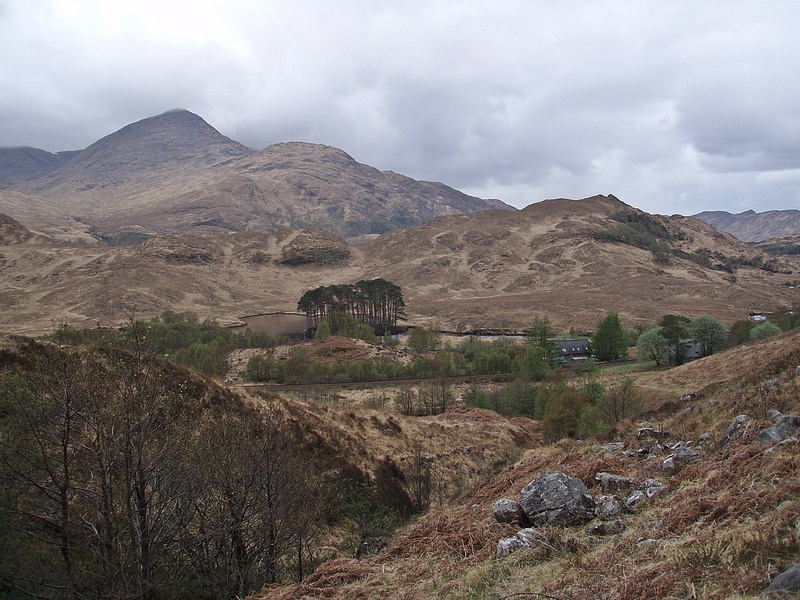 I was tempted to stay as well, but I wanted to get a few more kilometres done, and I had two potential camp sites in mind: the one by the lone tree at Loch Treig that I had used last October, or the area by the railway bridge across the track on the way to Corrour. 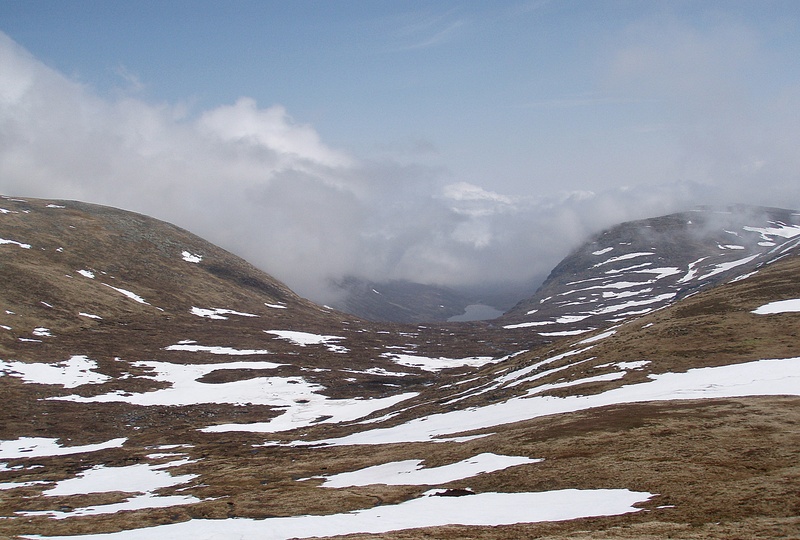 After some food and drink, I said my goodbyes to Dunja and the others – wishing her luck that the weather would improve and she could climb some Munros as planned – and continued along Glen Nevis on my own. 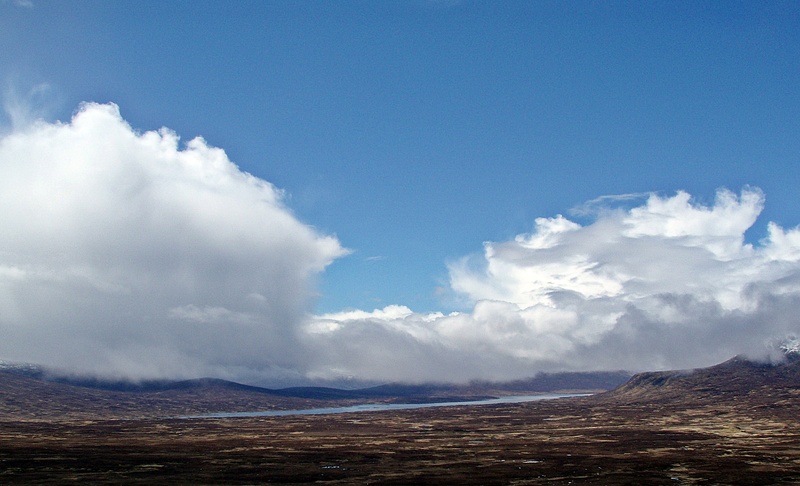 After I left the bothy, the weather seemed to improve a bit, the dry spells became longer and there were only a few more showers for the rest of the day. 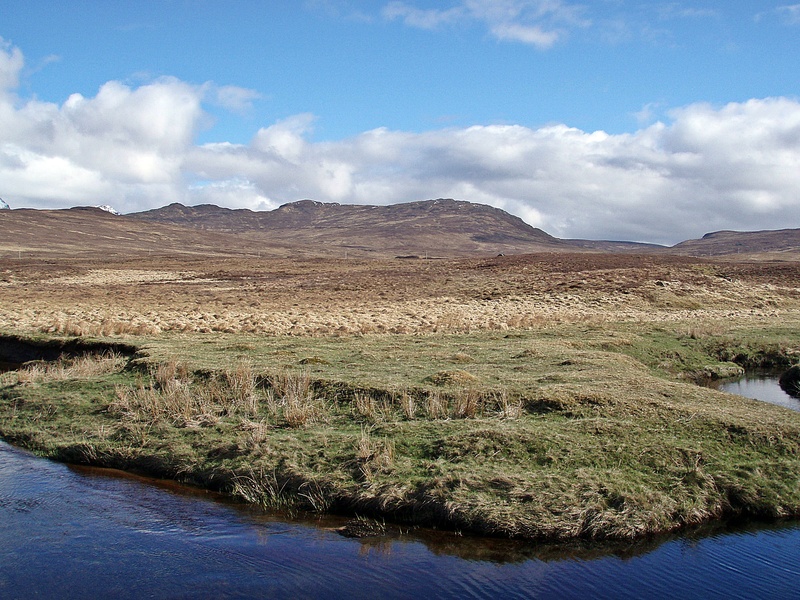 I passed several potential camp spots along the Abhainn Rath, but the raging river would have been to noisy for a good night’s sleep. 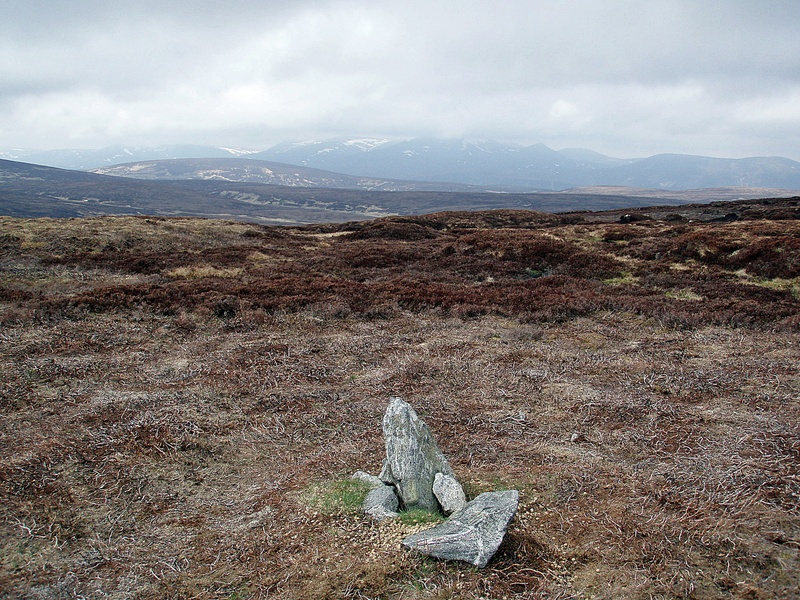 Abhainn Rath near Loch Treig. 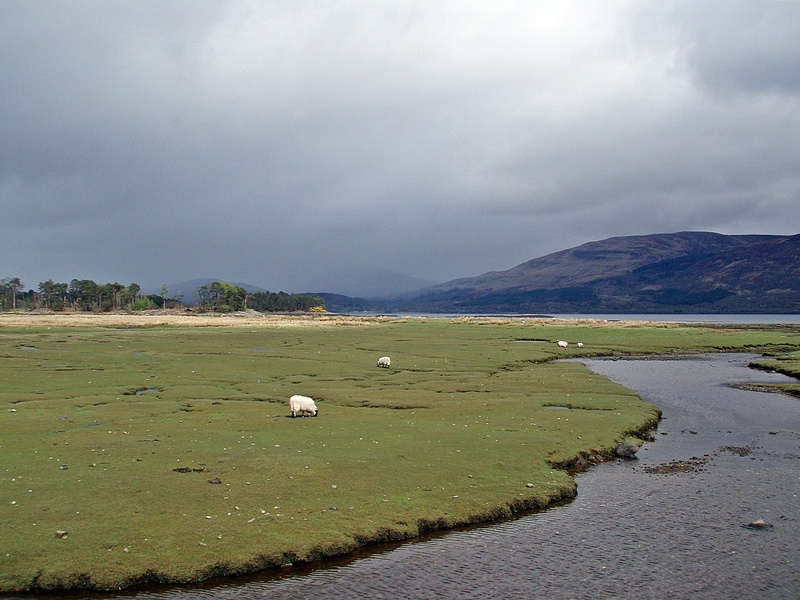 Loch Treig with a very low water level. I was really tired by now and just wanted to stop for the night, but the nearest suitable pitch that I knew of was beside the railway bridge half an hour up the track. I had expected to see some other Challengers’ tents around there, as it is a popular spot, but to my surprise I found the place empty. After wandering up and down for a while, trying to find a pitch that was sheltered from the wind, I finally decided on a place at about 20:45. The rain had stopped some time ago and my clothes were nearly dry, and I also managed to put the tent up dry. But just when I had finished, the rain started again and I couldn’t get out to collect water for my dinner (I didn’t want to get soaked again…). During the night the storm had become stronger, and it had rained most of the time. 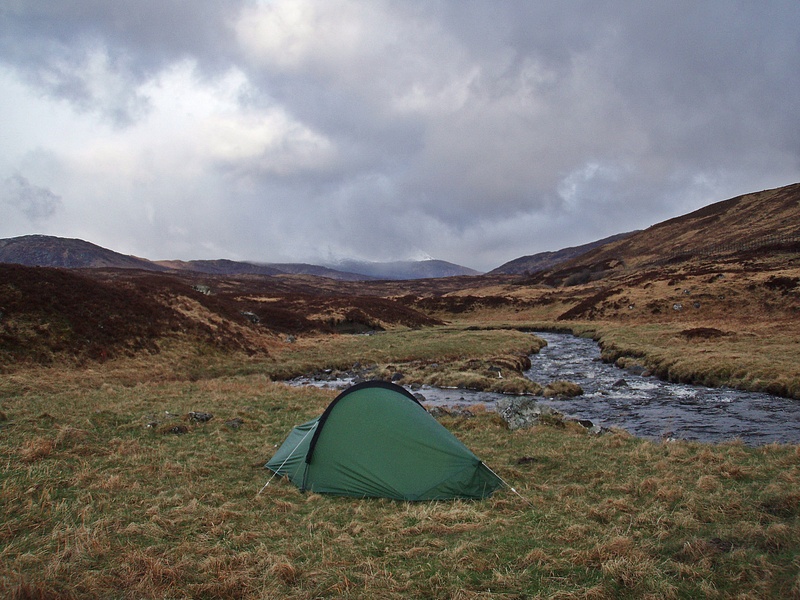 I had slept surprisingly well, in spite of the tent fabric flapping noisily in the wind and me worrying it might fly away or rip apart – and I had not even heard any passing trains. In the morning the wind calmed down, the rain stopped and the sun came out. After a while it actually became too warm in the tent, and I got up at 06:50. I took my time having breakfast and getting ready, and by the time I packed up the tent, it was almost dry. 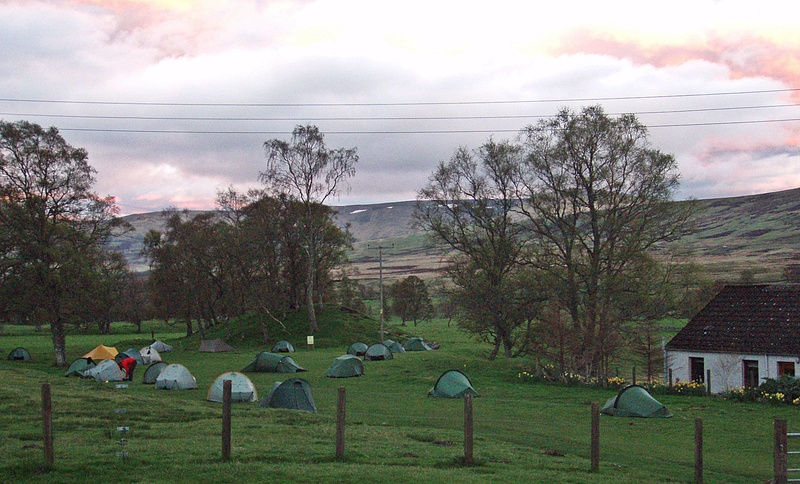 While I was packing, two Challengers walked by and I assumed they were the ones who had camped by Loch Treig. 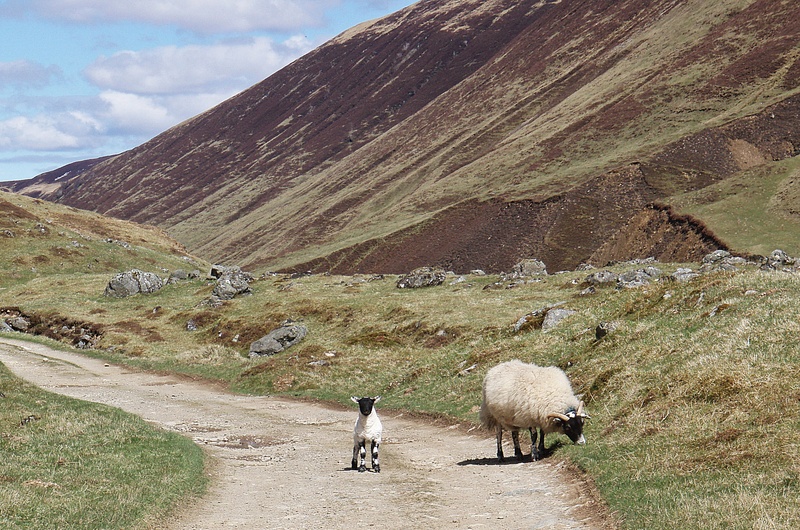 They seemed to be heading to Corrour Station on the boggy path along the railway line, and I was wondering if they knew that the restaurant was closed (in case they were hoping to have breakfast there). 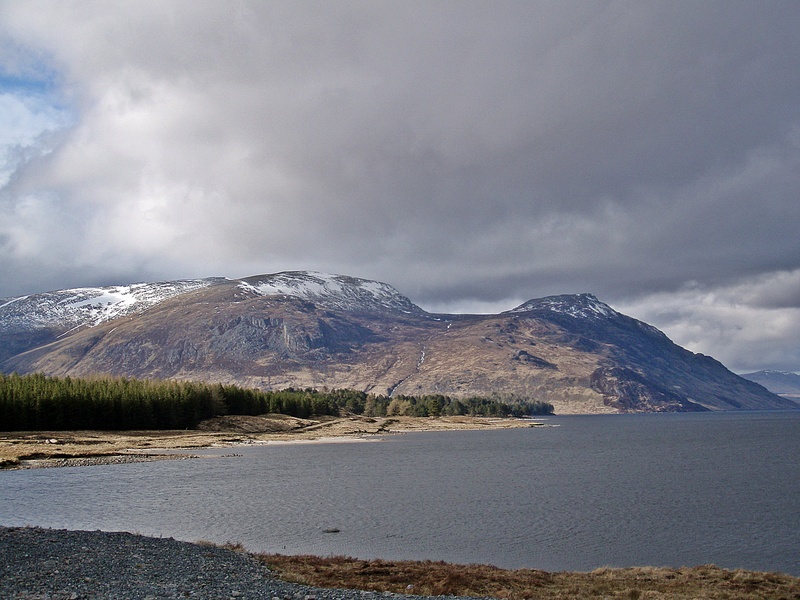 Near Loch Ossian I met John and Stuart who had stayed at the YH last night. Stuart was the first-time Challenger I had met at the sign-out in Lochailort, and when I asked him how he found the Challenge so far (especially considering the weather conditions), I was almost surprised to hear that he was really enjoying it. He didn’t seem to mind the wind, rain and cold at all, and somehow I found his enthusiasm very inspiring, because it was quite the opposite to the thoughts that had gone through my mind the previous evening! 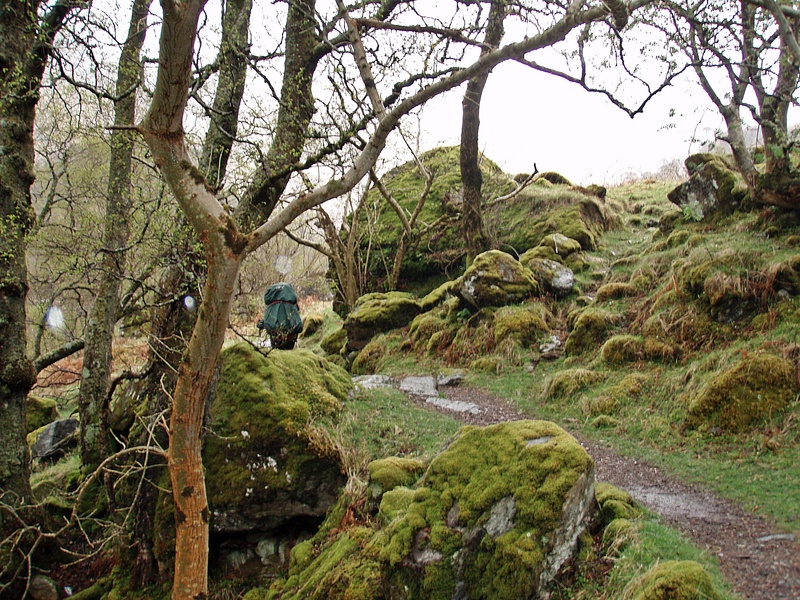 I was pleased to find that the path up to Peter’s Rock had been improved recently, and the worst of the bogholes can now be passed with dry feet! 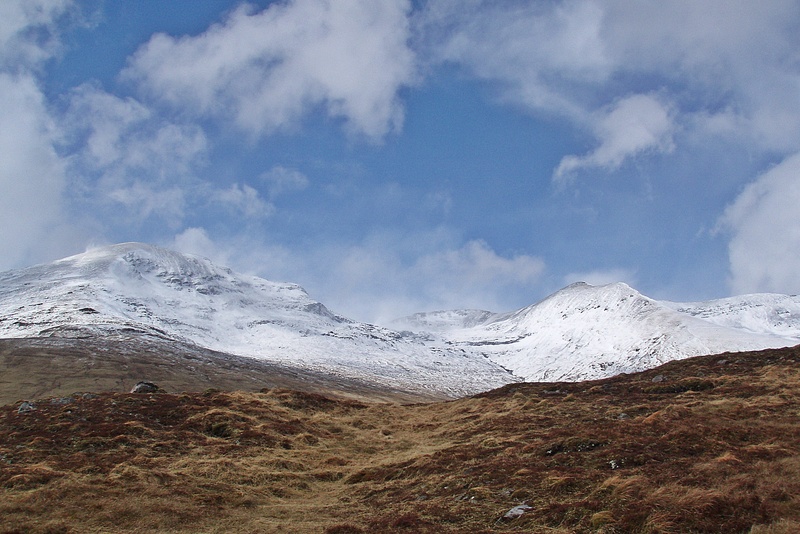 Beinn na Lap, free of cloud. 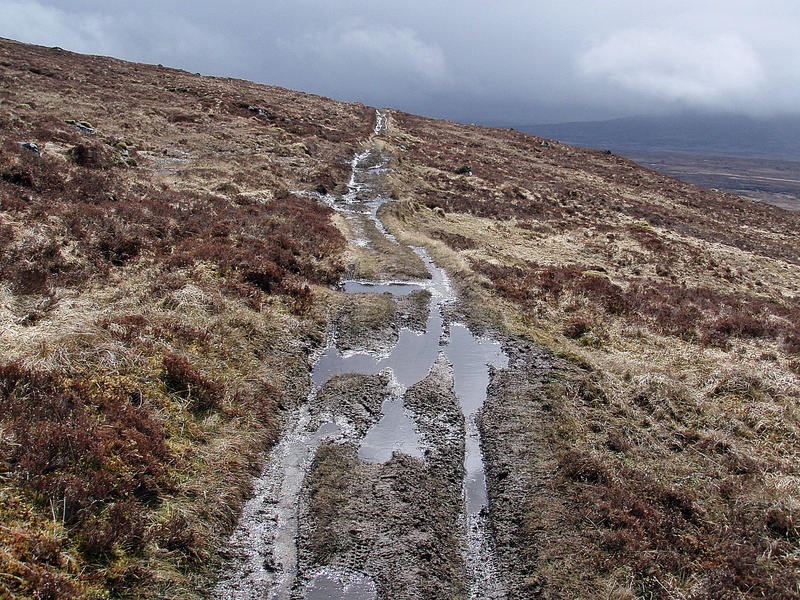 Unfortunately, the improved path was short-lived… the section from Peter’s Rock onwards was as boggy as ever. 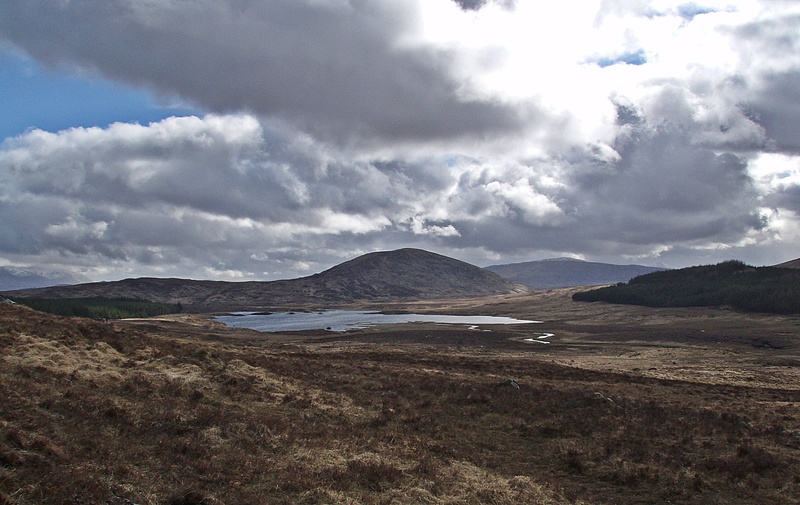 Blackwater Reservoir in the distance. 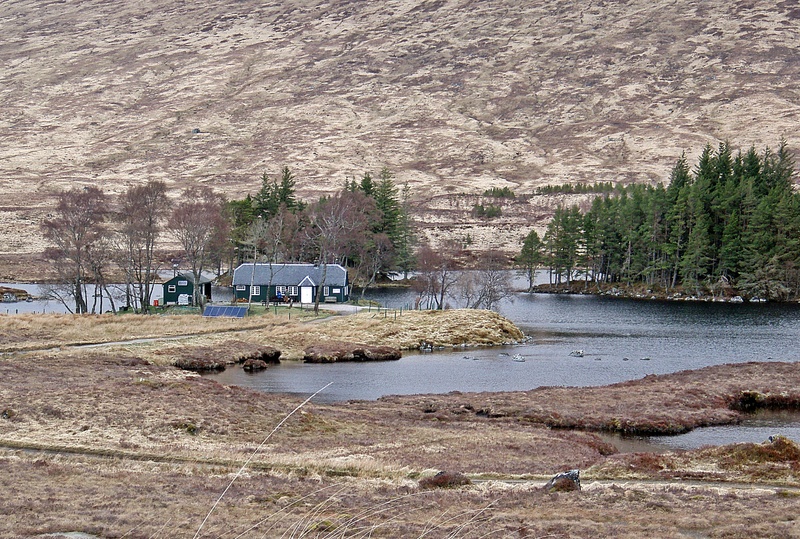 Corrour Old Lodge, my planned camp site for tonight. But as it was only 13:00, I was going to continue until I got tired, and then find a place to camp. 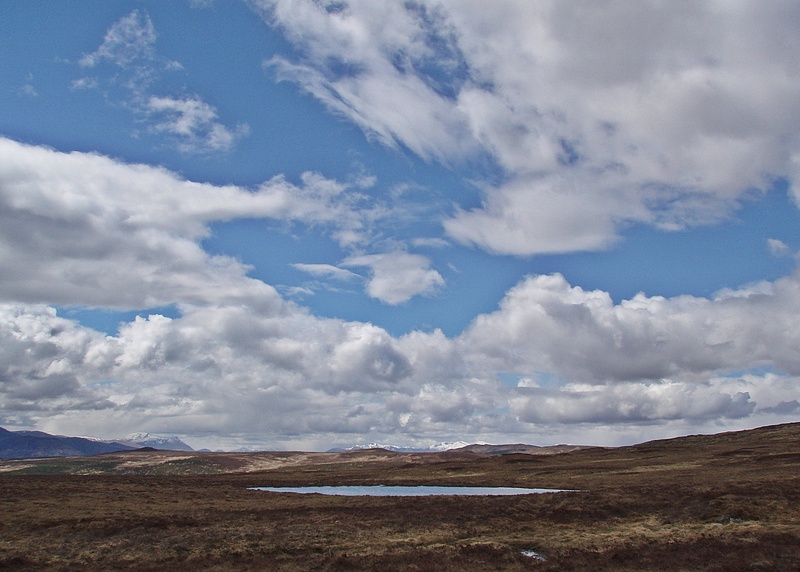 The weather had improved considerably in the meantime, it had been dry all day, but now the clouds lifted and the sunny spells became longer. 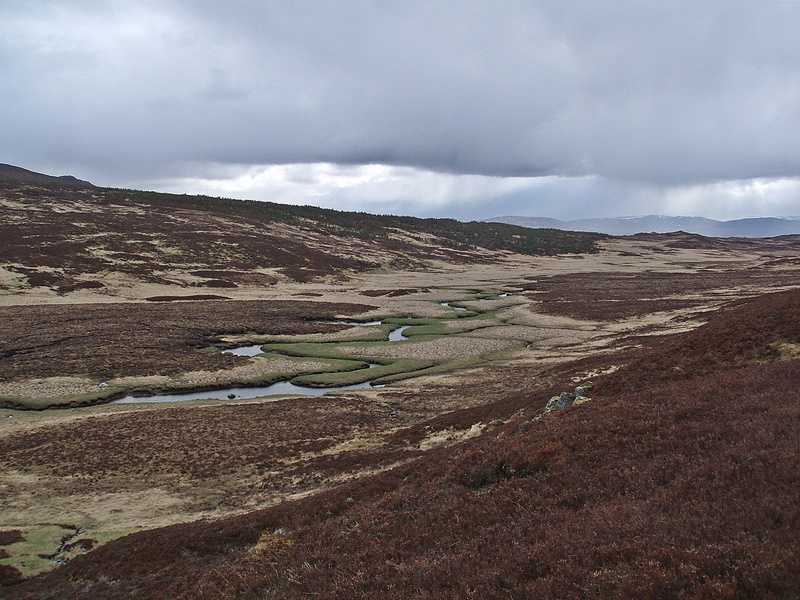 Shortly after the footbridge across the Allt Eigheach I turned left onto a boggy track that leads to Lochan Sròn Smeur. 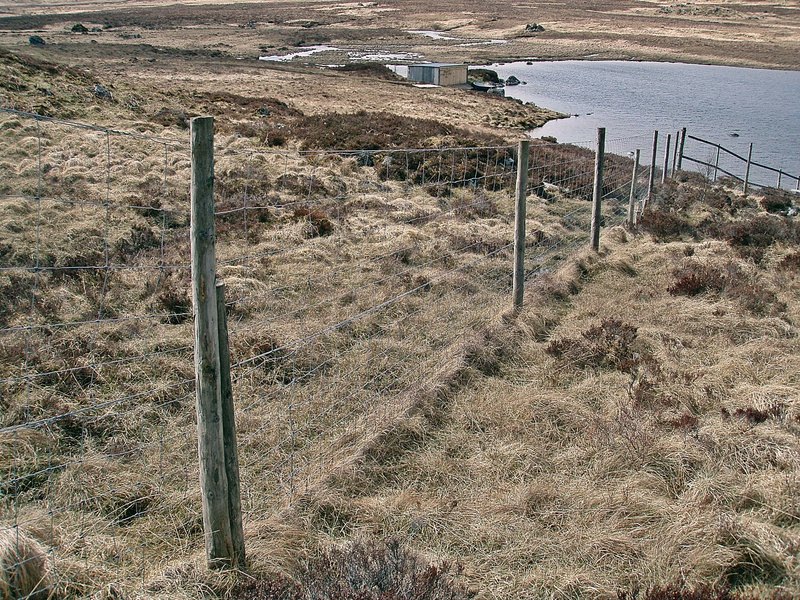 I passed the boathouse and started walking around the loch, but I was stopped immediately by an obstacle – a fence without a stile or gate in sight, about 2 metres high. First I tried to climb over, but the weight of my rucksack kept pulling me out of balance, and the fence seemed too wobbly to bear my weight (plus rucksack). Then I took the rucksack off and tried to throw it over the fence. I did manage to lift it just above my head, but the fence was still too high and I didn’t have the strength to lift the bag high enough to push it over. The fence seemed to lead straight up the hillside, but I really didn’t fancy climbing alongside it and over the hill. 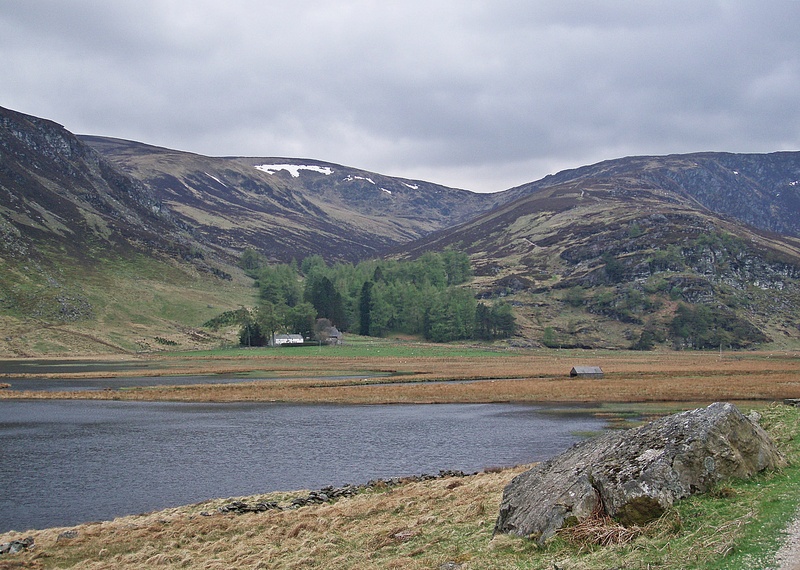 I even thought about walking along the N bank of the loch, but to get across the Allt Gormag I would have had to walk back a good distance because near the loch it seemed to be quite deep. I decided to try it again, put the rucksack back on and climbed the fence, but this time right beside a double fence post because that seemed a bit more stable (visible in the photo above). It was hard work, but eventually I managed to get to the other side. 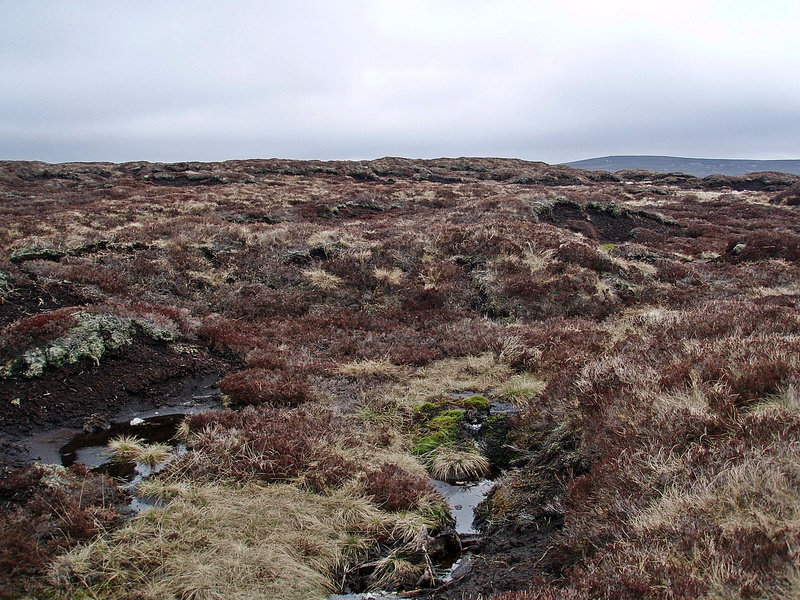 The terrain along the loch was a slope covered in a mixture of grass, rocks and heather, and from the distance it looked as if the ground on the N bank would have been easier. 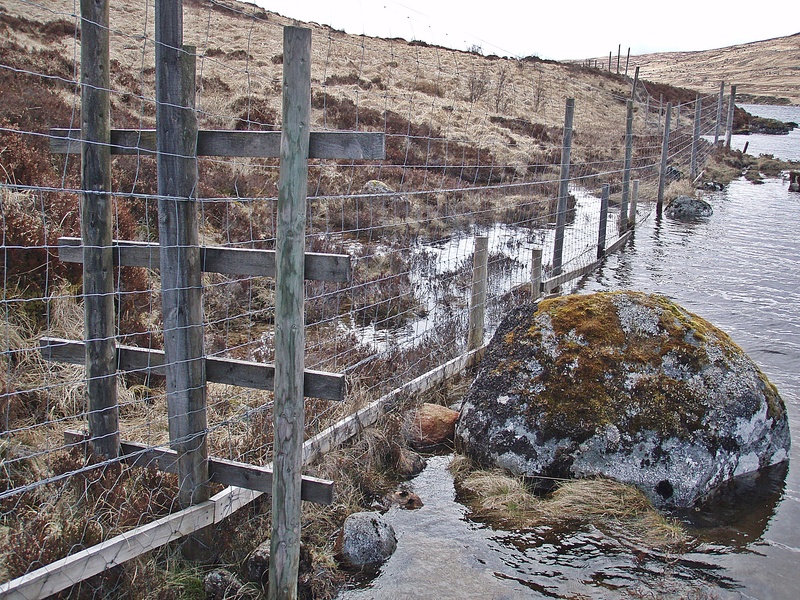 The difficulties were not over yet… At the E end of the loch another fence had to be climbed, and although there was a stile of some kind, it was still awkward to cross because the position of the bottom rung forced me to step into the water. 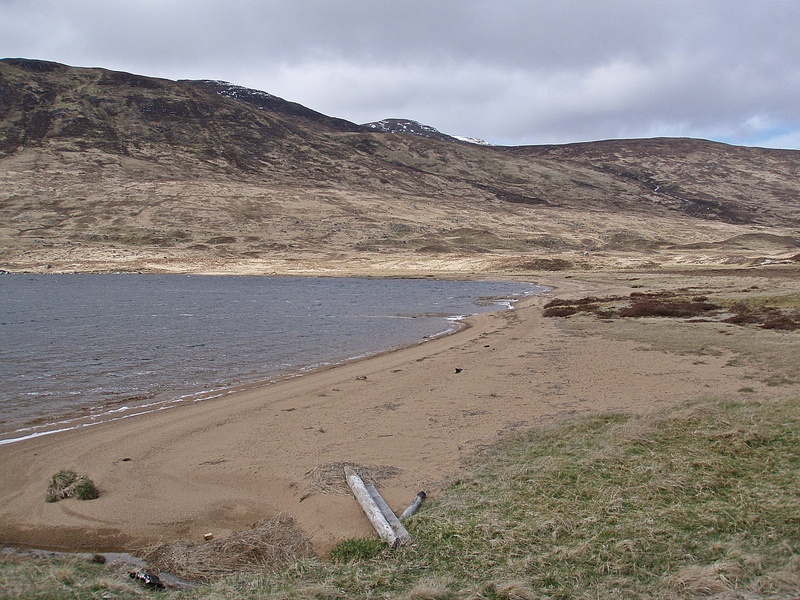 Sandy beach at the E end of Lochan Sròn Smeur. 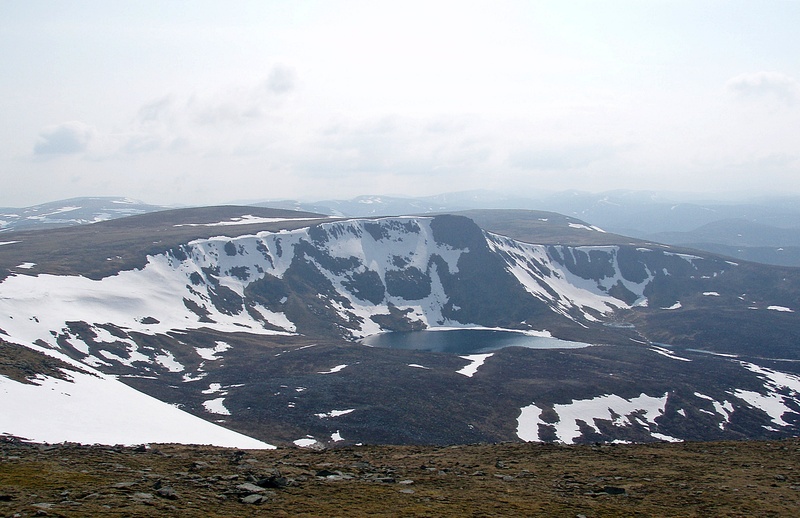 Heading NE from Lochan Sròn Smeur. 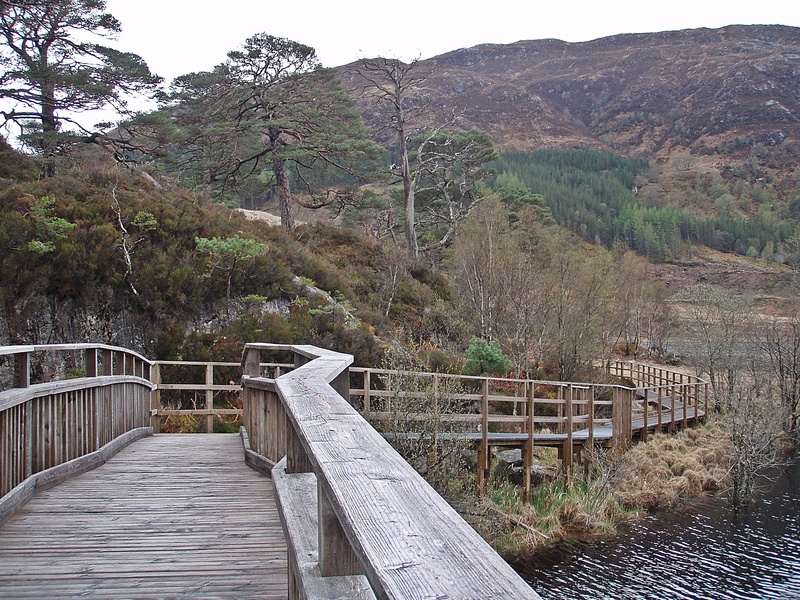 At the N end of Lochan Lòin nan Donnlaich I found a substantial wooden bridge across the Allt Coire a’ Ghuibhais. 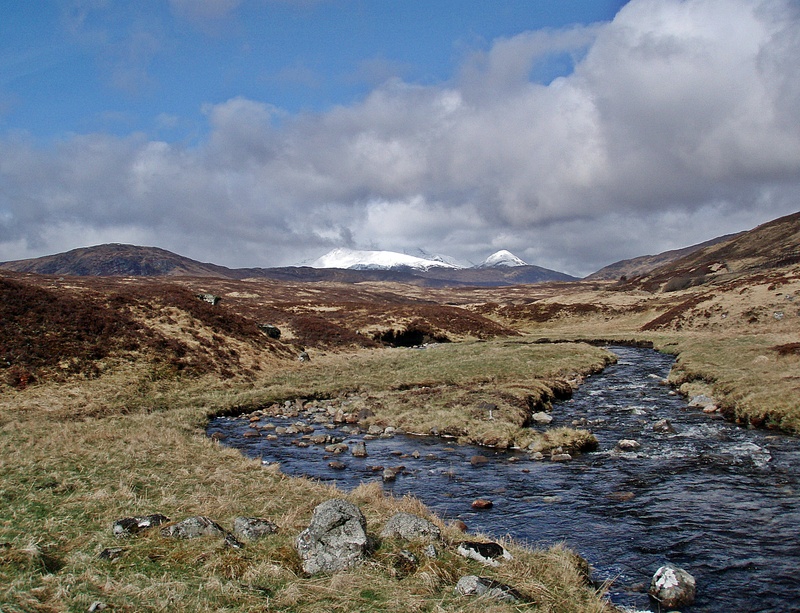 I followed the river for a few hundred metres and then climbed up to the track that leads to Loch Ericht. 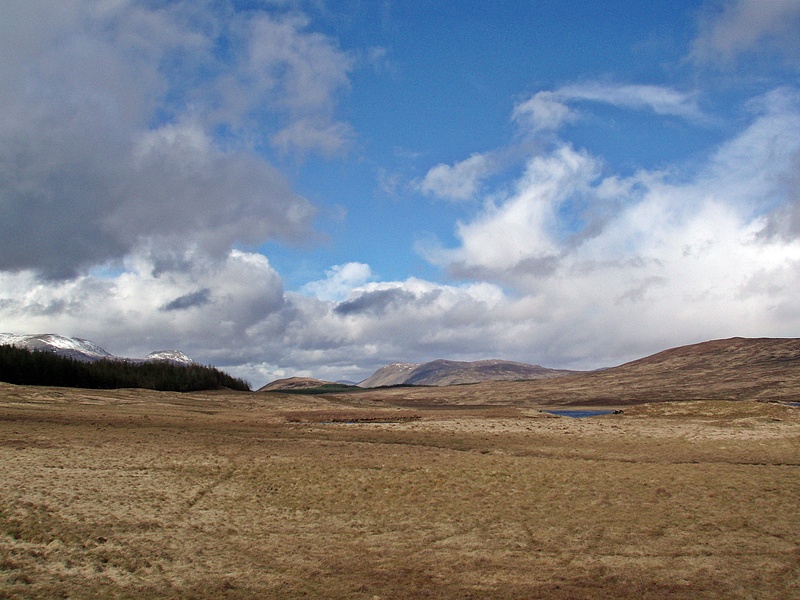 View from the track back to Lochan Lòin nan Donnlaich. 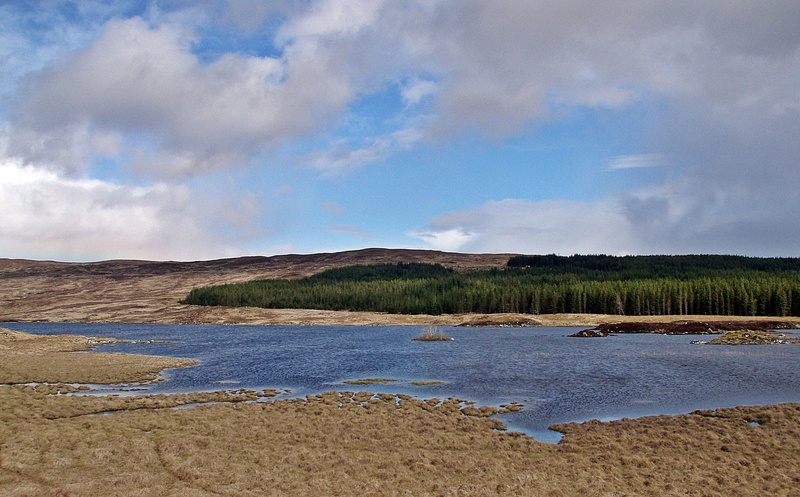 I made good progress on the forest track and soon arrived at Loch Ericht. 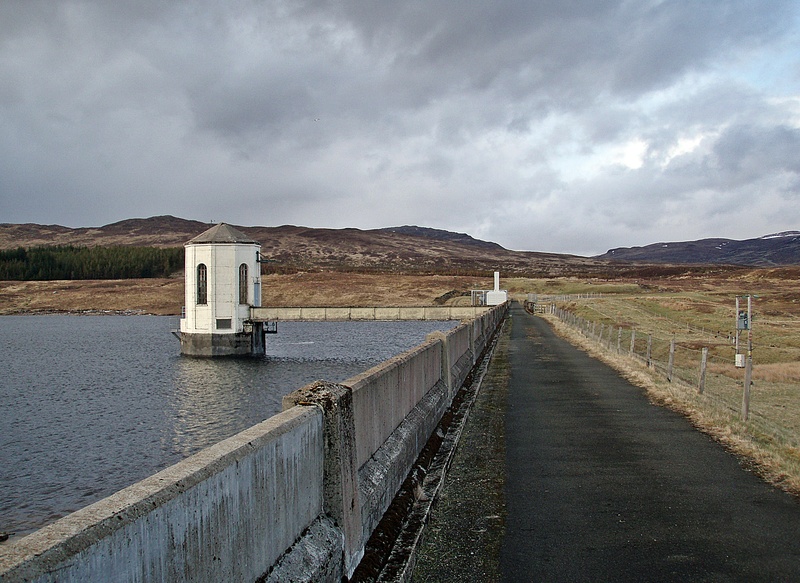 The dam at the S end of the loch was less than three kilometres from where the good track had ended, but it seemed much longer, as I kept trying (in vain) to zigzag around the bogholes. It was after 19:30 when I finally reached the dam. 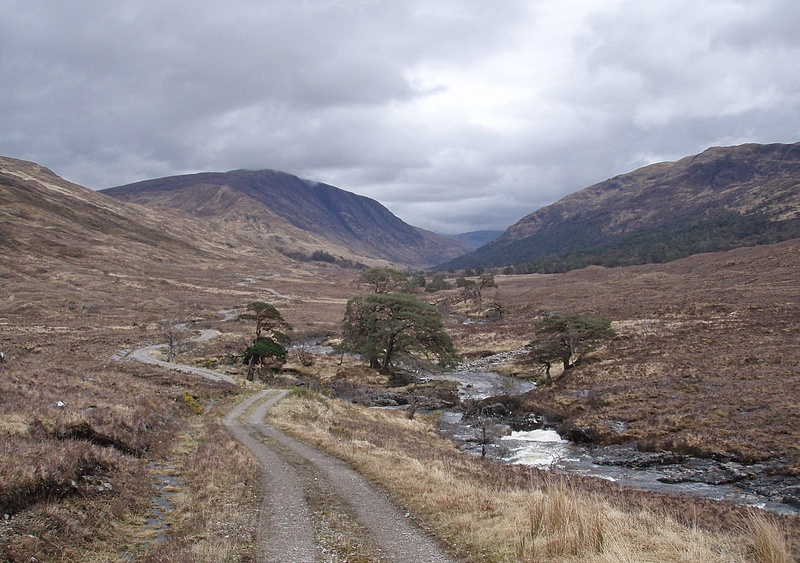 I walked across it and followed the single track road that leads from Loch Rannoch to Corrievarkie Lodge. 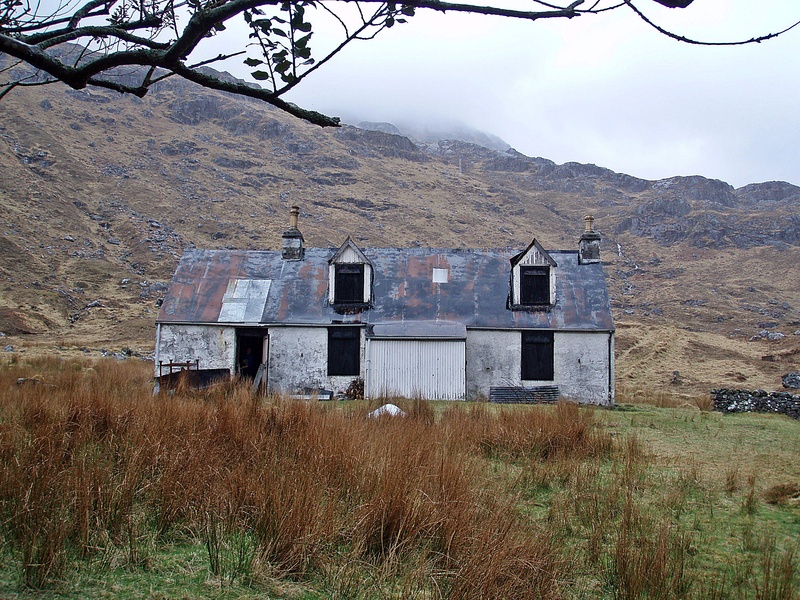 It was time to find a pitch for the night, and I remembered reading (possibly in a Challenge report) about a good one opposite the ruin at Rhuighe Ghlas. 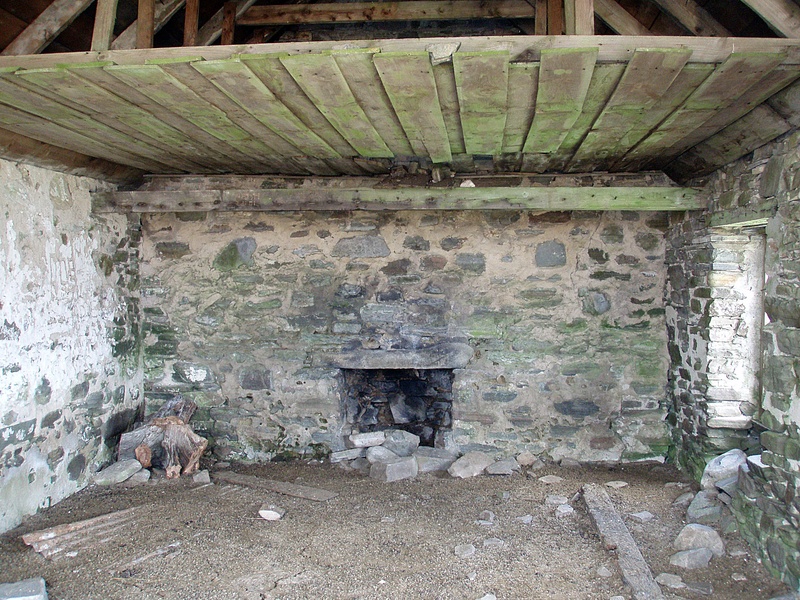 I went to have a look, and it was perfect, nice and sheltered between a little knoll and the Allt Ghlas. I woke up to a sunny day, but it was windy and a bit chilly to start with. Following the Allt a’ Choire Odhar Bhig I noticed plenty of potential camp spots, but they were all more exposed than the one I had chosen last night. 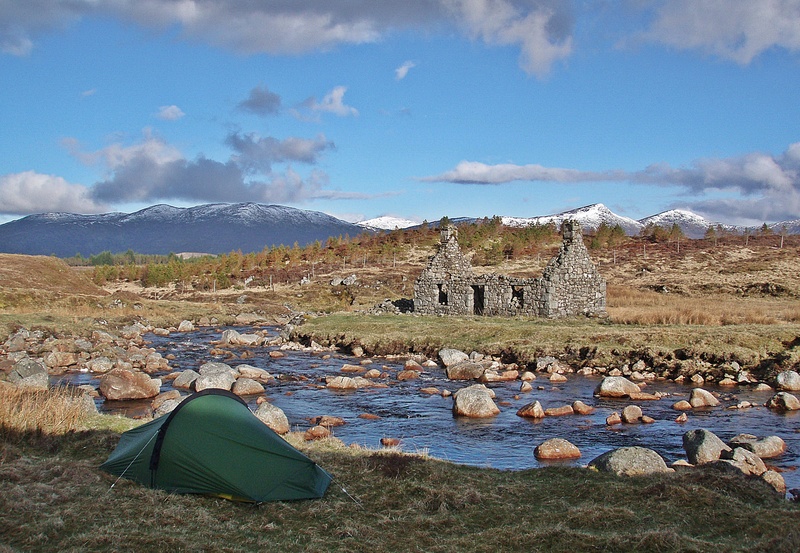 Another nice camp spot with the hills of the Rannoch Forest as a backdrop. 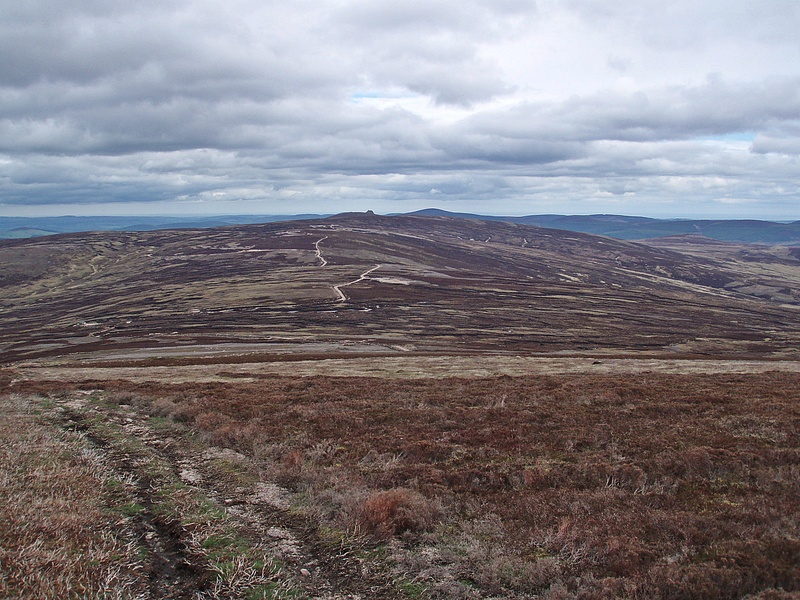 I had expected this to be the hardest day of my route, with very slow progress across almost completely pathless and possibly very boggy ground. 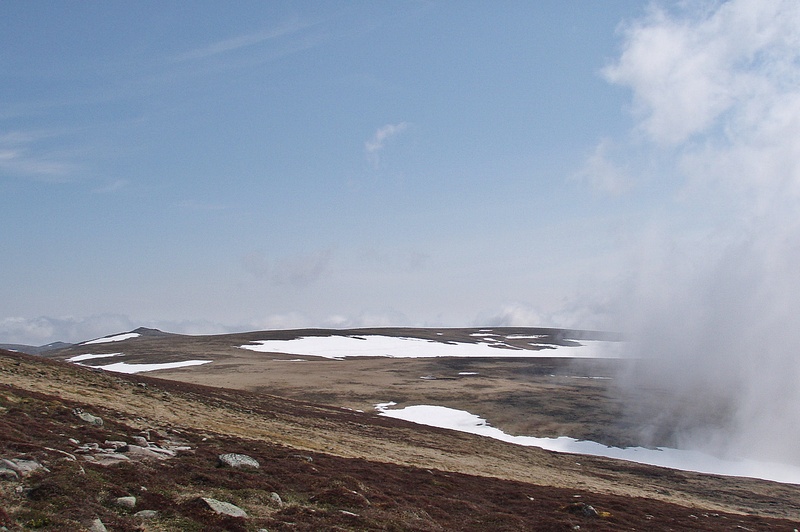 But I was pleasantly surprised to find that the terrain consisted mainly of dry grass and short heather, besides that it was very dry and easy to walk on. 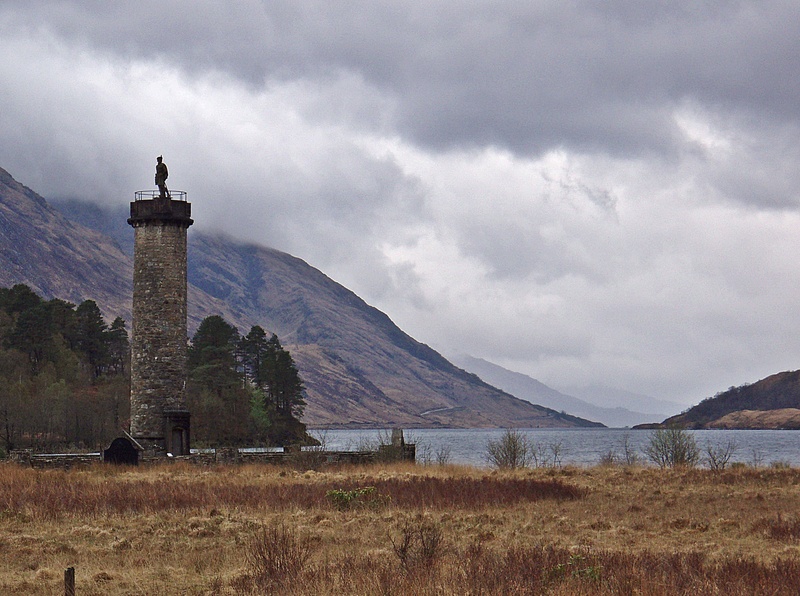 Dark clouds over Loch Rannoch. It wasn’t even 15:00 when I reached the ruined house at Saunich, where I had planned to camp. A small herd of deer was grazing in front of the building. In bad weather the house could probably provide some shelter, although the doors and windows are missing. 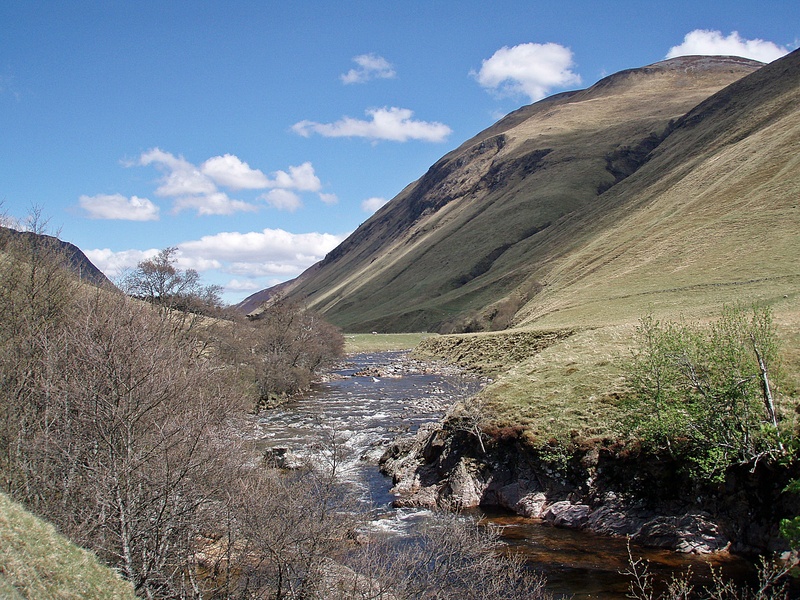 The wide glen of the Allt Ruighe nan Saorach, above which Saunich is situated, has got plenty of wild camp opportunities as well. 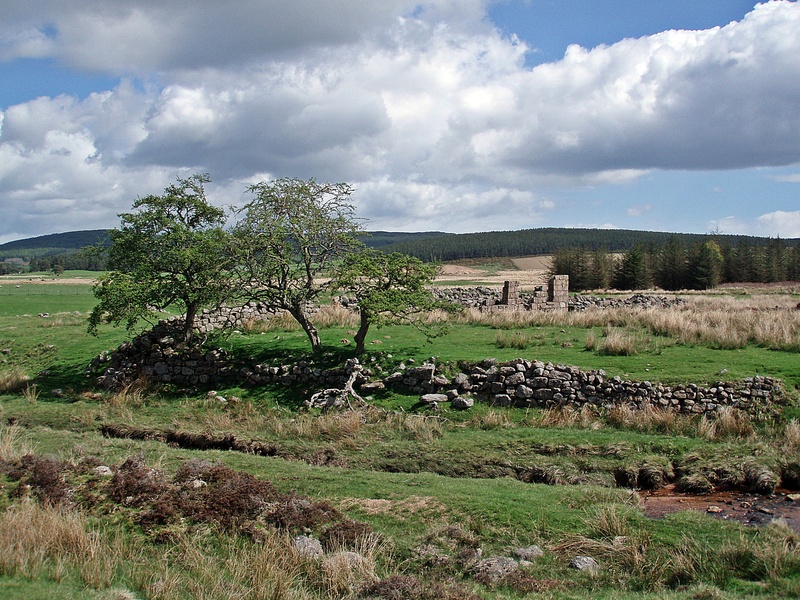 Walking on the track along the S bank of the loch, I soon came across another ruined building, Ruighe nan Saorach. Although I still found it too early to stop for the day (it was only 16:20), I decided to stay. 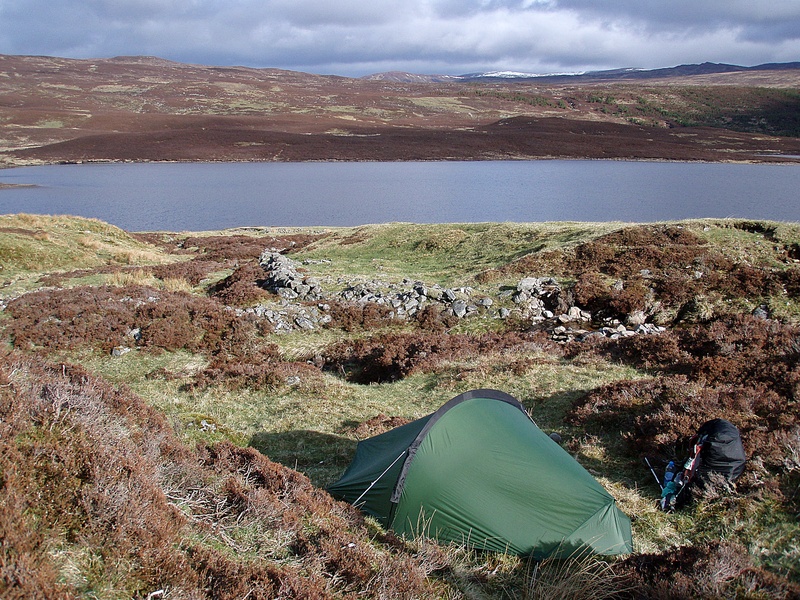 Somehow the place seemed very peaceful and quiet, the weather was nice, and I wasn’t sure if I would find a suitable place to camp further along Loch Errochty. I was getting closer to civilisation again, and that would make it more difficult, I thought. 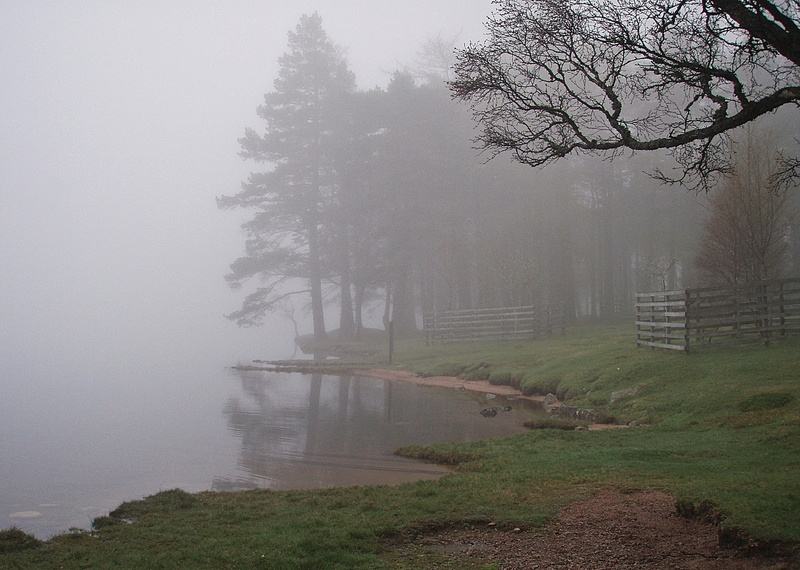 I was ready to go at 08:00 and walked along the S bank of Loch Errochty. On my way I saw plenty of suitable camp spots beside the track, and if I had known that, I could have walked a bit further last night. Ancient (agricultural?) 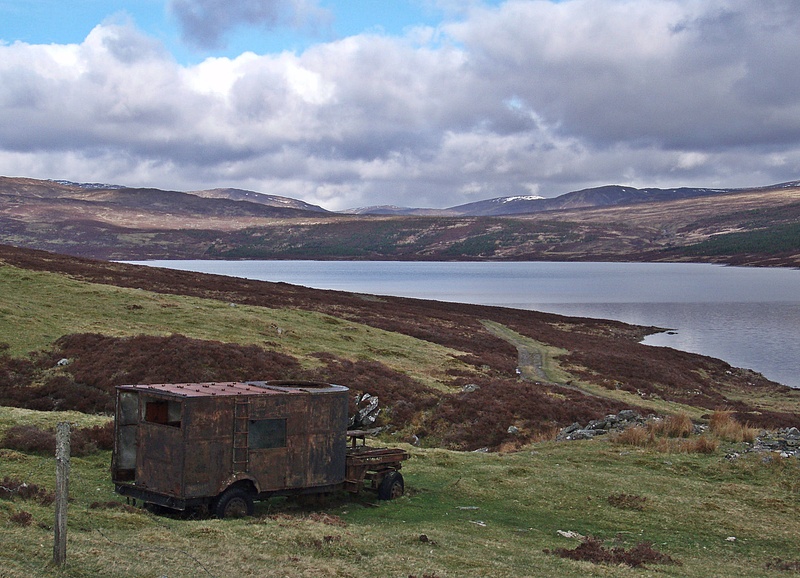 vehicle by the old shielings at Achadh Mòr. Past Trinafour, it was road walking for the rest of the day. 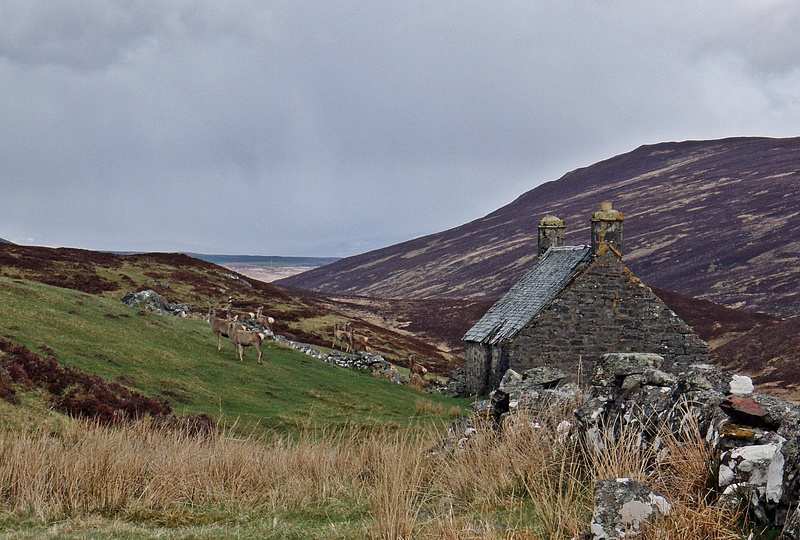 My ankle started hurting again, and the surroundings were not too exciting, just a few farm buildings along the road. 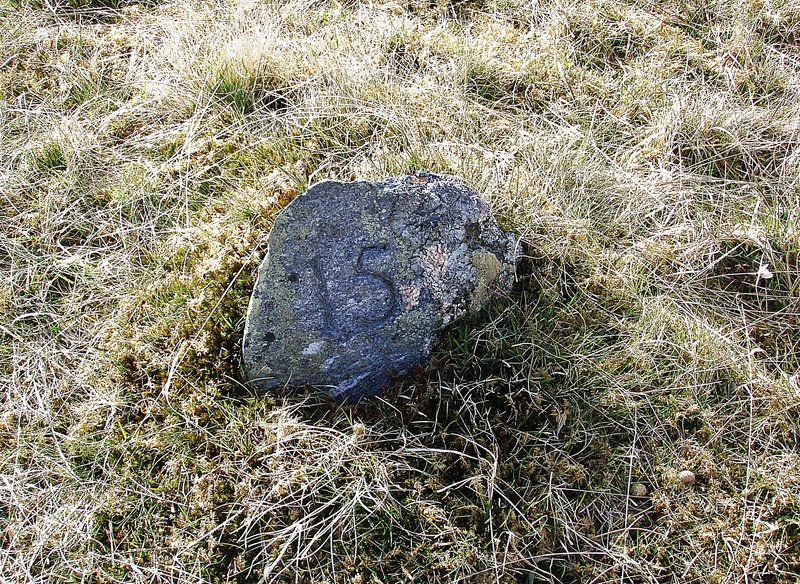 At Struan there is a pub marked on the map, but according to a sign beside the road it is open to residents only (??). After a bowl of soup, followed by a slice of cake and a lemonade, I felt refreshed and ready to tackle the last part of today’s walk. 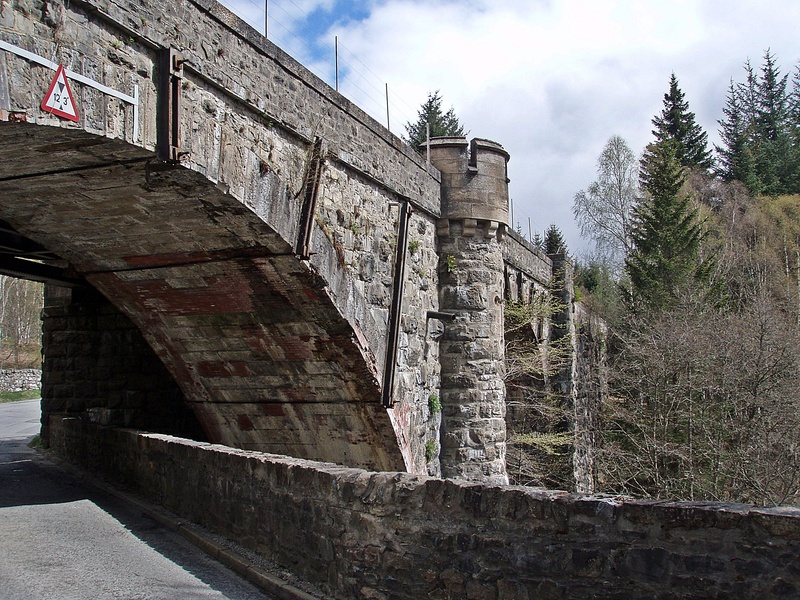 On the road to Blair Atholl. 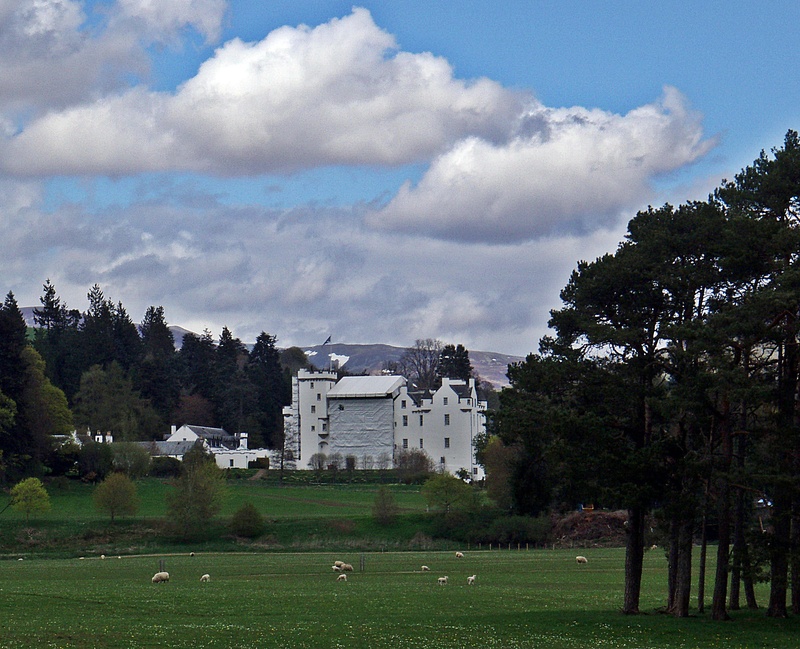 The last section of the road is a long straight and quite boring, but at least I could catch a glimpse of Blair Castle across the wall. Before I checked into the campsite, I went to the Bothy Bar to have a look at the menu, and bought some food from the small village shop. At the campsite I paid £ 12 and was allocated a pitch right beside the perimeter fence. Apart from the fact that very noisy crows were living in the trees above, I could hardly get the tent pegs into the ground because there seemed to be stones/rocks about two centimetres under the grassy surface. I washed some clothes, put them in the dryer and went to have a shower and wash my hair. When I tried to collect my clothes from the dryer, I found the laundry locked (as well as the reception), and I had to phone the emergency mobile number from a sign outside reception to get someone to unlock the door for me. The night seemed very short (with the crows screaming like mad from 04:30 on), and it took me a while to get ready in the morning. Before I could take the tent down, I had to wash the bird droppings off with some warm water :evil:, and when I left the campsite at 10:00, everyone else had long gone. I started walking on the forest path along the river to Old Bridge of Tilt. At Old Bridge of Tilt I crossed the bridge and took the track that starts opposite the car park and leads into Glen Tilt. 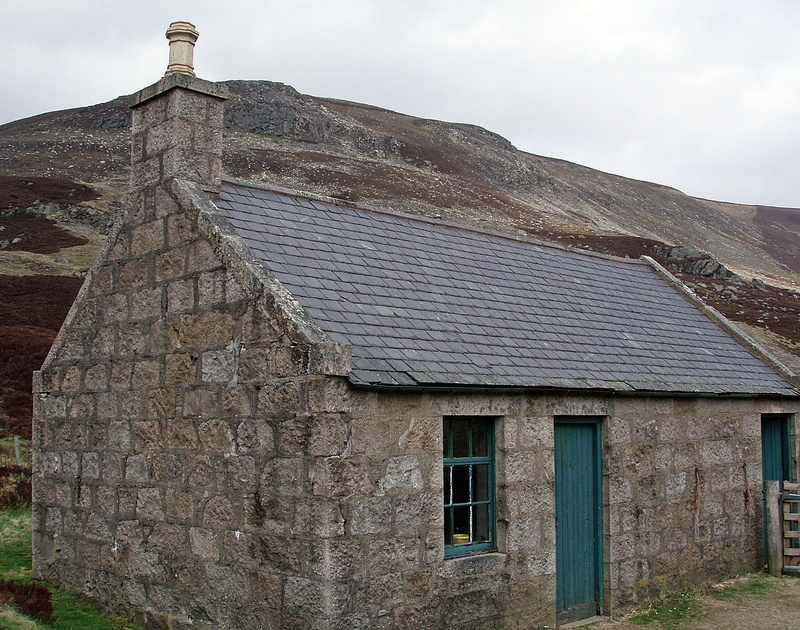 One of several pretty cottages in the glen. 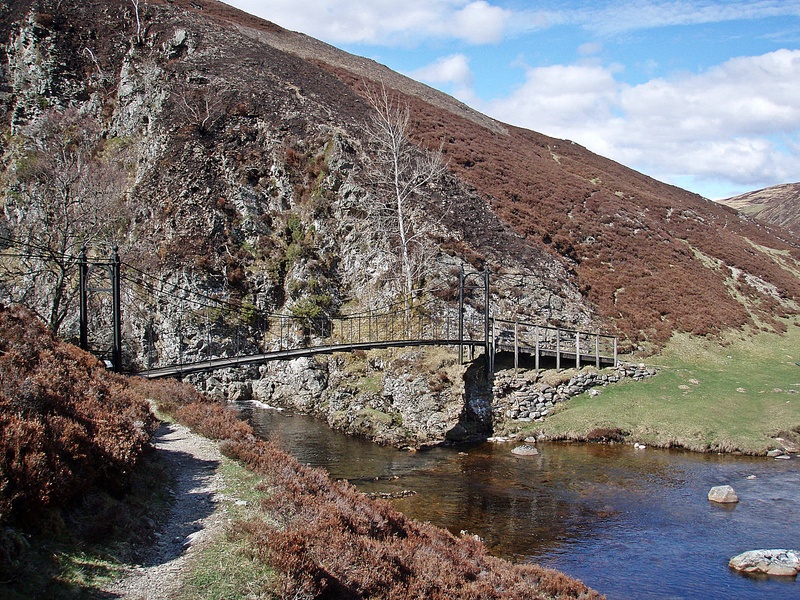 Footbridge across the River Tilt, with the northern ridges of Beinn a’ Ghlo in the background. Some of the friendly locals. Walking on the hard surfaced track, very soon my left ankle was hurting again, and later my right heel started to complain as well. 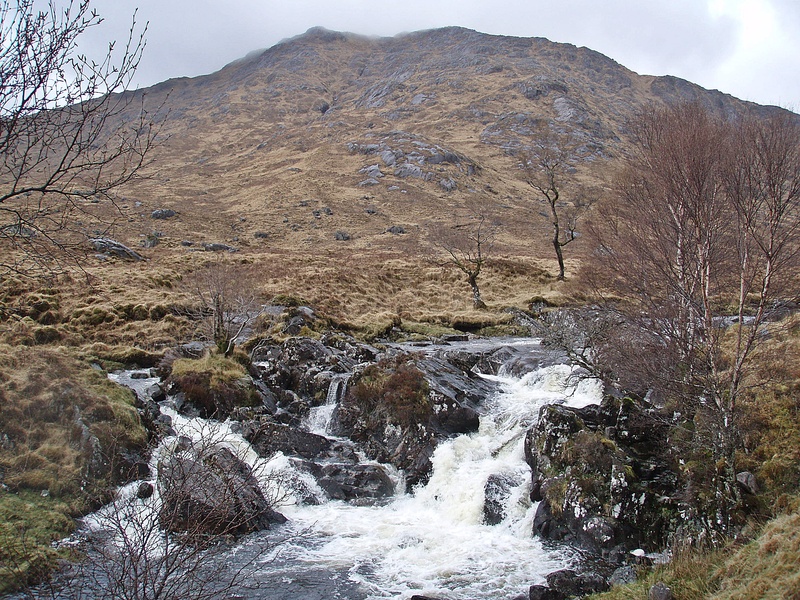 Approaching the Falls of Tarf. At the Bedford Bridge, I met Alan who had been walking well ahead of me, but had turned back to find a sheltered camp site. 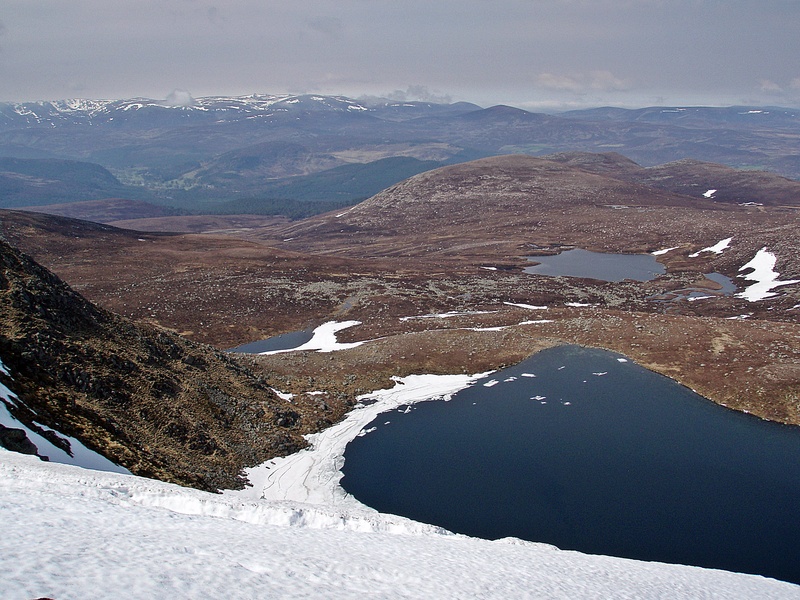 He was going to pitch beside the bridge, but after a brief conversation he decided to continue towards Bynack Lodge or even White Bridge. 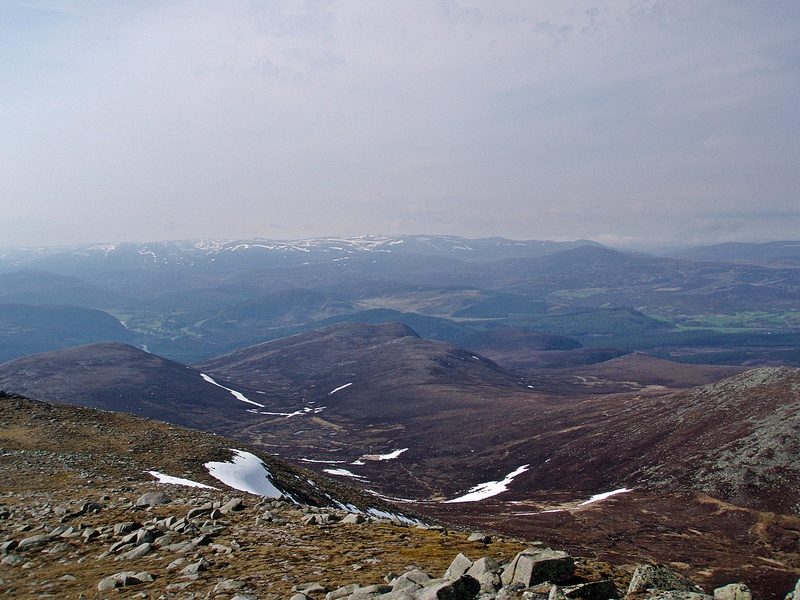 Looking back to Beinn a’ Ghlo. 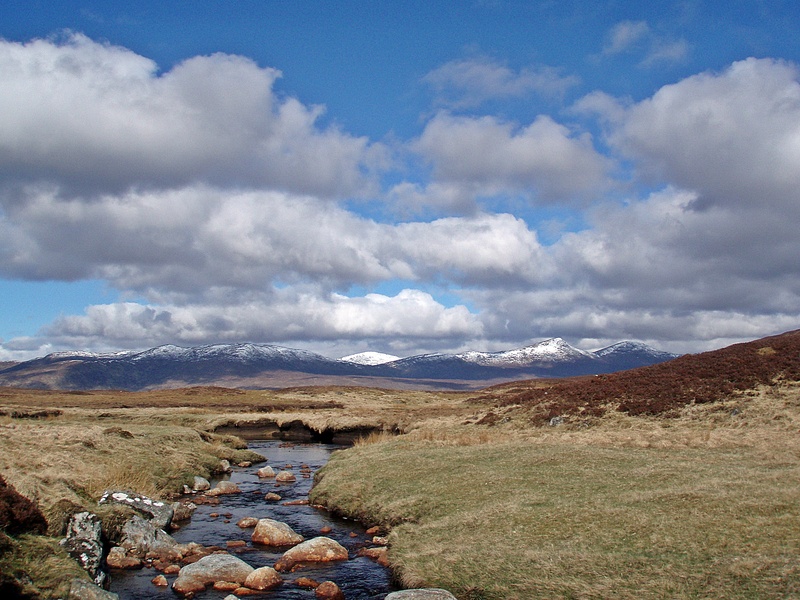 On the way to Bynack Lodge, the glen widens. Near Bynack Lodge I caught up with Laura and Cathy, and we walked together for a while. 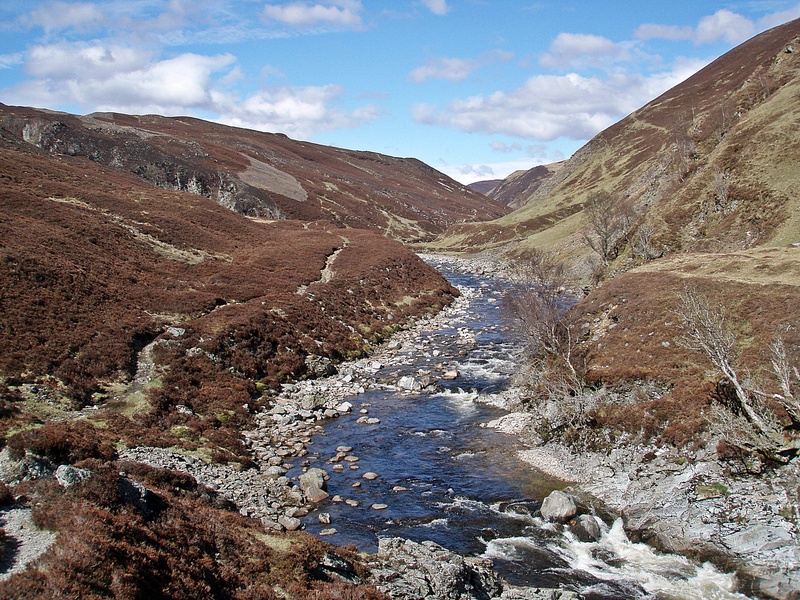 But Laura had developed some bad blisters that slowed her down, and after crossing the ford at the Geldie Burn she had to change from sandals back to walking boots. Waiting for her, I began to feel cold and Laura suggested that I should walk ahead and find a sheltered camp site for us all. I was happy to do so and hurried off. 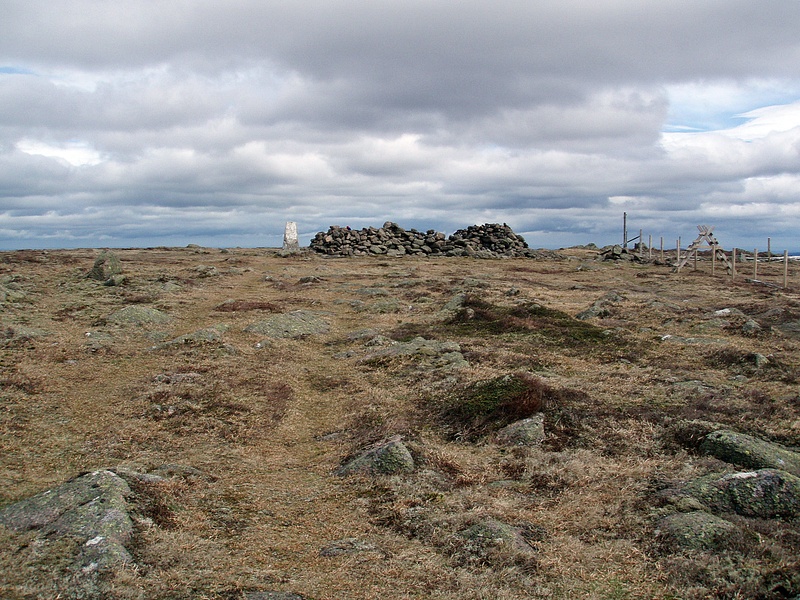 Although White Bridge is a very exposed location, there were about 10 tents pitched around it, two of them even on top of a little knoll. At the edge of a forest 1.5 km past White Bridge I saw what looked like flat, grassy ground from the distance. 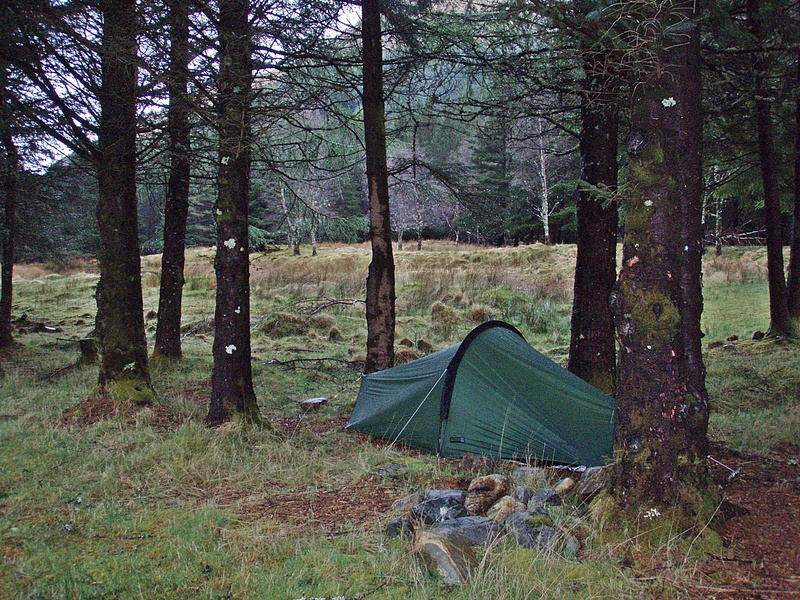 I went to have a closer look and found that it was fine – in the lee of the forest and enough space for three tents. I had just finished pitching my tent, when Laura and Cathy arrived and joined me. We discovered an Akto pitched between some fallen trees nearby, well hidden from view. It belonged to another Challenger who came over for a chat, and who warned us of a bad storm that was forecast for the night. The storm was not as bad as expected, it was very windy at times, but there were also periods when it was quite calm. My feet still hurt, so I took one Ibuprofen at breakfast, and decided to walk in Crocs today. 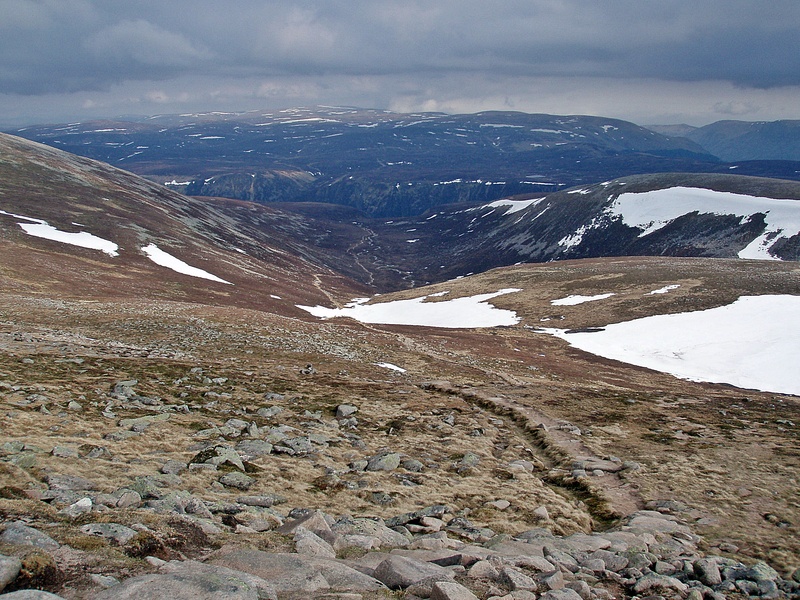 I left shortly after Laura and Cathy, but caught up with them at the Linn of Dee, and we walked to Mar Lodge together. Among the many Challengers we met there, were Paul (who was on his first Challenge and whom I had first met in June last year on the Bridge of Orchy Munros), Mick and Pete (aka Croydon and Morpeth) who apparently had been the two campers who had beaten me to “my” camp site at Loch Treig, as well as Stuart and a few others whose names I can’t remember. I even managed to find a socket behind one of the armchairs in the Gun Room to charge my phone, while we had a second breakfast in the kitchen. 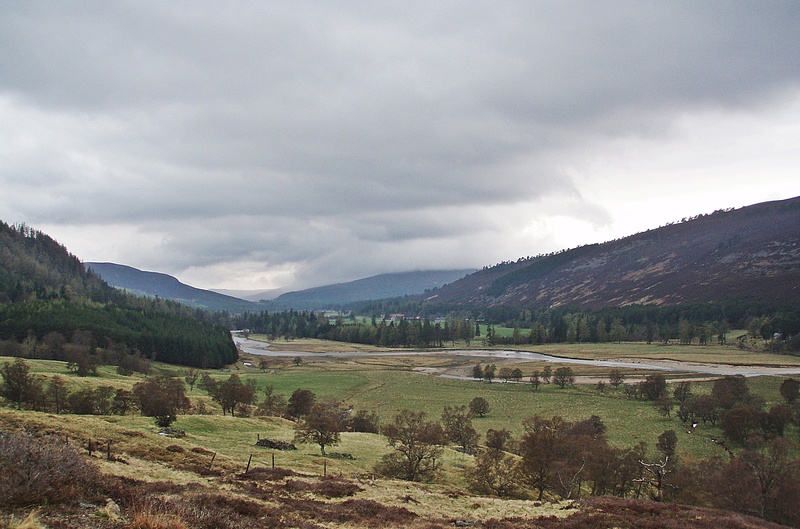 After that, we started off towards Braemar together, but soon I was walking ahead again. 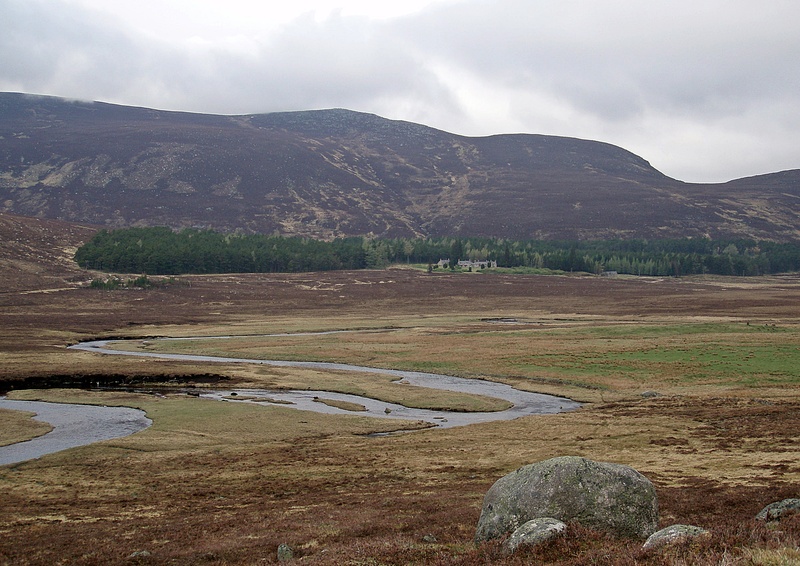 Approaching Braemar, it started to rain and although I had planned to camp (and had sent a food parcel to the campsite), I tried to find a room in Braemar instead. In town I met Alan who told me he just got a room for £ 45 at the Invercauld Arms, and suggested I should try it there. So I did, but they only had one room left, a triple bedroom for £ 130 which was a bit beyond my budget. Next I went to the Tourist Information, and got a sketch map with B & B’s and hotels marked on it. I walked to a few of them, but they were all fully booked. On the way I met Laura who said she’d be happy to share a room with me if I could find one. After buying a gas canister and some food, I continued my search for a room. 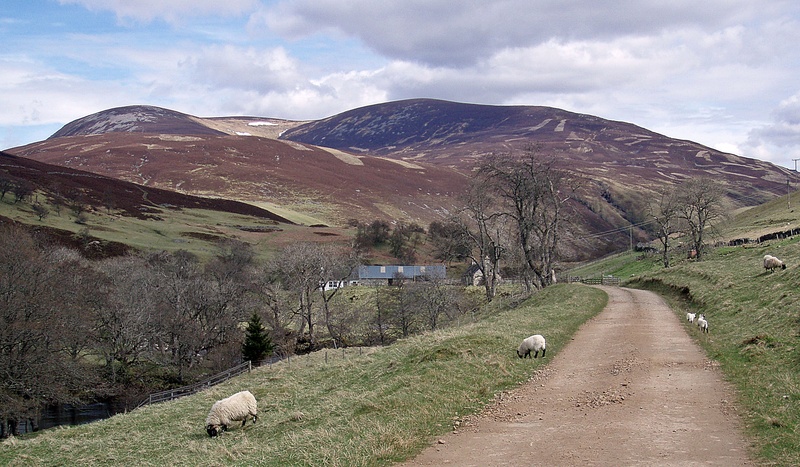 At Braemar Lodge Hotel I was offered one of the wooden 3-bedroom cottages for £ 100 for four people or £ 120 for six, and the B & B just across the road from there had a twin room for £ 70 due to a last-minute cancellation. The only problem was, I didn’t know where to find Laura (it never occurred to me to just go to the pub and find some people to share the cottage – later I found out that’s what she did). When I also found the YH fully booked, I resigned to the fact that I would have to camp after all, and made my way to the campsite. Instead of the numbered pitches, there seems to be a new system in place: The warden showed me around and gave me a choice of several pitches, carrying my food parcel all the way (!). Eventually I decided on a camp spot and pitched my tent in the rain. The rain became heavier during the afternoon, and after I had a shower and washed my hair, I sat in the tent and waited for the rain to stop so I could get out. I phoned Challenge Control and spoke to Sue who said she could actually hear the rain lashing down on my tent! When I realised that the rain wouldn’t stop anytime soon, I reluctantly left my tent and found the entrance to the campsite already flooded. After a very nice meal at the Invercauld Arms I walked over to the Fife Arms where, as usual, most other Challengers had gathered already. I met Paul and his wife Sue, Mick, Denis, Evan, Laura, Louise and many others. It was a good evening, but after several pints of cider I suddenly began to feel very tired (and a little bit drunk…) and walked back to the campsite. 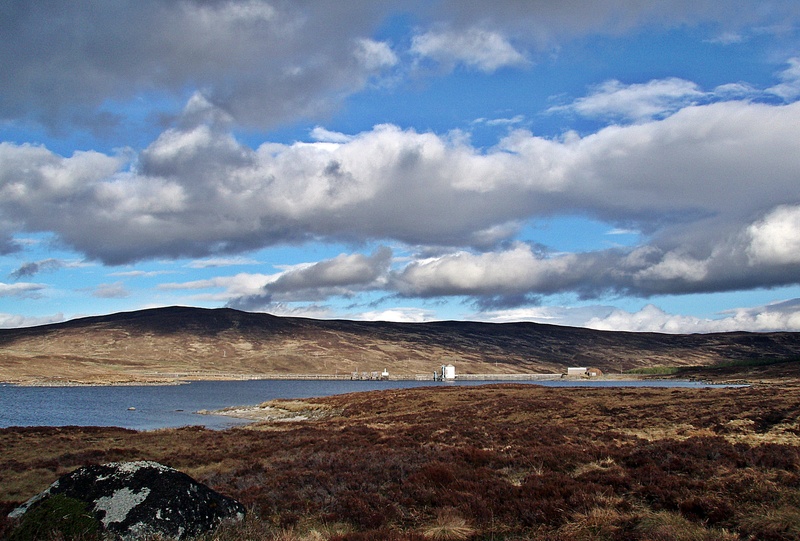 I had a leisurely start at 09:30 and walked along the A93 to Auchallater and then on to Lochcallater Lodge. Halfway along the track I caught up with Allan and his wife who had joined him for the first part of today’s walk and was now on her way back to the road. Although it was overcast, it was already very hot. We walked to the lodge together where we were greeted by Bill, and invited in for coffee and biscuits. A couple of Challengers who were staying there were helping out in the kitchen. When we had finished, Allan continued his walk along Jock’s Road, and Bill showed me around the house and took a photo of me outside. 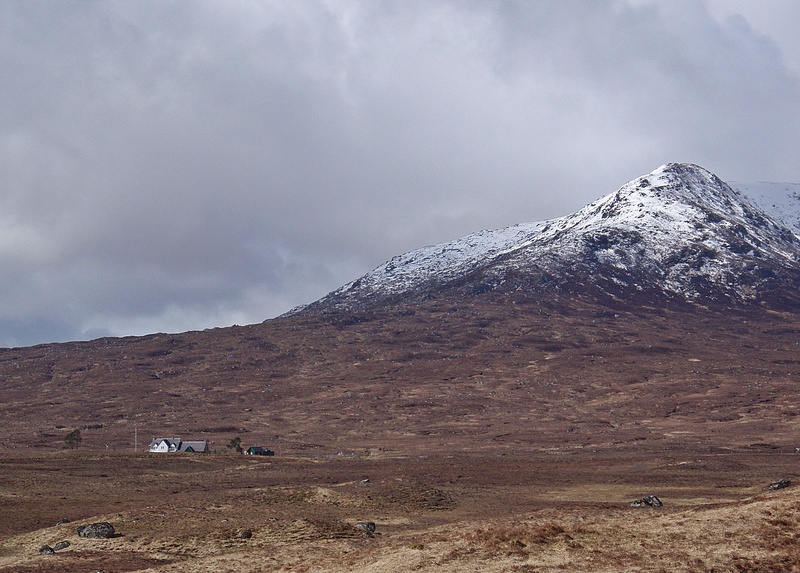 Then I headed up the path towards Carn an t-Sagairt Mòr. 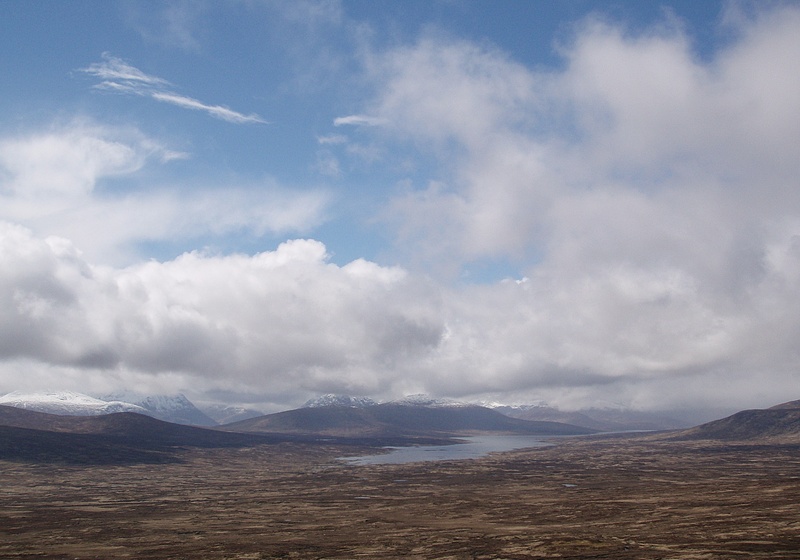 The clouds were still covering the tops, but occasionally I got glimpses of Loch Callater and the glen below. 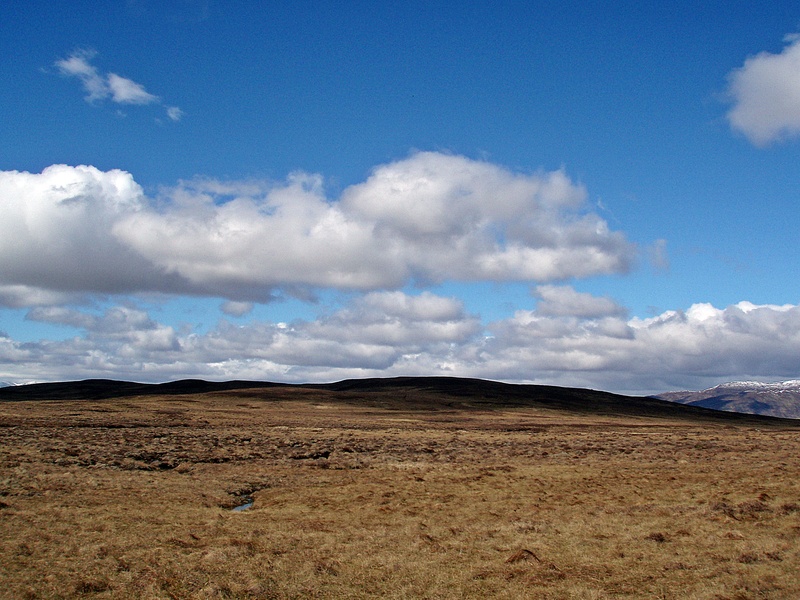 Cairn Bannoch on the left. 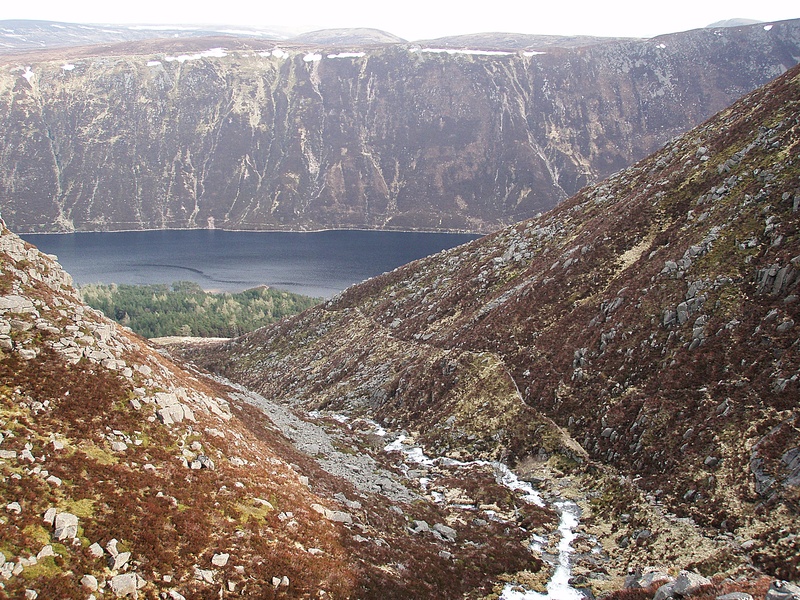 View down to Loch Muick. 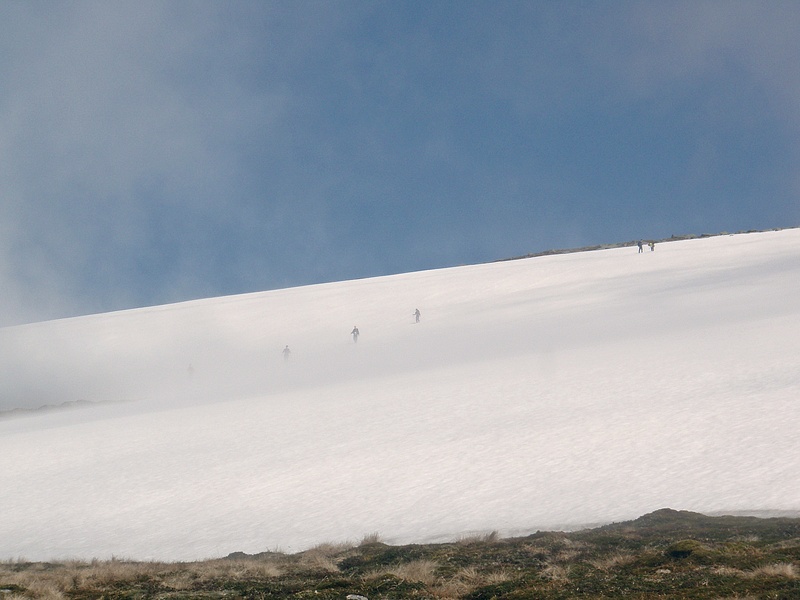 It was almost spooky when suddenly a group of walkers appeared in the mist, descending from Carn a’ Choire Bhoidheach. 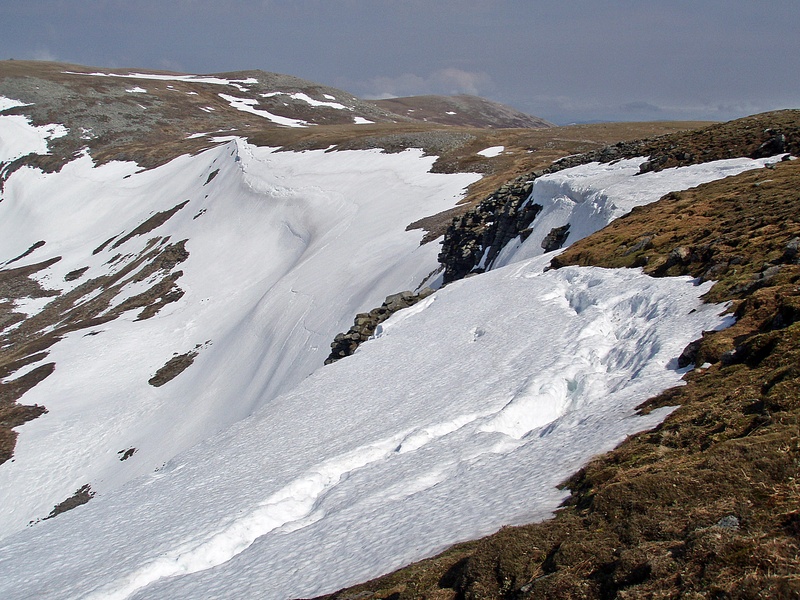 Although it wasn’t really that steep, I found the ascent in the soft snow quite strenuous. This must have been the warmest day of the Challenge so far, and I was struggling in the heat. 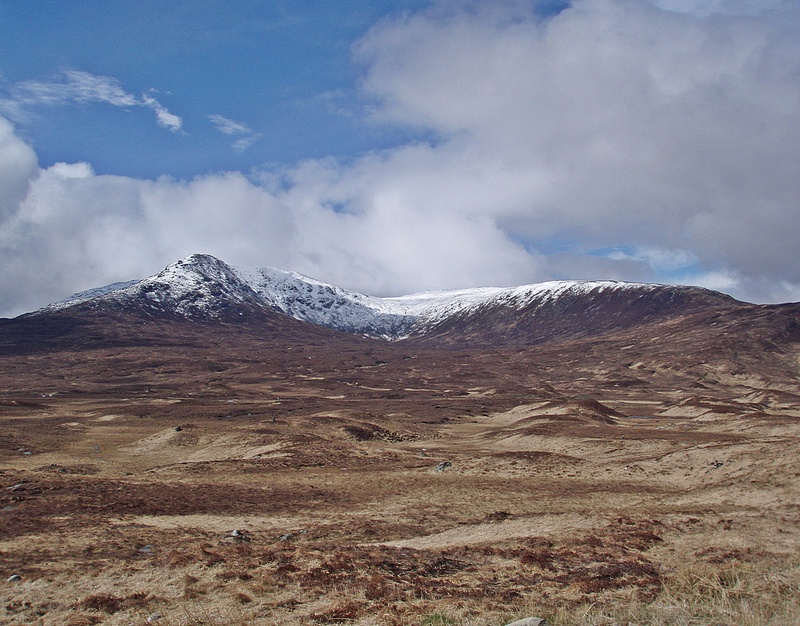 Looking back to Carn an t-Sagairt Mòr (on the right). Impressive cornice on The Stuic. 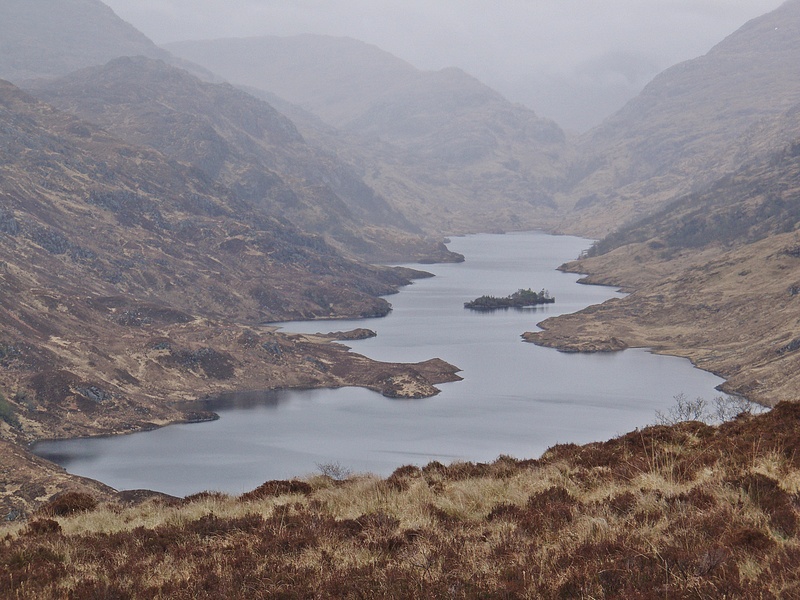 Loch nan Eun and Sandy Loch. 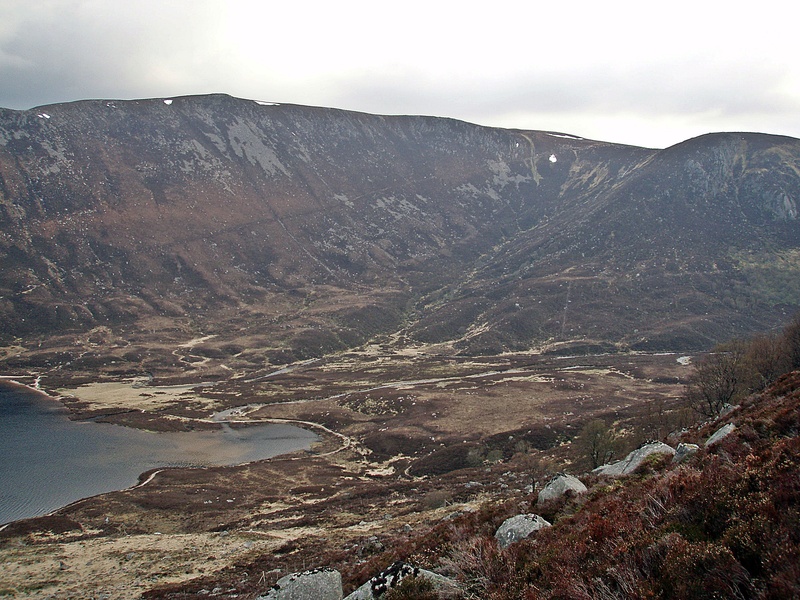 Crags E of Lochnagar’s summit. 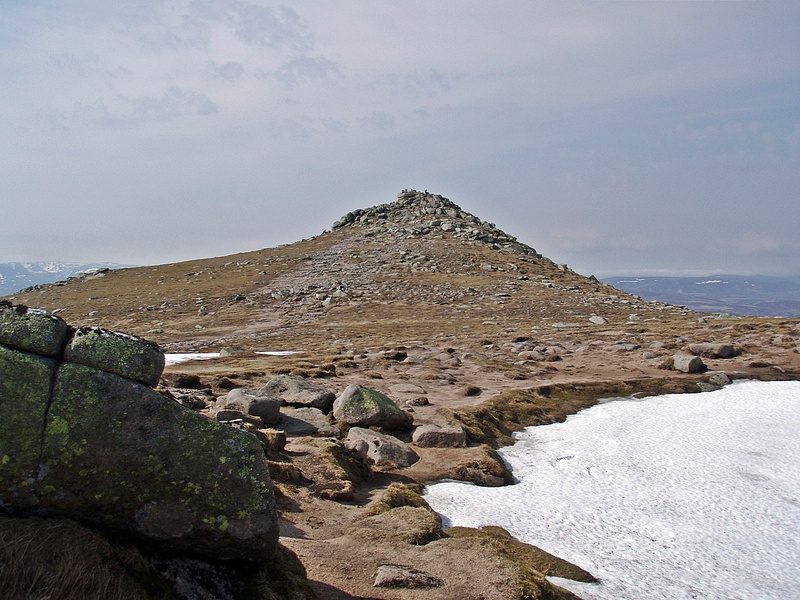 Cac Carn Beag – the summit of Lochnagar. 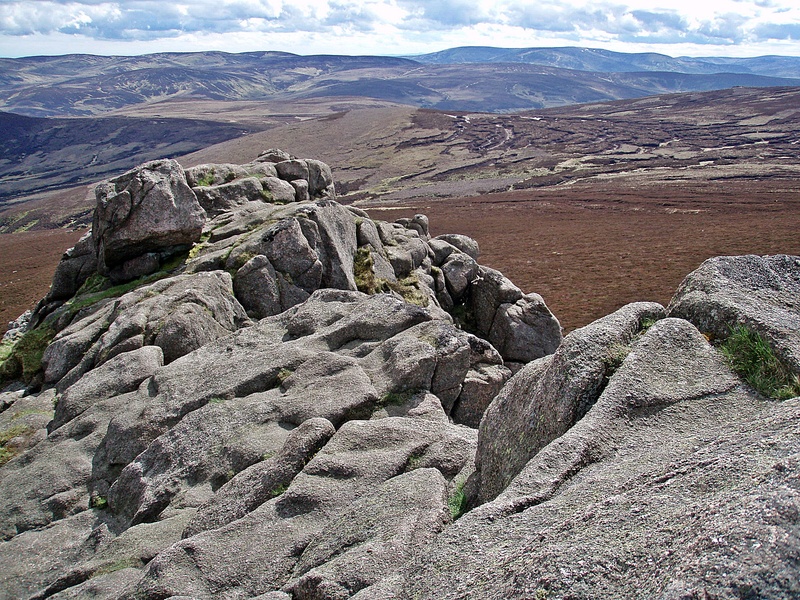 I left my rucksack beside a boulder, took some food and water with me and climbed up to the top, where Evan had been relaxing for a while already. 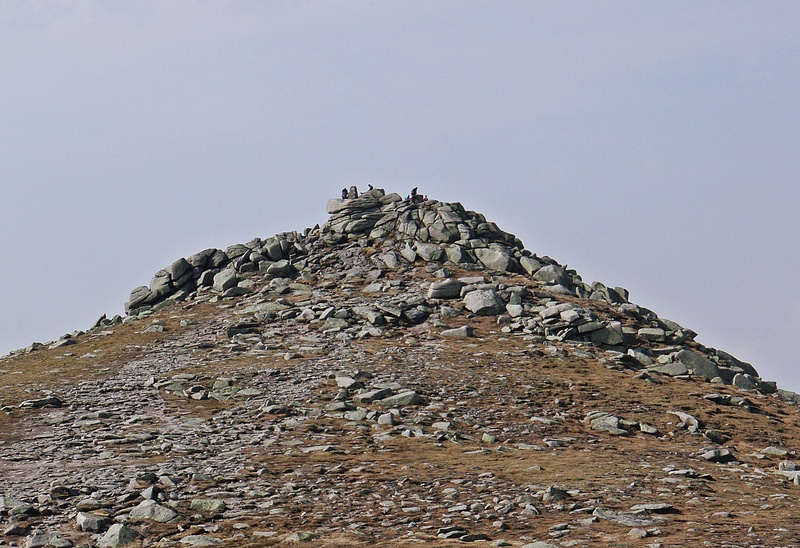 It was 16:30 and the summit was still busy with lots of day walkers. We sat there for half an hour, enjoying the sun and the views. 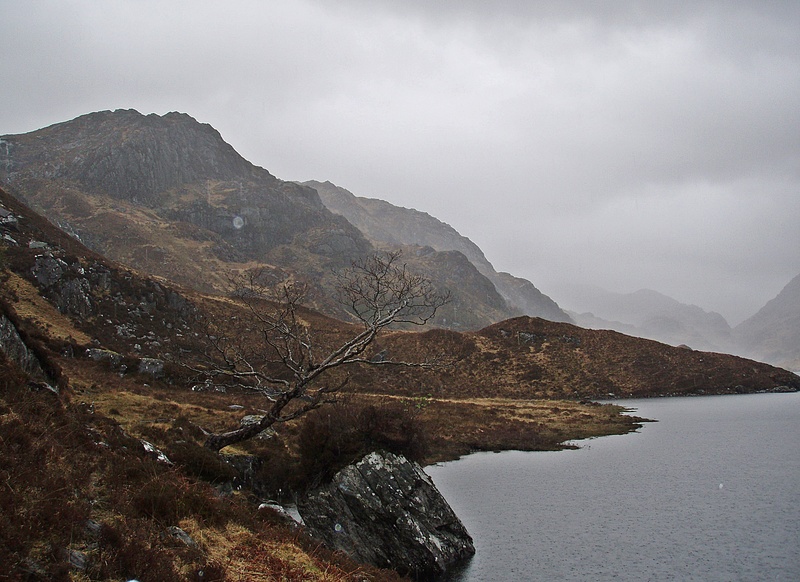 The Stuic and Loch nan Eun. 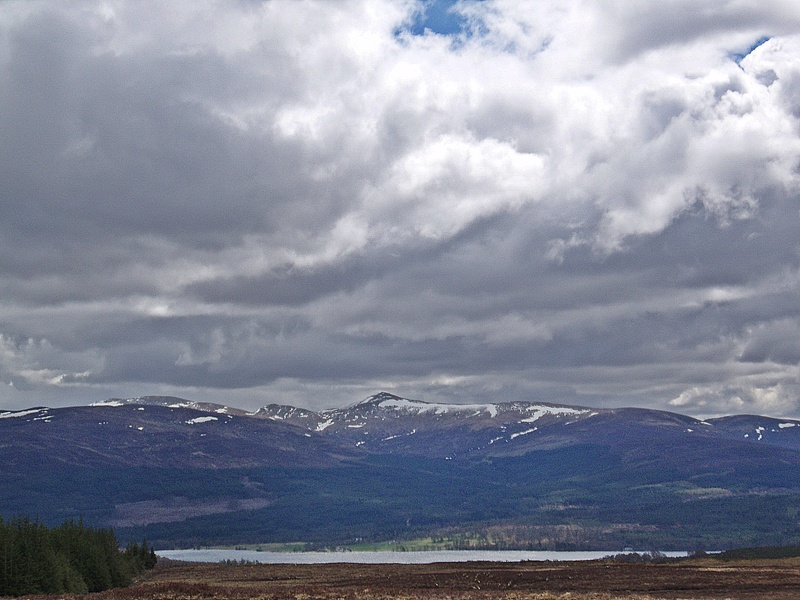 View N towards the Cairngorms. Dark clouds started to accumulate, but it was still very warm. Eventually we started heading down the path along the Glas Allt. 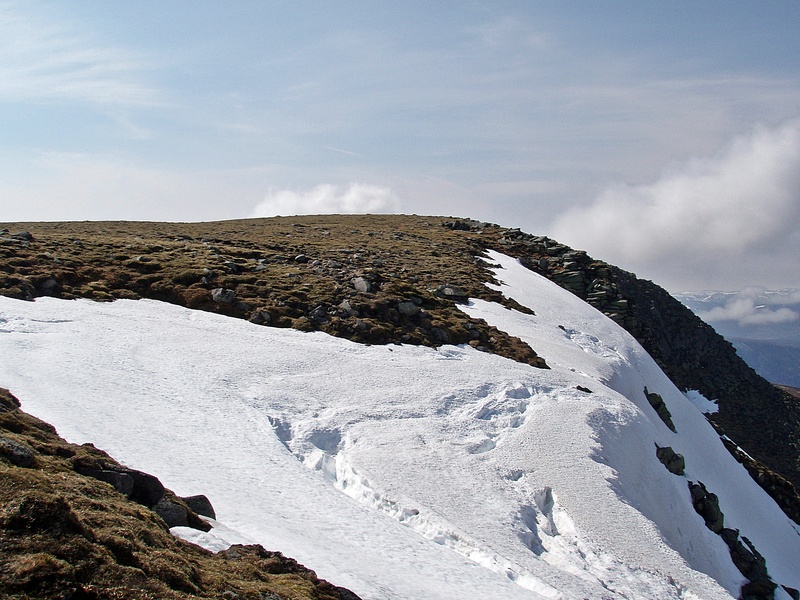 Large snow patches on the way down. 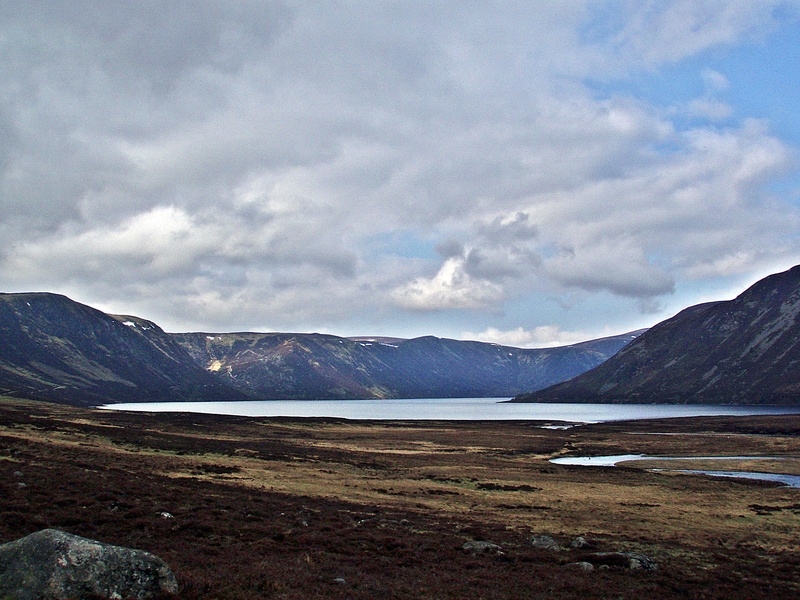 The W end of Loch Muick and Corrie Chash. 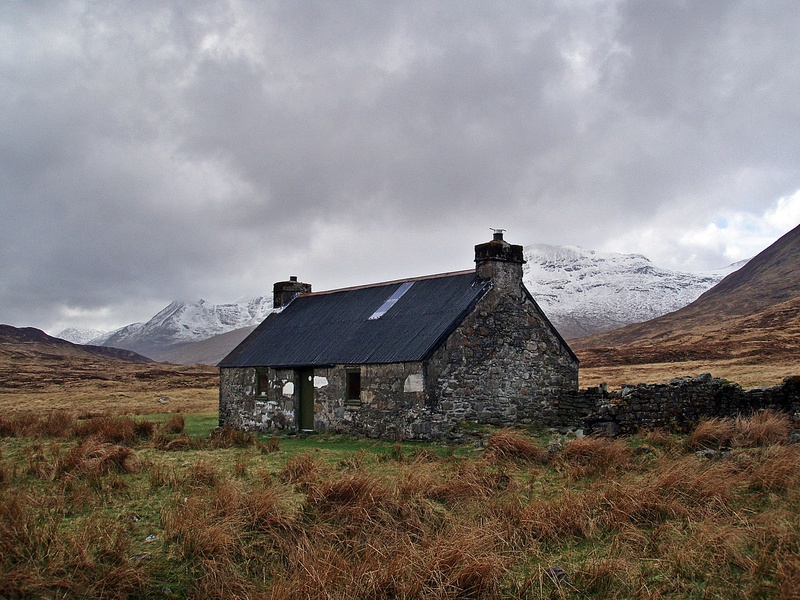 When we reached Glas-allt-Shiel, it took us a while to find the bothy tucked away behind the main building. I thought it was dark and not very inviting, and there were three sleeping bags spread out upstairs already, so we decided to camp. Evan found a camp spot in the forest very quickly, but I was a bit fussy and wandered around for half an hour to find the perfect pitch. I wanted to stay out of sight of the building, but also somewhere my tent would catch the morning sun. 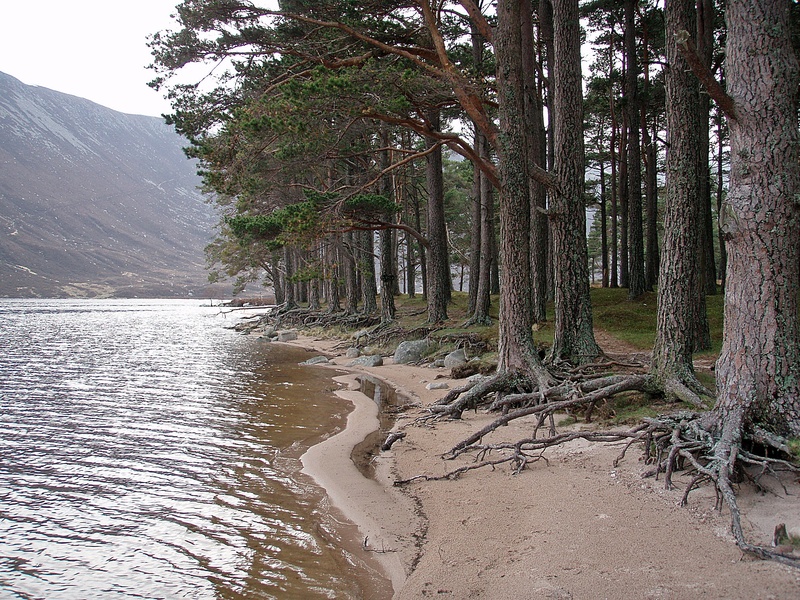 The banks of Loch Muick. 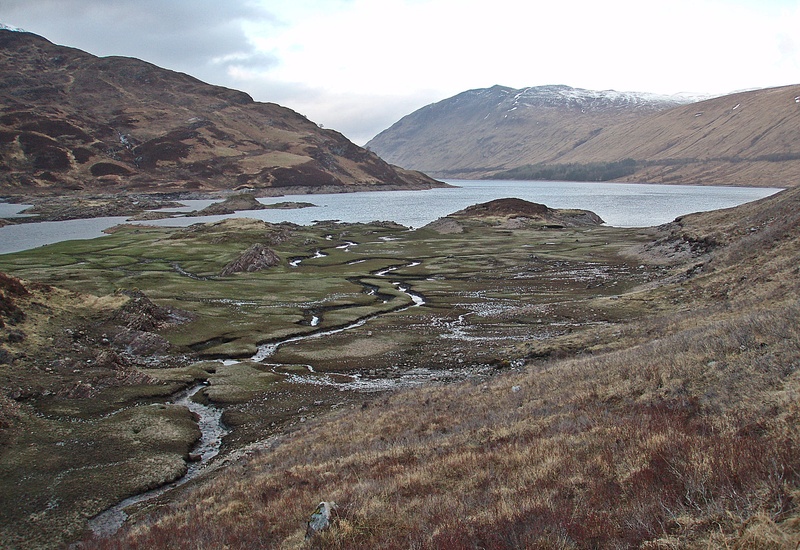 In the end I decided on a place right by the loch, beside the outflow of the Glas Allt. 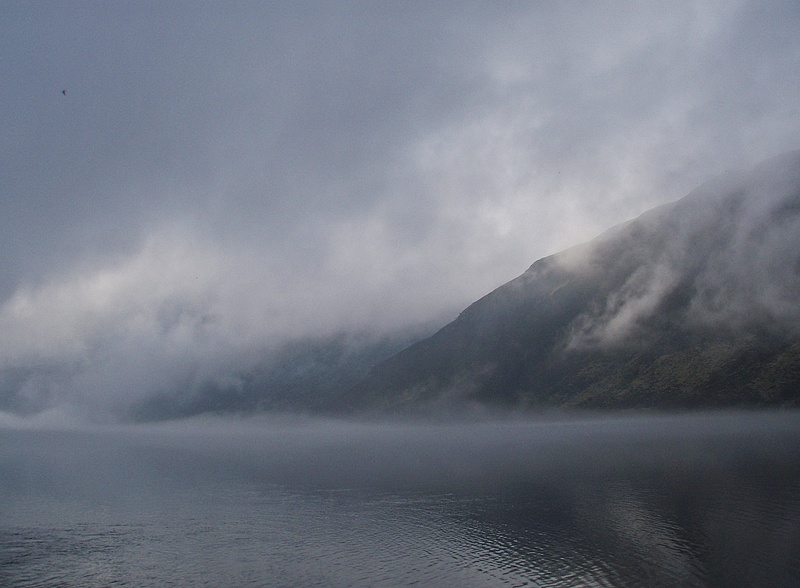 But it wasn’t too bad as the morning mist seemed to be lifting already. 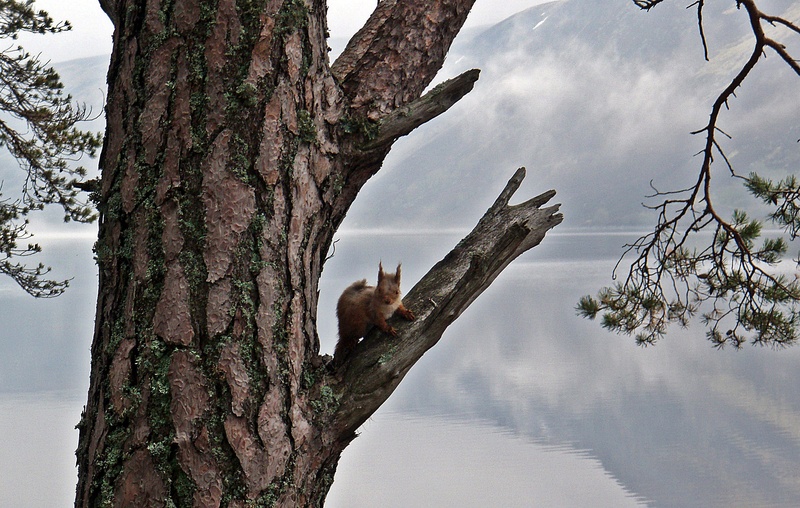 On a short walk along the lochside I spotted a red squirrel up on a tree. When I passed Evan’s tent shortly after 08:30, he was just having breakfast. 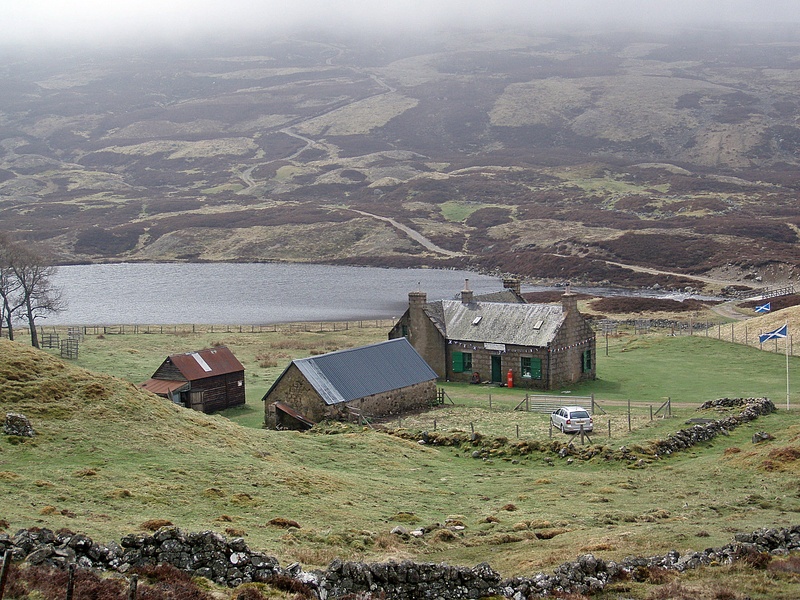 I followed the track along Loch Muick to the Boat House at its N end and then to the Visitor Centre at Spittal of Glenmuick. I had been looking forward to a hot drink or a soup at the Visitor Centre, but I didn’t have enough small change for the vending machine, and the soups were sold out anyway. 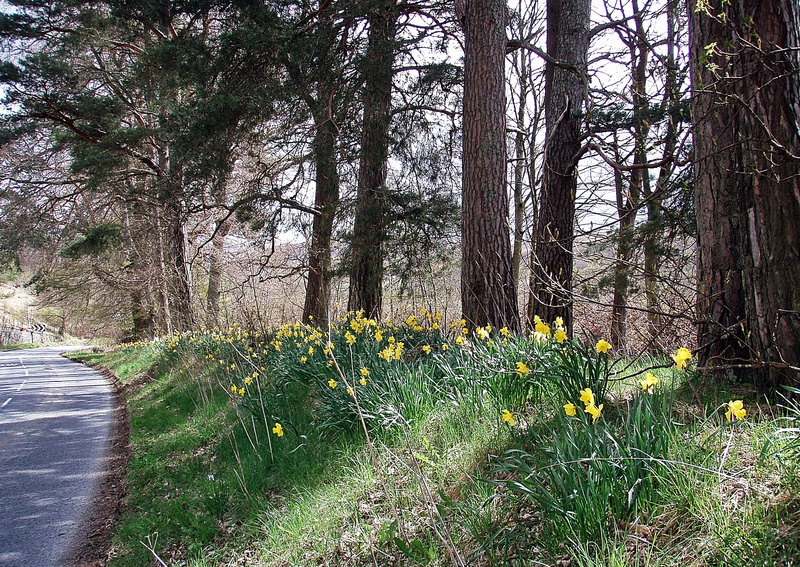 After a walk around the centre and a quick look at the exhibitions, I returned to the start of the path along the Allt Darrarie and followed it uphill. 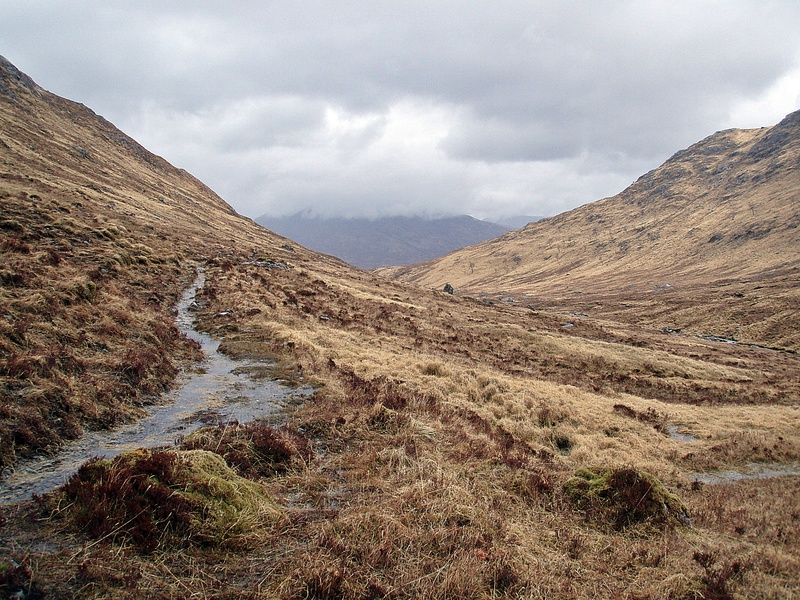 The path is clear all the way, but quite boggy and steep in places. 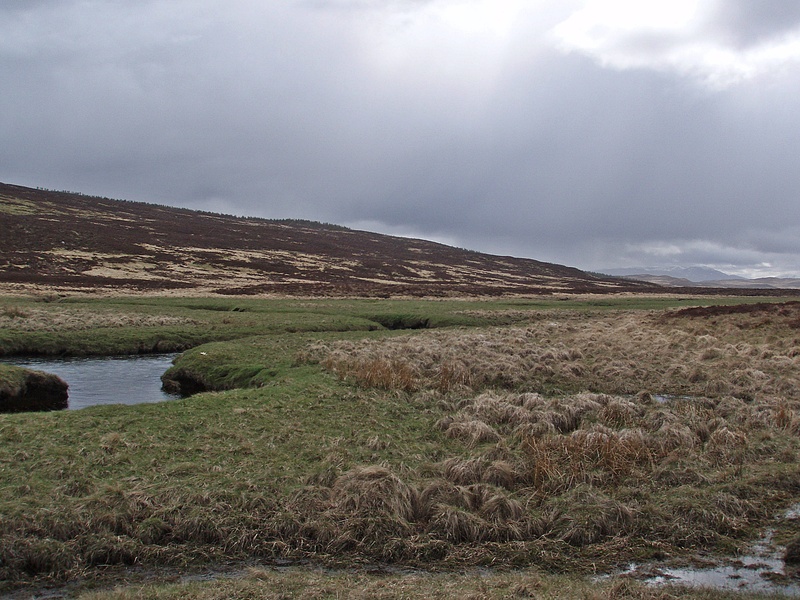 When the path petered out among peat hags and boggy, grassy terrain, I took a compass bearing to Shielin of Mark. 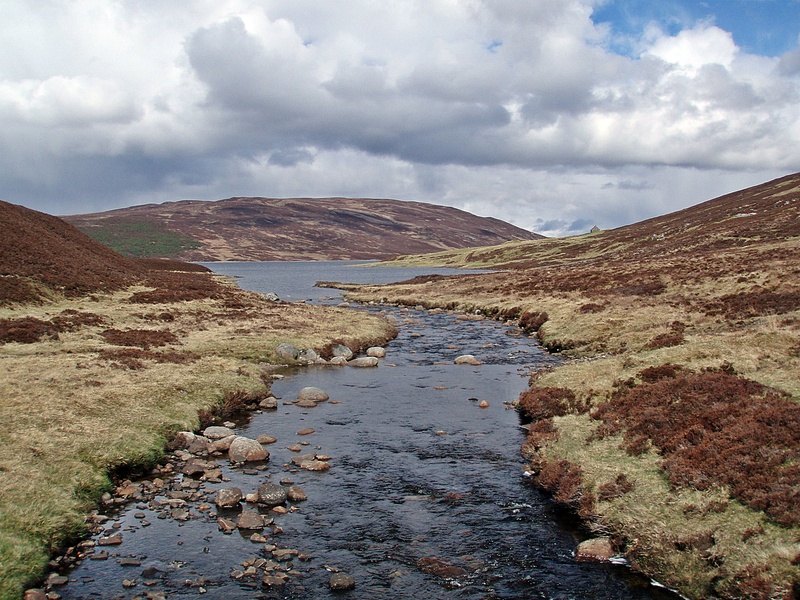 First glimpse of Shielin of Mark (centre) and the Water of Mark. 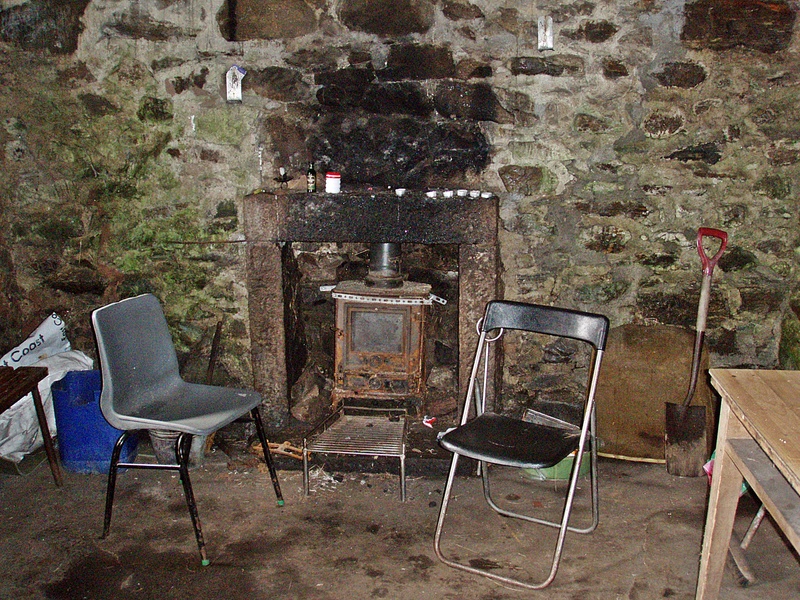 I had planned to have a lunch break in the bothy, but I found it dark and not very cosy, so I only had a quick read in the bothy book and carried on. 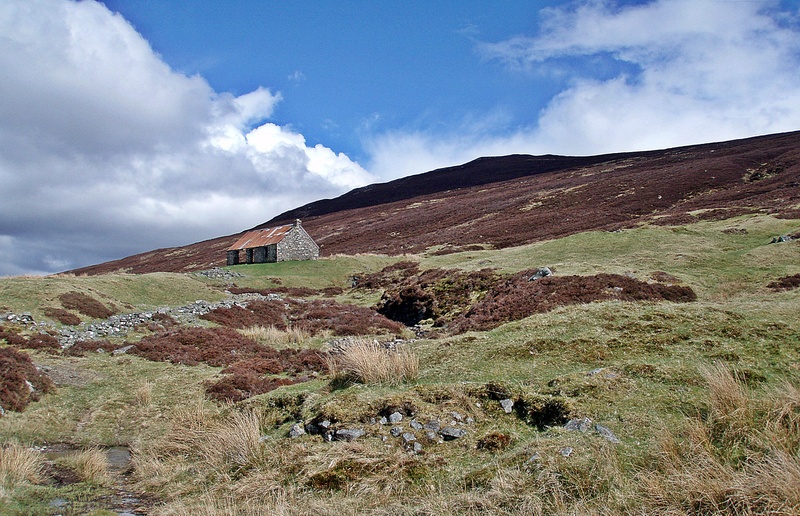 I left the bothy and walked downstream for a few hundred metres, managed to ford the Water of Mark with dry feet, and headed towards the summit of Muckle Cairn. 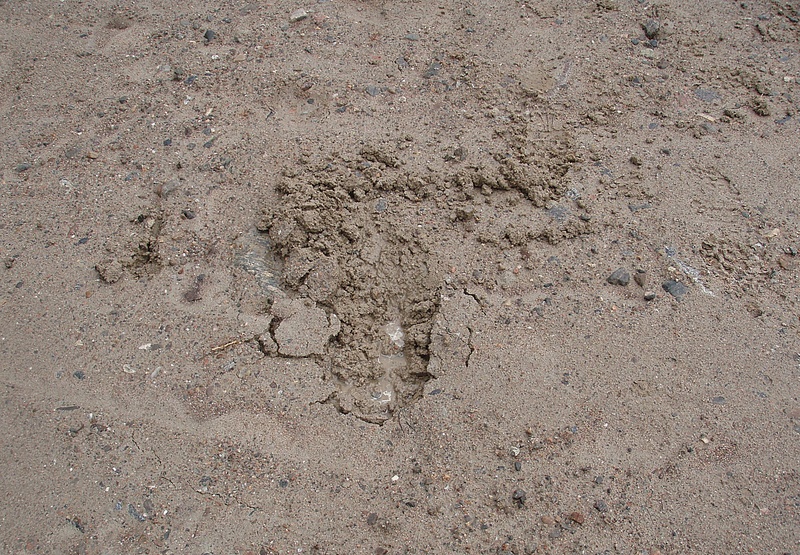 I found an intermittent path (or deer track, but there were boot prints as well) and soon arrived at the top. 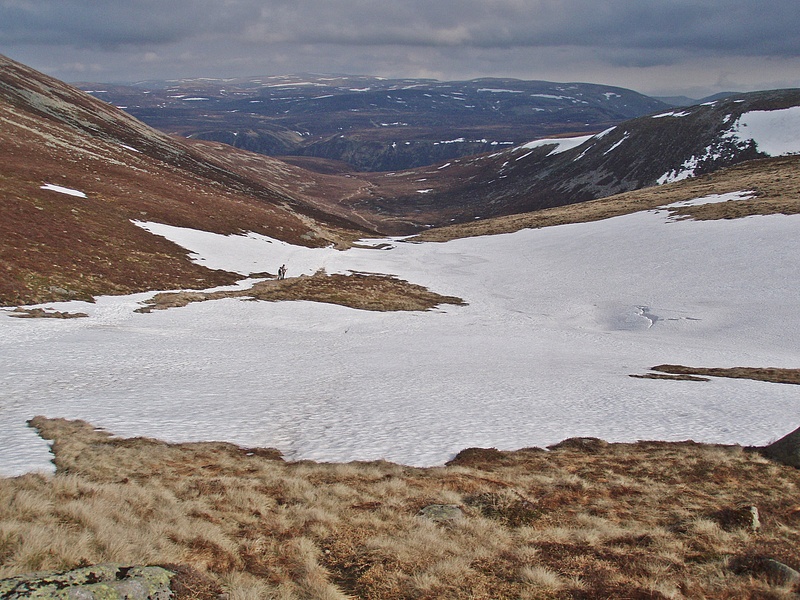 From the summit, a good track leads down into Glen Lee (Wolf Craig on the left). 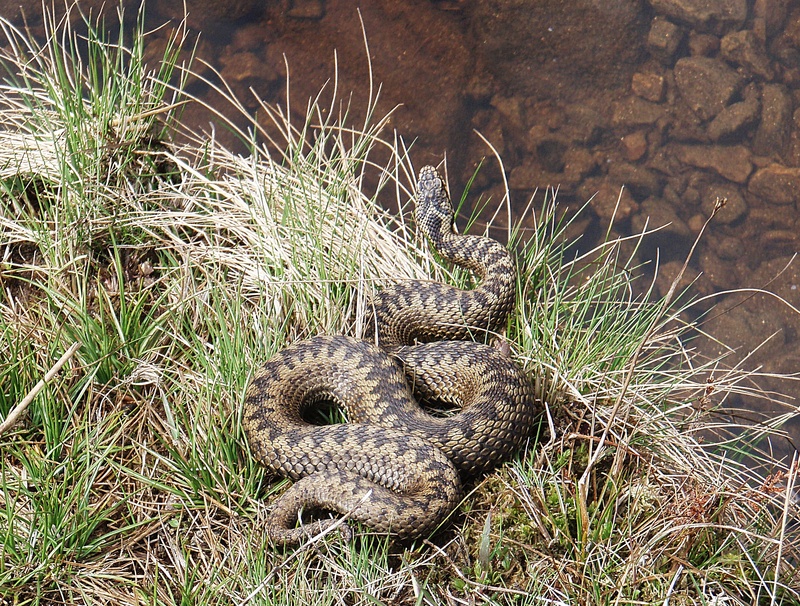 I had just enough time to take a photo, then it slid into the water, swam across (I didn’t even know adders could swim!) and after struggling a bit trying to climb up the rounded stones on the other side, it disappeared in the grass. At the Stables of Lee, I had a belated lunch break. I boiled some water for a coffee and a hot chocolate, carried a chair outside and sat in the sun for almost an hour. While I was packing up my stove, Dave aka Skippy came along and stopped for a brief chat, but he seemed to be in a hurry to get to Tarfside and disappeared quickly out of sight. 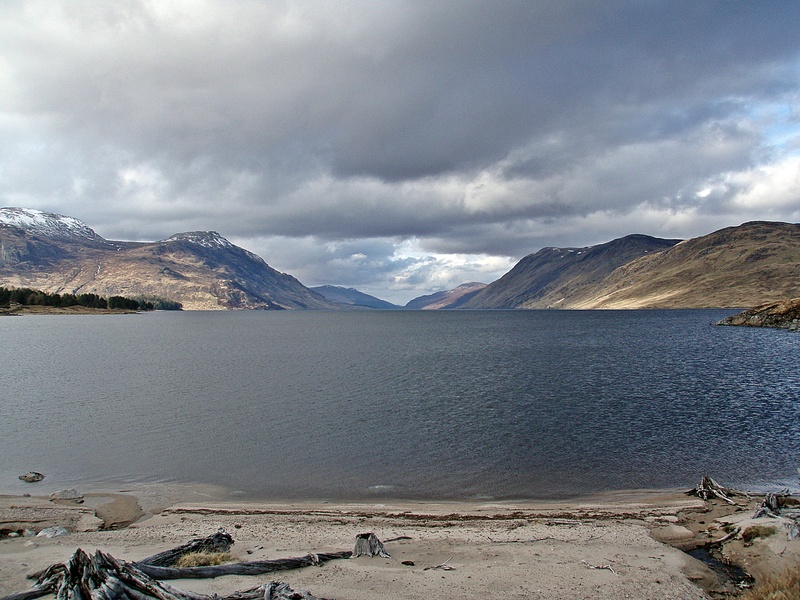 Inchgrundle at the W end of Loch Lee. 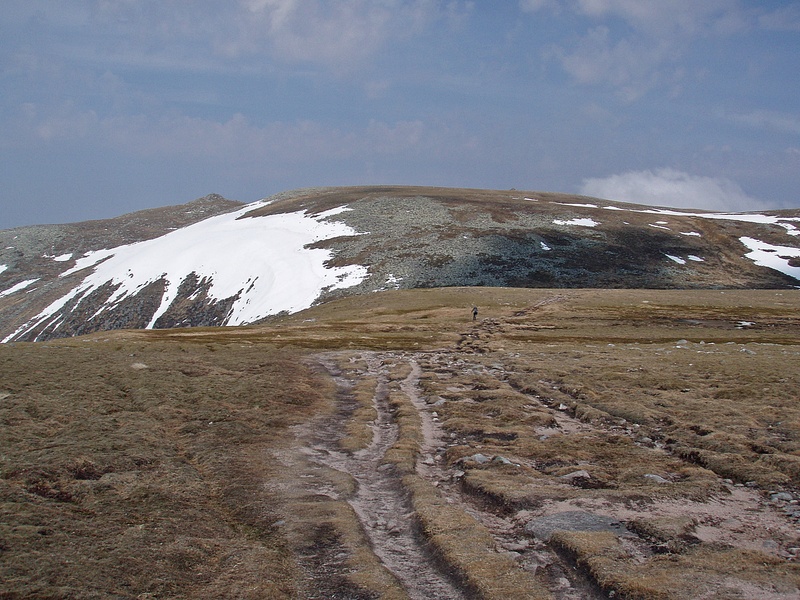 Walking on a hard-surfaced track and then on the road, my feet began to hurt again, and I was very relieved when I reached Tarfside at 18:30. First I made my way to St. Drostan’s Hostel which I remembered from my first Challenge in 2011. Everyone had been sitting around a big table in the kitchen, with lots of food and drink available, but I had felt so dehydrated that I couldn’t eat anything, and another Challenger had come to my rescue and given me a bottle of Irn Bru. 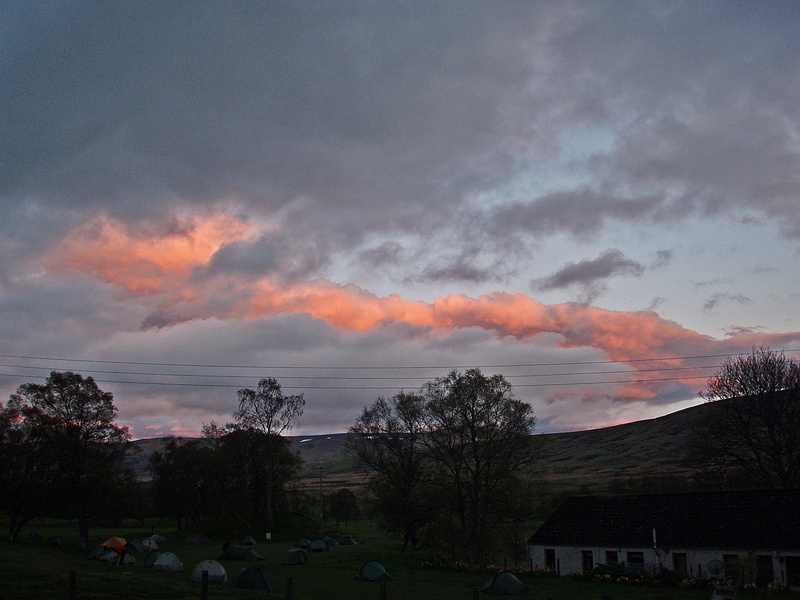 When my energy levels were restored, I walked to the campsite, pitched my tent and had dinner. Afterwards I went across the road to the Mason’s Arms, another place I had to give a miss in 2011 because I had felt unwell. There I met lots of “old” and “new” Challengers for a good pub evening – Jackie and Emily, Gordon, Evan, Dave, Alan, Mike, and Frank to name but a few. 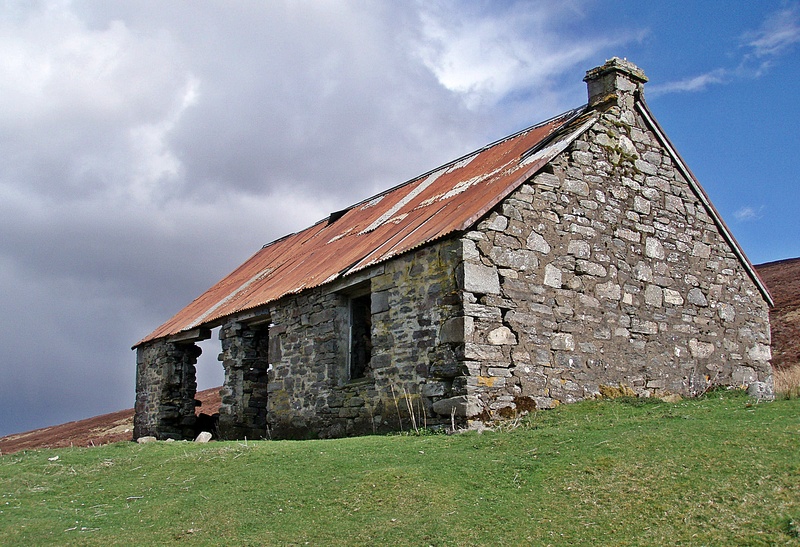 Shortly after 09:00 I started walking down the road past the church, taking a left turn at Cairncross farm. 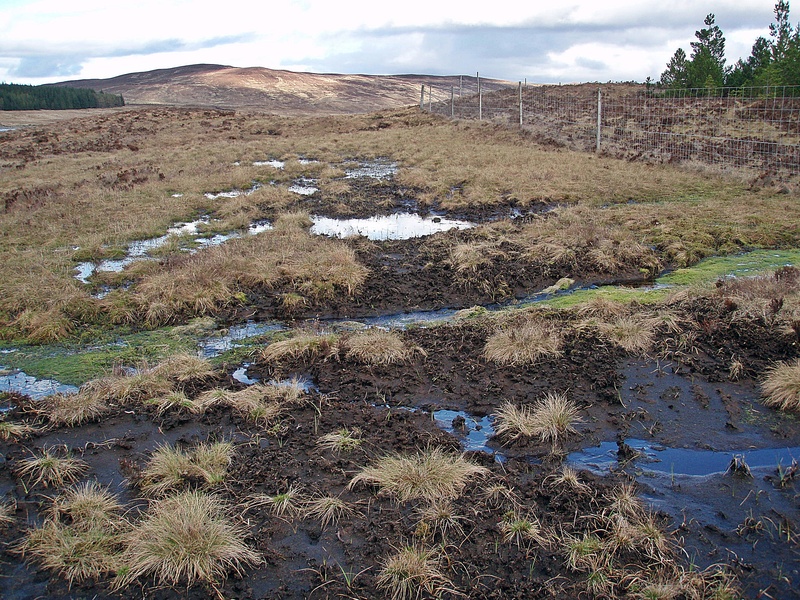 On my way to Mile Cairn I came across a herd of cattle with calves, and to avoid them I made a detour across a very boggy field. 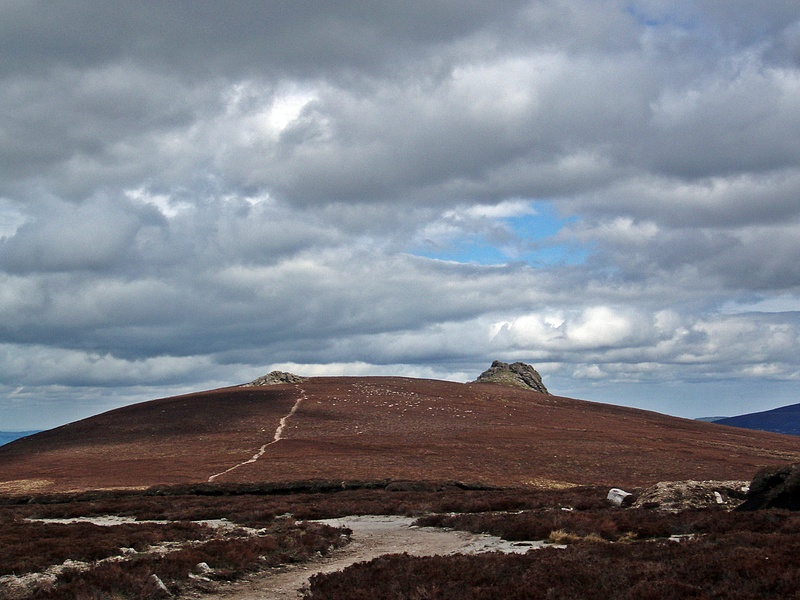 While I climbed up the steep track to Brown’s Towers and Mount Een, it became very windy and cold. I stopped to put my Primaloft jacket and a pair of gloves on. 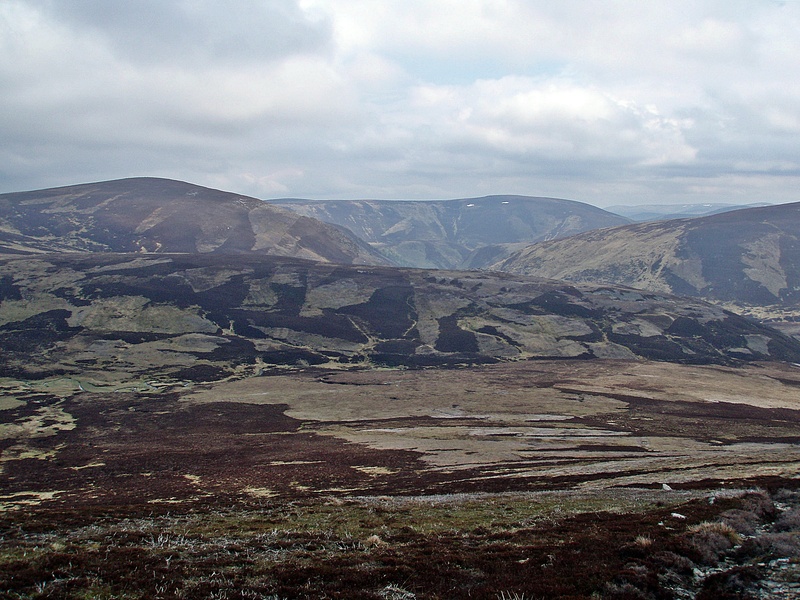 On the way up Wester Cairn I met an elderly couple who were taking a rest, and I first assumed they were fellow Challengers, given the size of their rucksacks. 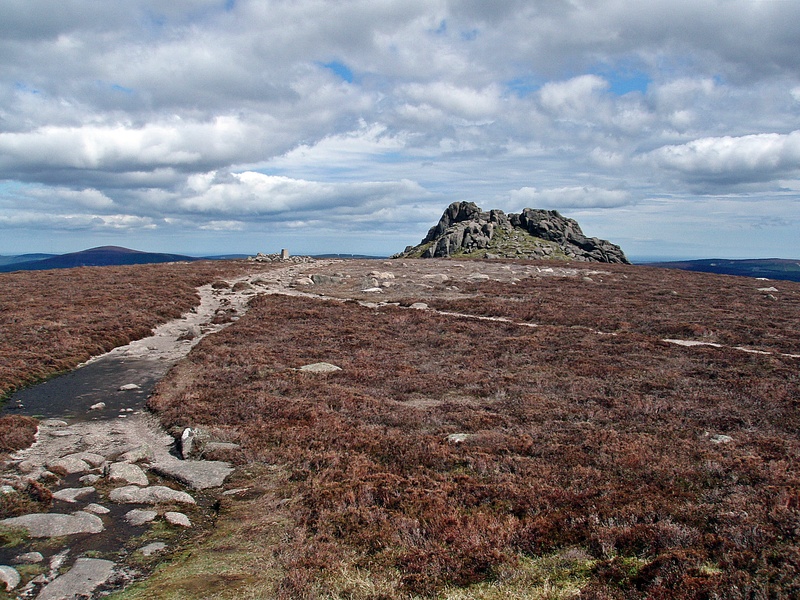 But they were day walkers who had started from Millden Lodge in the morning, and were on their way to Mount Battock. I needed a short break before the last ascent, and they were soon well ahead of me. 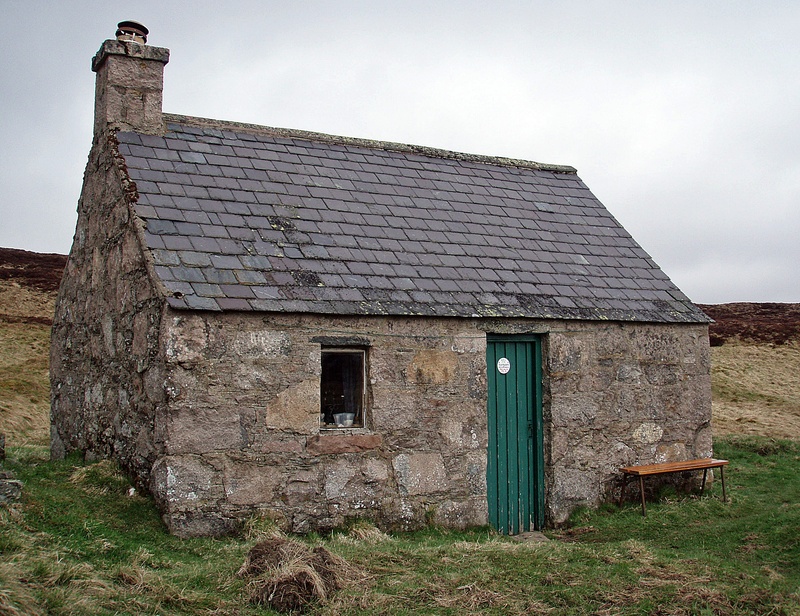 When I reached the trig point and summit shelter, I joined my fellow walkers in the shelter for a rest and a chat, but I soon started to feel cold again and had to move on. 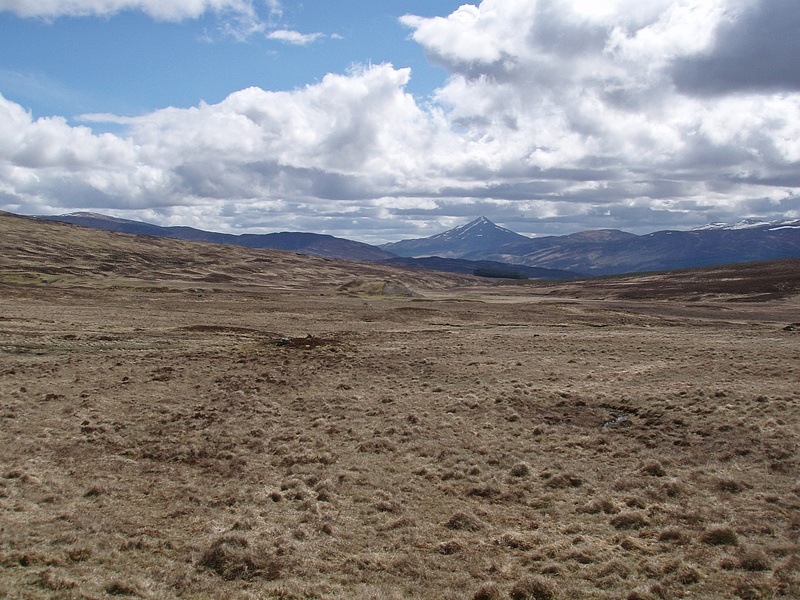 My next target, Clachnaben, in the distance. 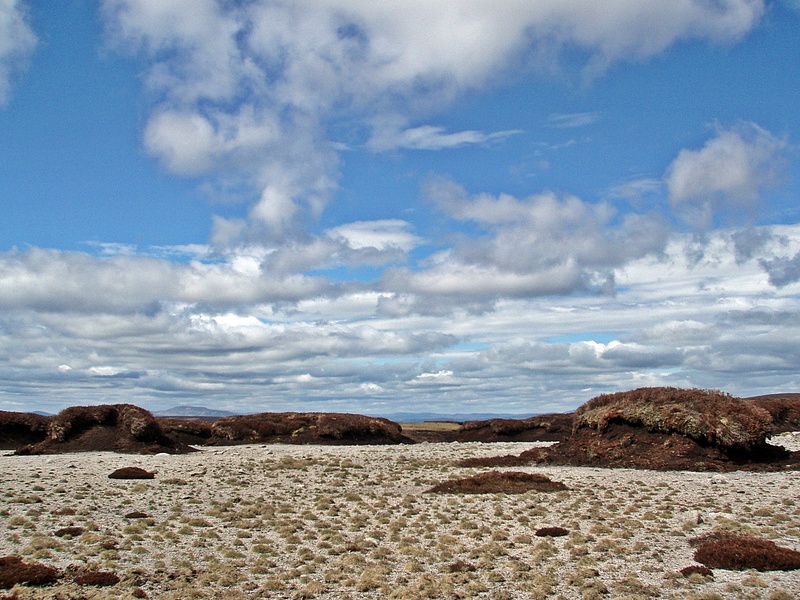 Unusual landscape on the way to Clachnaben – it looks like a sandy desert dotted with peat hags! In the meantime the wind had eased and it had become a lot warmer, so that I could shed some layers before I approached Clachnaben. 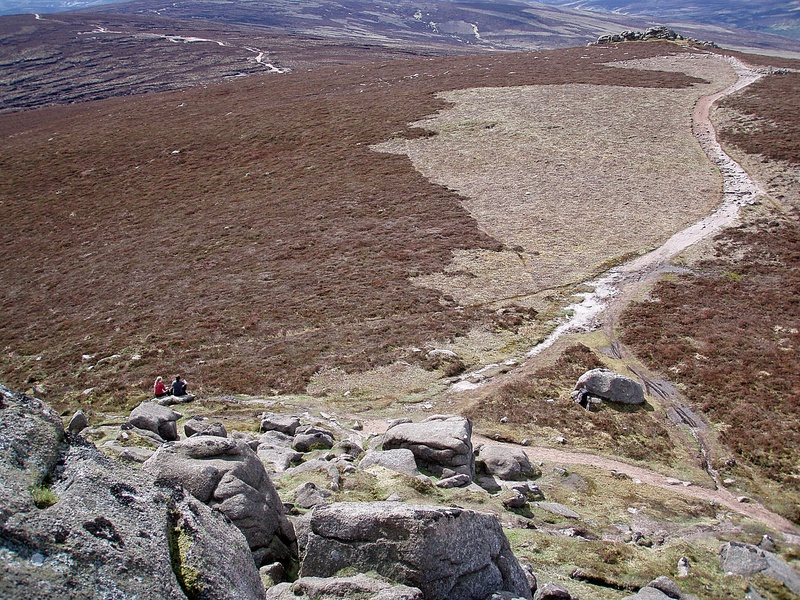 I left my rucksack at the bottom of the tor and scrambled up to the top. 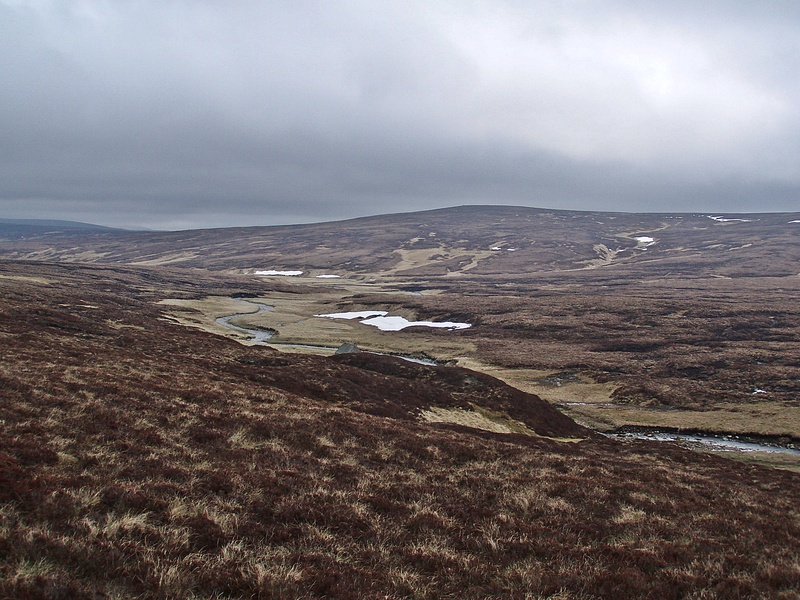 From the summit I followed a path N towards the Wester Burn, but after crossing the stream I couldn’t find the path that’s marked on the map. 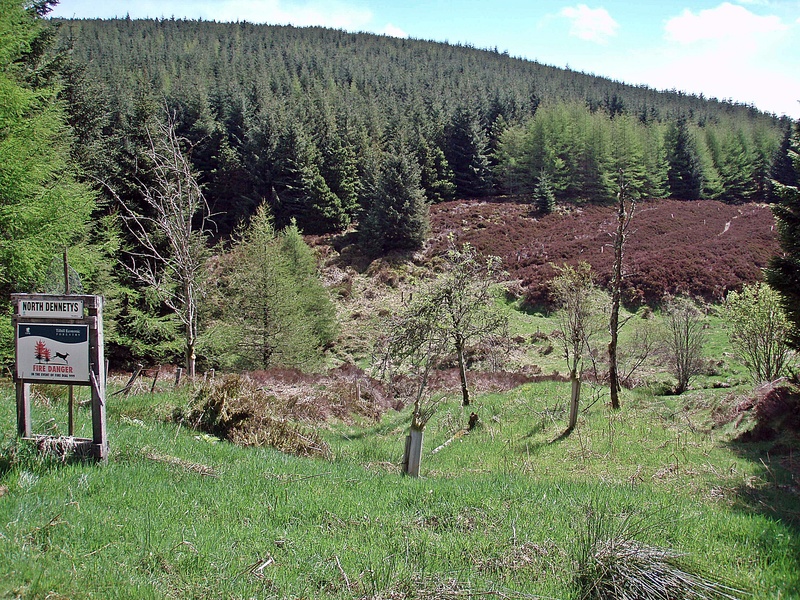 Instead I contoured around the Hill of Westerburn until I reached the track that leads down into the forest. Back at the campsite, I put up my tent, had a shower, washed some clothes and had dinner. I even got a phone signal and could access the internet. Checking the Challenge message board, I read some bad news about my planned route through the Fetteresso Forest. 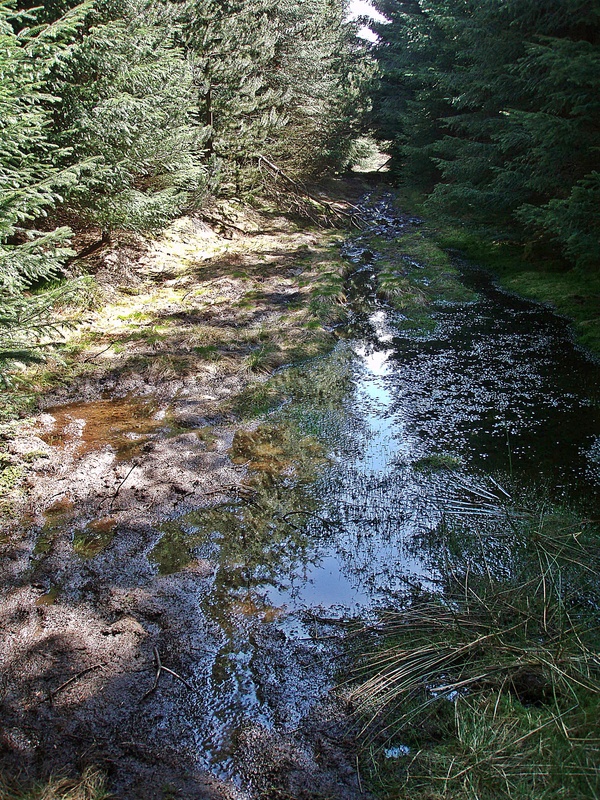 One Challenger who had already finished, reported cows blocking the access path to the Forest. 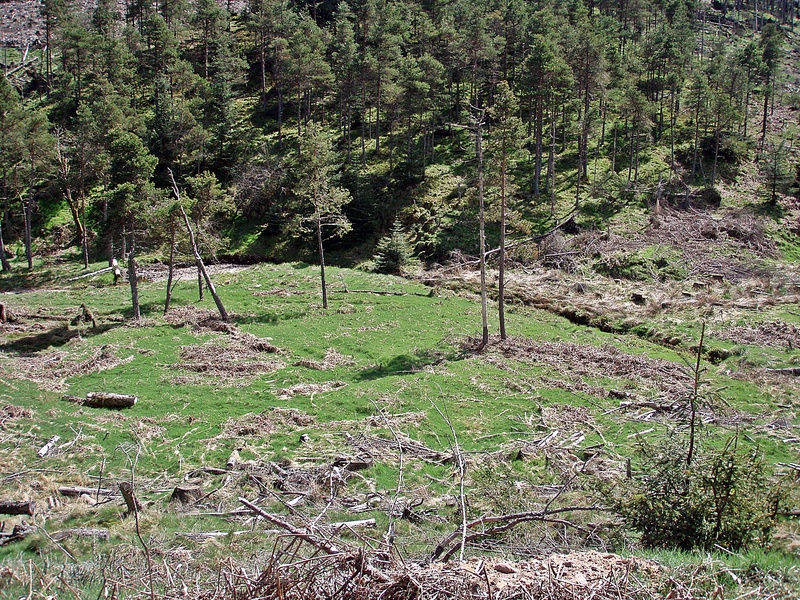 It might also be difficult to find a place to camp, as there was a new windfarm being built in the middle of the Forest, besides there was a possibility that water sources might be contaminated due to the heavy machinery moving about. 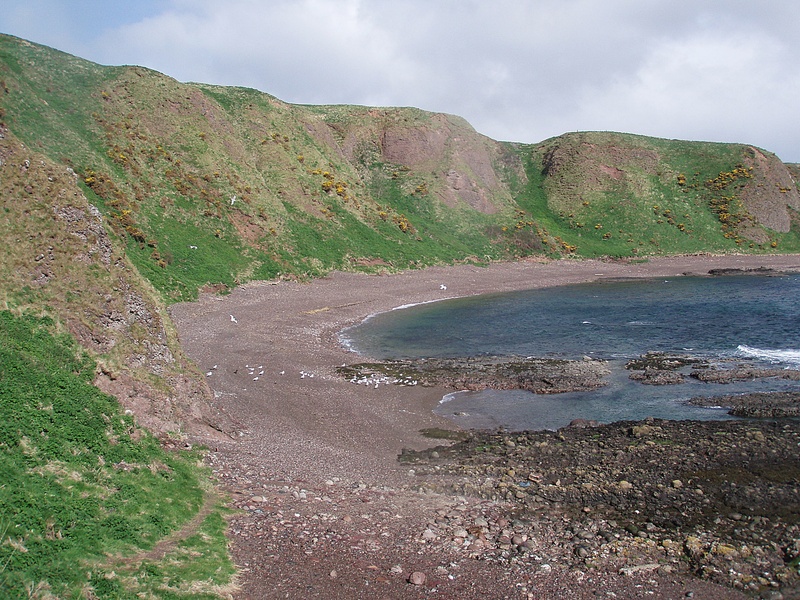 That didn’t sound good at all, and after studying my maps, I decided to continue to Stonehaven instead, try and find a campsite or a B & B and walk to Dunnottar Castle the following day. When I left the campsite in the morning, I walked past Alan, Rod and Bernard who had camped nearby and were just packing up their tents. 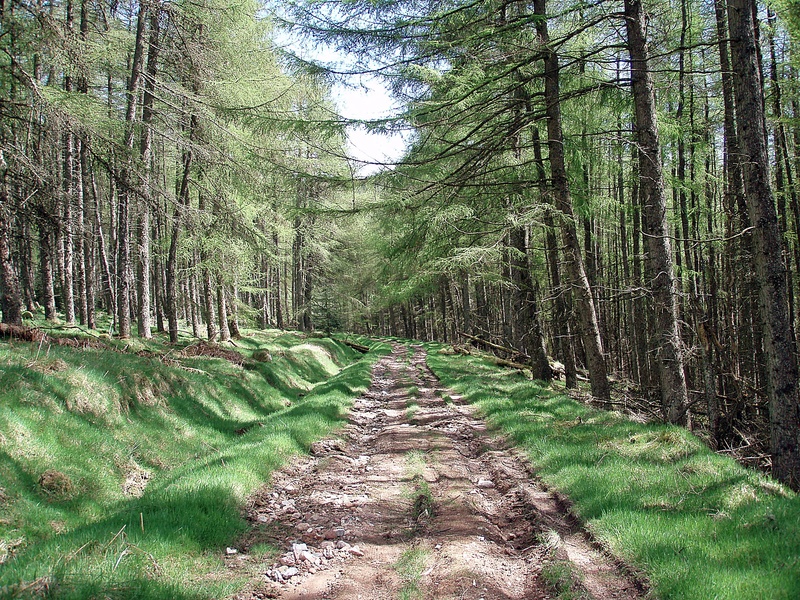 I mentioned the issues with the Fetteresso Forest to them, because their planned route was similar to mine. 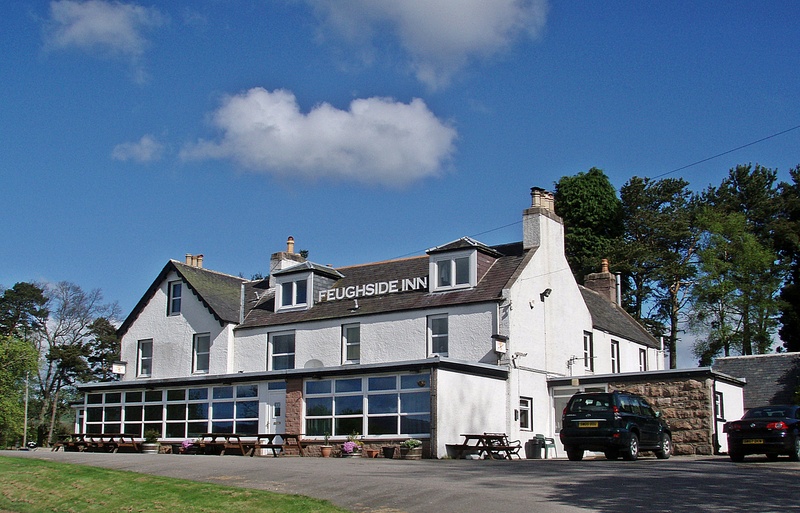 On my way, I passed the Feughside Inn which is sadly closed now (when I had planned my route in late 2012, I was hoping to have a bar meal there, but in the meantime it had been closed and put up for sale). 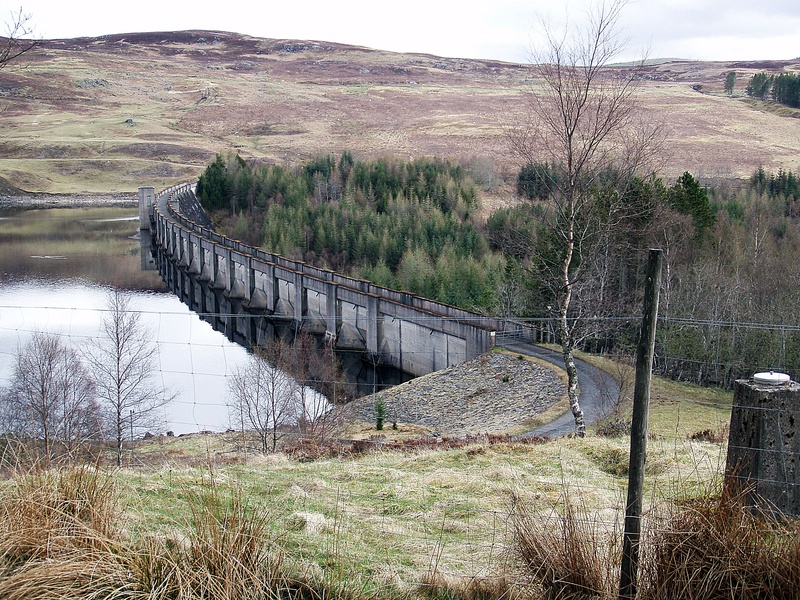 I walked E along the road to Strachan, crossed the bridge and followed the minor road to Moss-side. 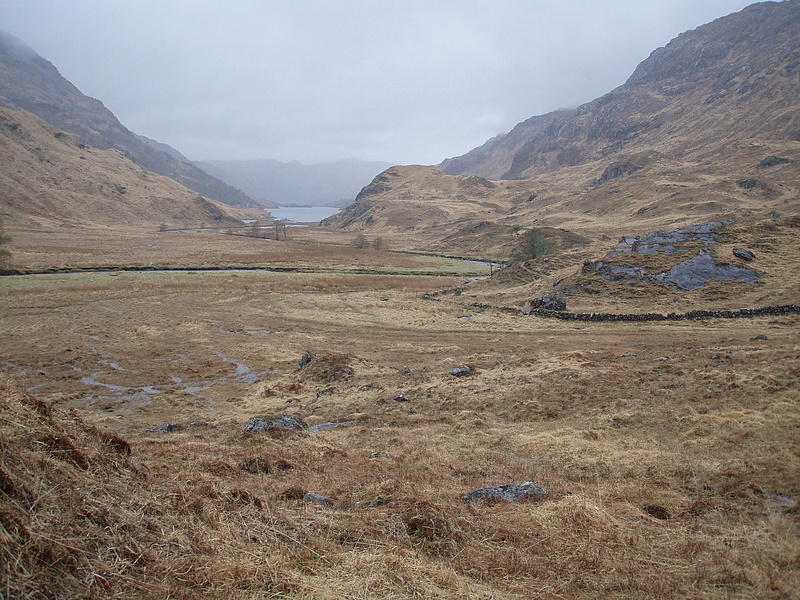 My plan had been to use the track shortly after Moss-side that leads directly into the Fetteresso Forest, but I could see from the distance that a large herd of cattle was grazing on and around that track. Instead I walked towards Pitreadie Farm, where I met the farmer on his tractor coming towards me. He stopped and climbed out of his tractor when I asked him if there were any cows further down this track. He was very friendly, assured me that there were only sheep around, was very interested in the Challenge and finally showed me the best way to cut across to the forest track I needed to take. 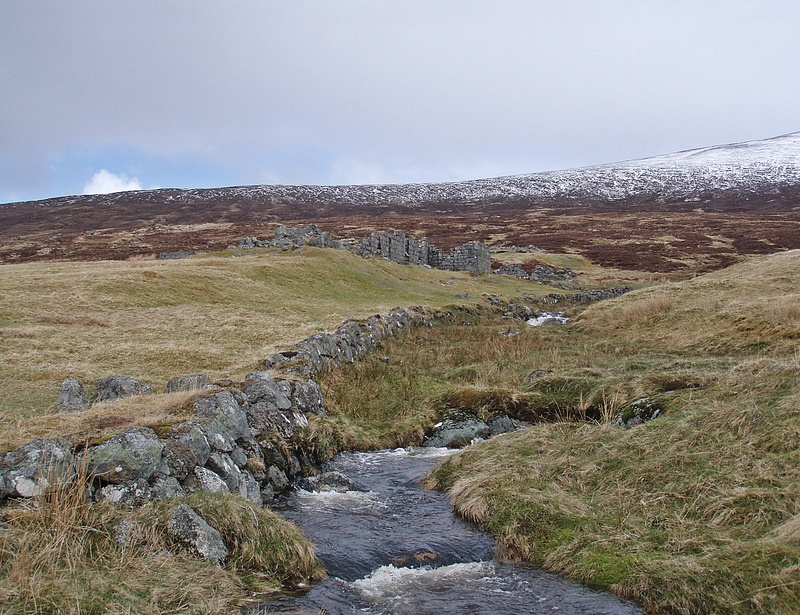 I found the path that he had described, it leads to a stream crossing by the ruins at Upper Curran and from there easily onto the main track. The next few hours I spent walking through the Fetteresso Forest, mostly on forest roads, but also along some very boggy sections. Near North Dennetys the path leads down to a stream crossing at a clearing in the forest, I found this quite an idyllic place and one of the few suitable camp spots. 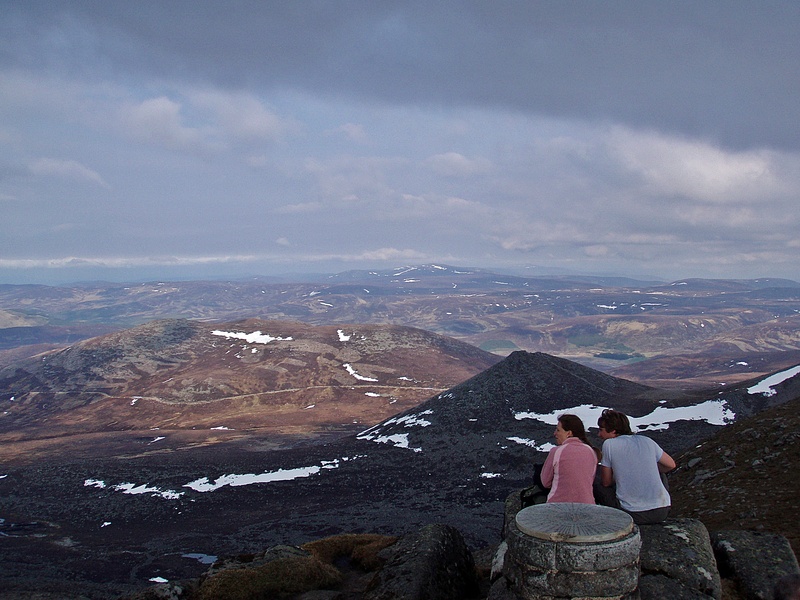 Here I met Joy, who had also camped at Feughside, and was now having a lunch break. While we were talking, Joy walked past and I caught up with her some time later. 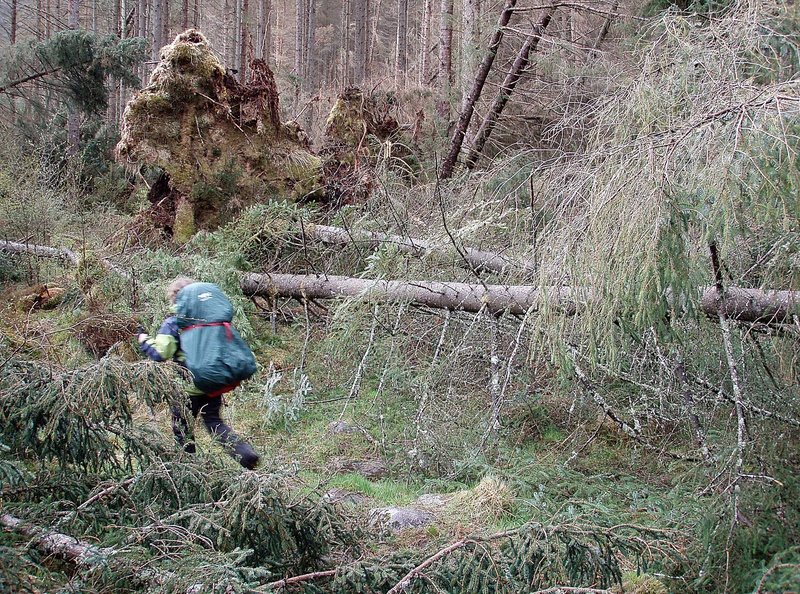 She was actually going to camp in the forest, while I continued to Stonehaven. 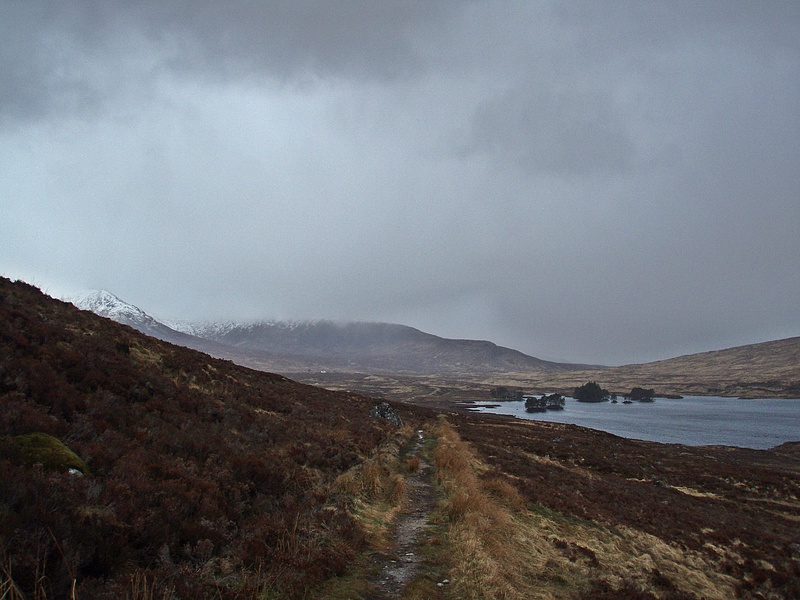 Once I had left the forest, the weather changed, and I walked along a minor road in a mixture of hailstorms, sun and wind. Near Upper Swanley I met Alan, Rod and Bernard again. Rod told me about a major conference taking place in Aberdeen and that it might be difficult or even impossible to find accommodation in Stonehaven. The three of them were going to stay at Rod’s place, and he even offered me his phone number in case I couldn’t find anywhere to stay – but I politely declined this, thinking that I should be able to find something in a place like Stonehaven with lots of hotels and B & B’s (big mistake, as I was to find out later!). 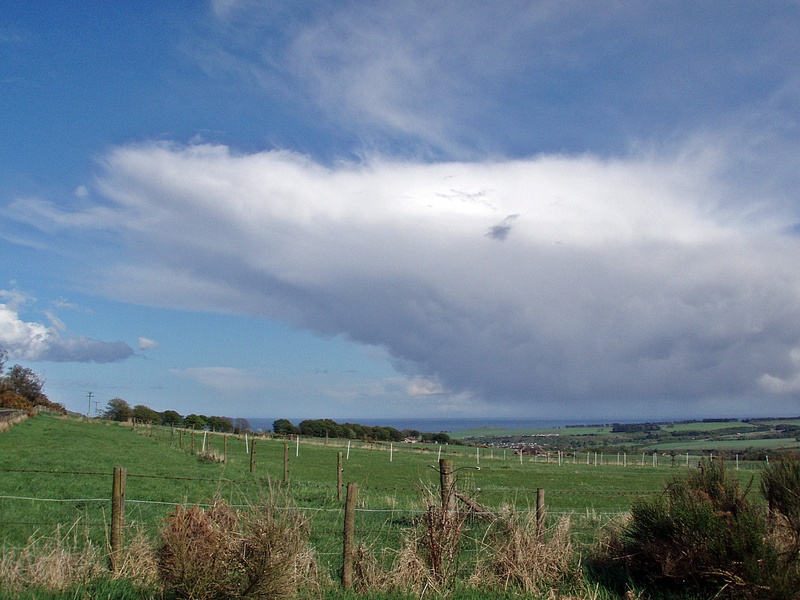 Another front approaching from the sea. 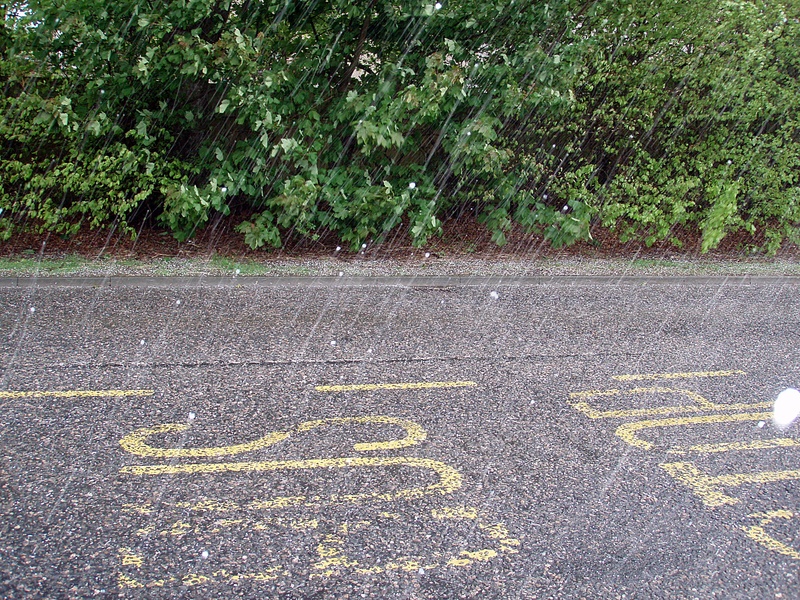 When I arrived in Stonehaven around 17:30, another heavy hail shower came down and I quickly took shelter at a bus stop. Then I started looking for a place to stay. To my surprise, there were not that many B & B’s around, and the ones I could find all had “No vacancies”-signs. 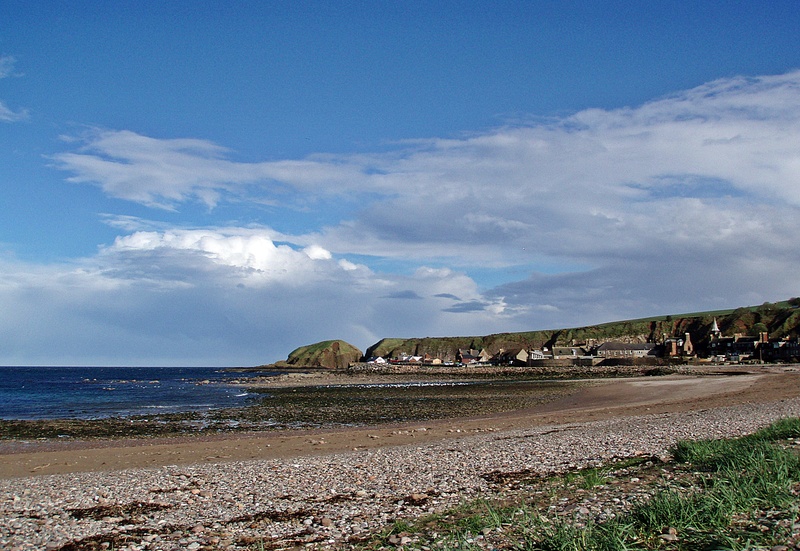 The first hotel I came across was the Belvedere Hotel, but at this stage I thought a hotel would be too expensive and I was still hoping to find a B & B.
I walked down to Stonehaven Bay, by now the sun had come out again but it was extremely windy. At the Marine Hotel (which was fully booked, of course) some locals in the bar suggested I could camp at the (closed) campsite, but I didn’t want to get caught “trespassing”. Besides, it was so windy and cold with occasional rain showers, that I just wanted to be somewhere warm and not in a cold tent shaking wildly in the storm. Freezing, I put on my warm jacket and continued on another round through the town centre, trying all the – more expensive looking – hotels that I had passed the first time round. Back at the Belvedere Hotel, I asked at the bar if they had a room (they didn’t), and decided to have a meal, mainly to warm myself up, but also to think about what to do. The only option seemed to be a wild camp somewhere between Stonehaven and Dunnottar Castle, but considering the weather it would be difficult to find a sheltered place, besides there was only farmland around. 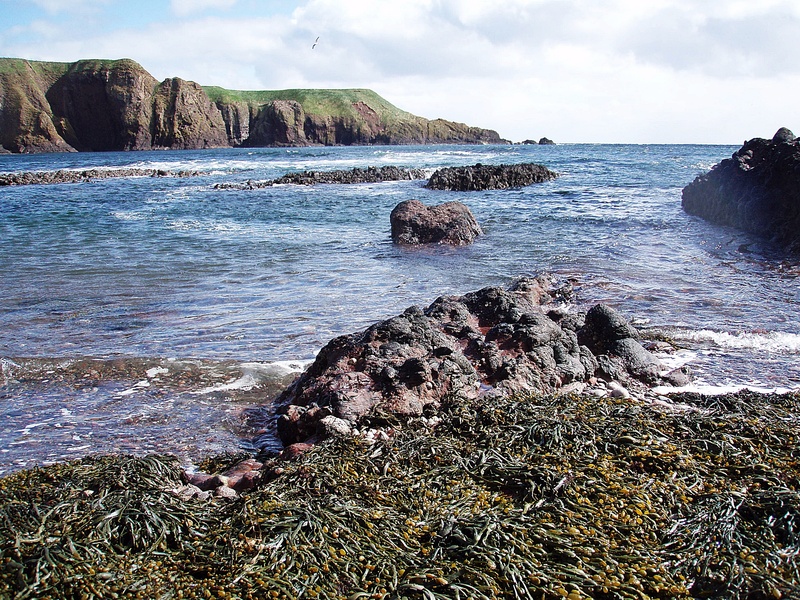 After I had packed my rucksack in the morning, I was going to leave and head for Dunnottar Castle. But Susan had already prepared apple juice, coffee and scrambled eggs, and insisted that I had breakfast first! So we sat and chatted over breakfast, until it was time for me to go. 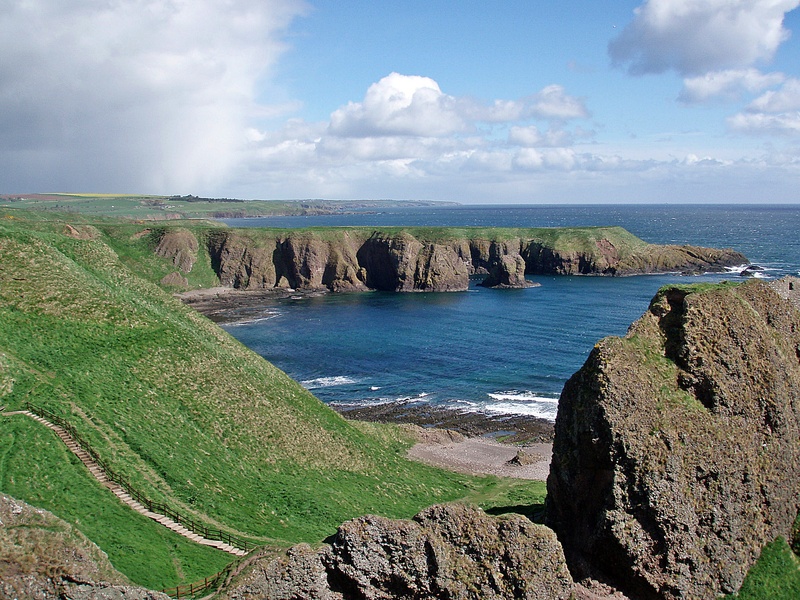 Susan also showed me the best route to Dunnottar as the coastal path along the cliffs is closed, and gave me her phone number and offered to pick me up at the castle and give me a lift to Montrose in case I missed the bus (there is only one bus per hour). After some persuasion she even accepted some money from me, as a little thank-you for her hospitality, and I finally set off. 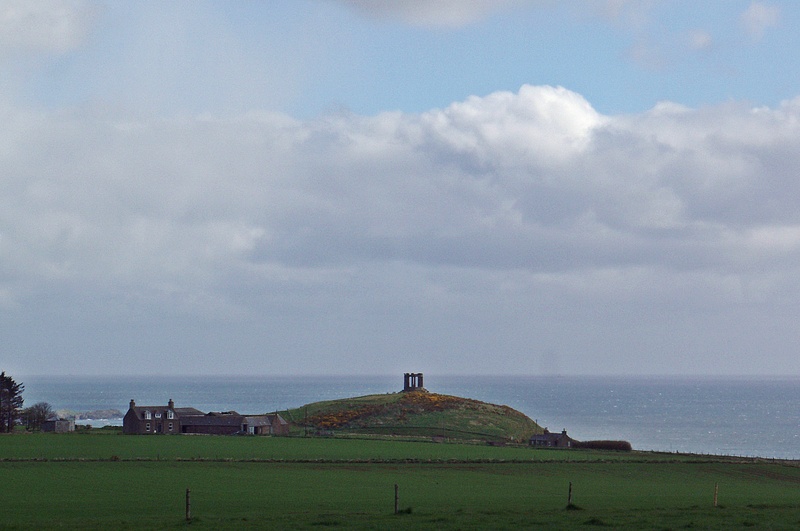 I walked through the Woods of Dunnottar and along a minor road, with the monument on Black Hill to my left. 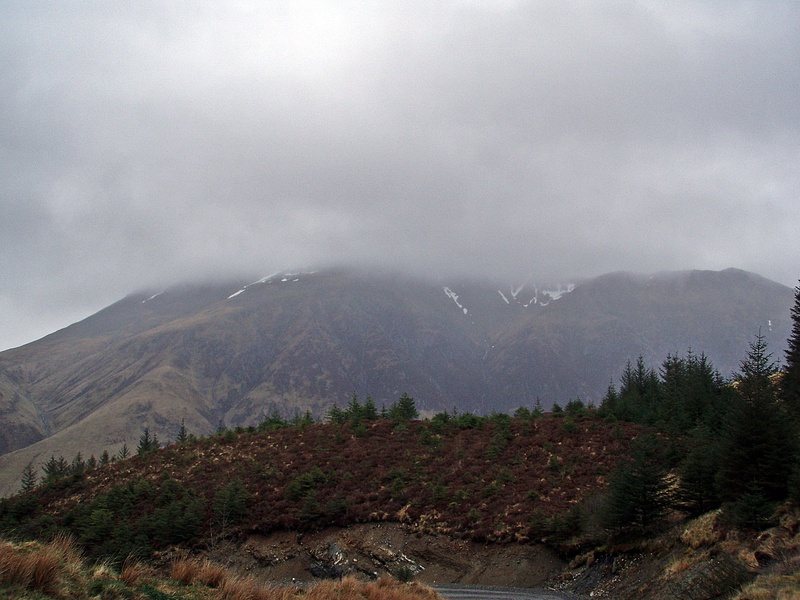 The weather was windy with rain showers and sunny spells in between. 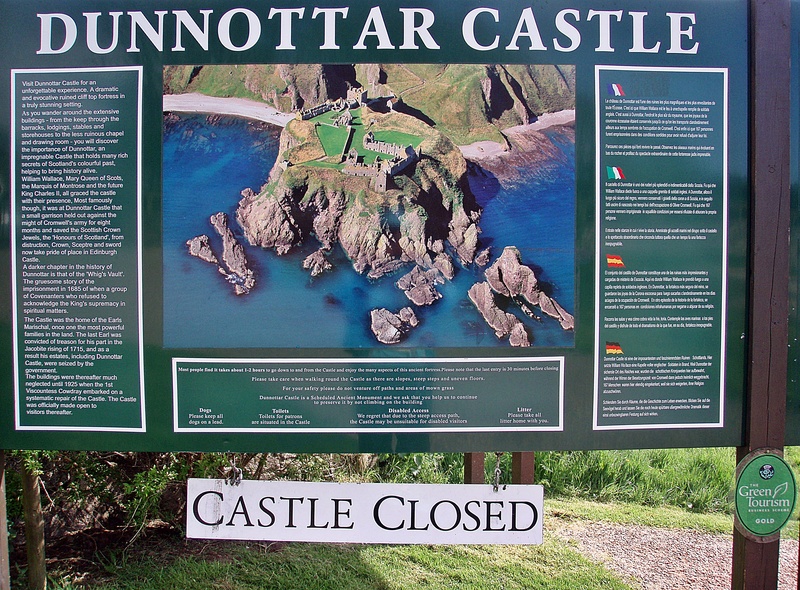 When I arrived at Dunnottar Castle, a “Closed”-sign was attached to the information board. At first I thought I was too early and they would soon open. 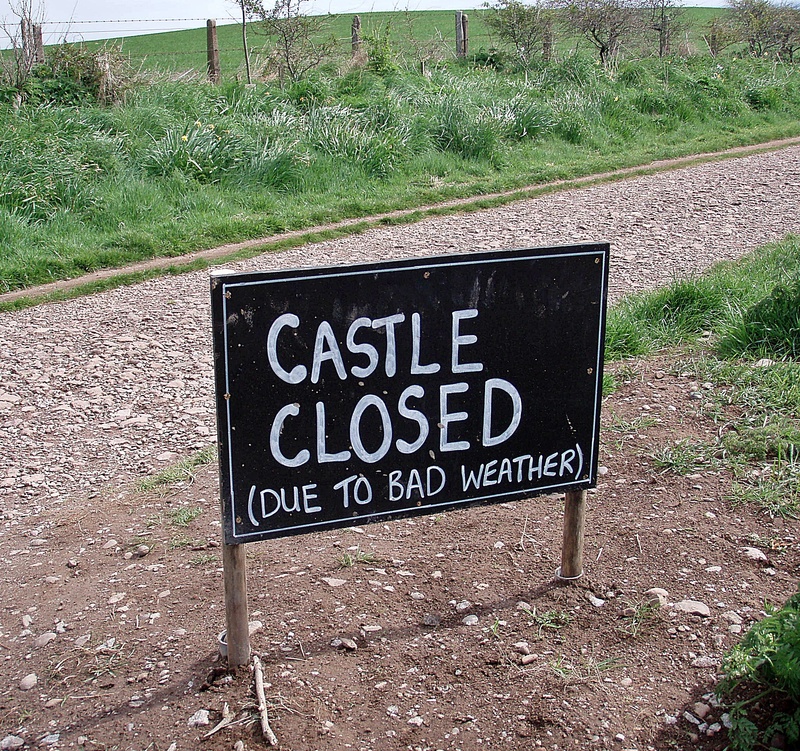 But a few metres down the path another sign made it clear that I had walked across the whole of Scotland to find my destination closed “due to bad weather”… somewhat ironic! Never mind, I would just have to come back another time to visit the castle itself, but at the moment I had to finish the Challenge, so I walked down the steps to the beach. It was too windy to hang around for long, so I climbed back up the steps and walked S onto the next cliff to get another view of the bay and the castle, trying not to be blown over by the strong gusts. I found the bus stop a few hundred metres along the A92, and only had to wait a few minutes for the bus to Montrose. As it was still very windy, I would have preferred a B & B instead of staying at the campsite, but after my experience in Stonehaven I didn’t have much hope to find anything at such short notice. At the Tourist Information I got a list of accommodation providers and a map, sat on the bench outside and phoned all the ones within walking distance of the town centre. I was lucky and found a bed at the Greenbank B & B, although it was a family room and therefore a bit pricey at £ 55. Then I walked to the Park Hotel, where I was greeted by Sue, John and Steph. I signed out and received my certificate, T-shirt, socks and buff, and sat down for a cup of tea and some biscuits. In the meantime, more Challengers arrived, among them was Nick, whose blog I had been following, but we had never met. We had an interesting chat, but he was in a hurry to travel back home the same day. 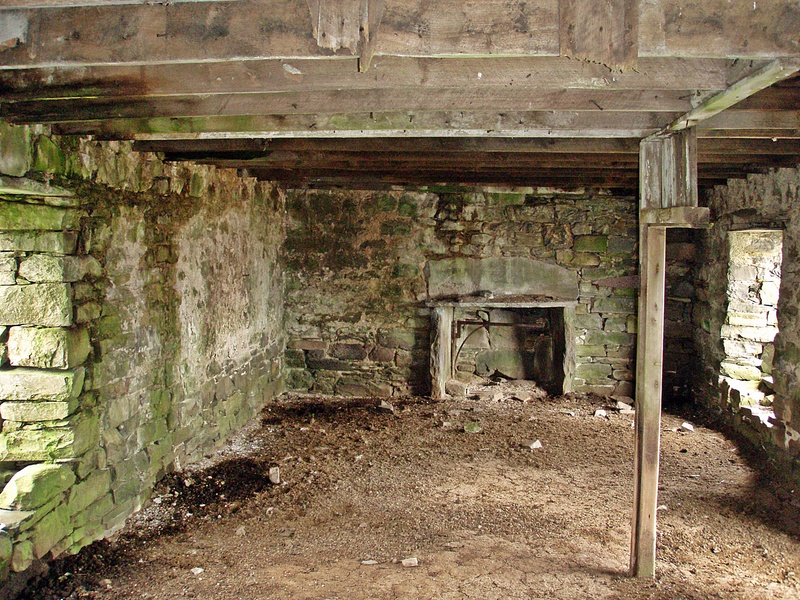 After some more socialising, I headed towards my B & B, and on the way I realised I was getting hungry, so I stopped for lunch at The Northern Vaults. The Greenbank is just a few minutes walk from there, I checked in, had a shower and washed my hair, tried to get my rucksack contents organised for the next morning, and went back to the Park Hotel. The bar was packed by now, and it was great to catch up with Stuart, Paul, Evan, Laura, Louise, Denis, Frédéric and many others. After a few drinks we moved to the Ballroom for dinner, which consisted of lentil soup, chicken breast stuffed with haggis, and cranachan. Between and after the courses, tributes were paid to Challengers who had completed their 10th or 20th crossings, and to various people involved with the organisation of the Challenge. On the way home it was cold and windy, and I was glad to have a warm room to return to. The next morning, I was pleasantly surprised to meet Paul at the breakfast table, I didn’t know he was staying in the same B & B. Then it was just a short walk to the train station, and the train home, with the usual change at Aberdeen. 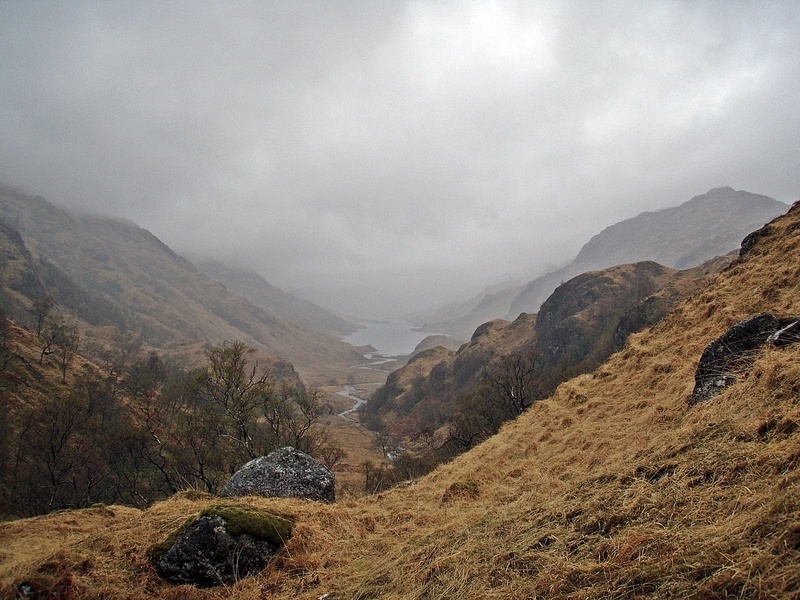 During the two weeks I had two low points, the first one being the long walk through Glen Nevis in awful conditions on day four. 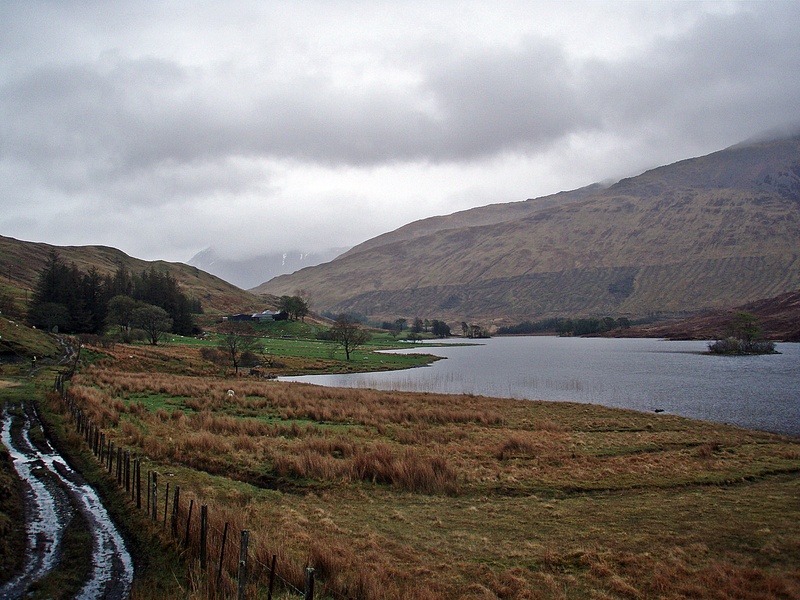 The next day I met Stuart near Loch Ossian, and asking about his impressions so far, I found it very inspiring that he really enjoyed his first Challenge, in spite of the weather. The fact that the weather improved from that day onwards, helped of course! 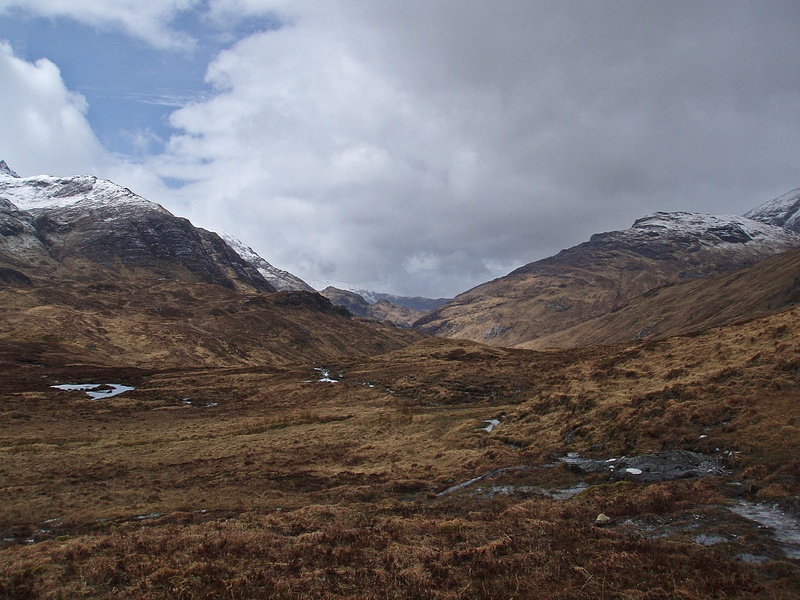 Apart from the Mamores ridge I could walk my route as planned, and I discovered a few areas that I had not visited before. All in all, it was a great experience that I wouldn’t want to miss. So this was my third Challenge in three years, I wonder if I will be lucky in the draw four times in a row? What a great Challenge you had. Let’s all hope we get on the next challenge. Thanks – and fingers crossed! As always, an interesting route and a brilliant read! Fingers (and everything else!!) crossed for us all getting on the next Challenge. See you there! I enjoy it when your TGO write ups appear. You seem to choose great routes, have a way with words, and your photos are great. 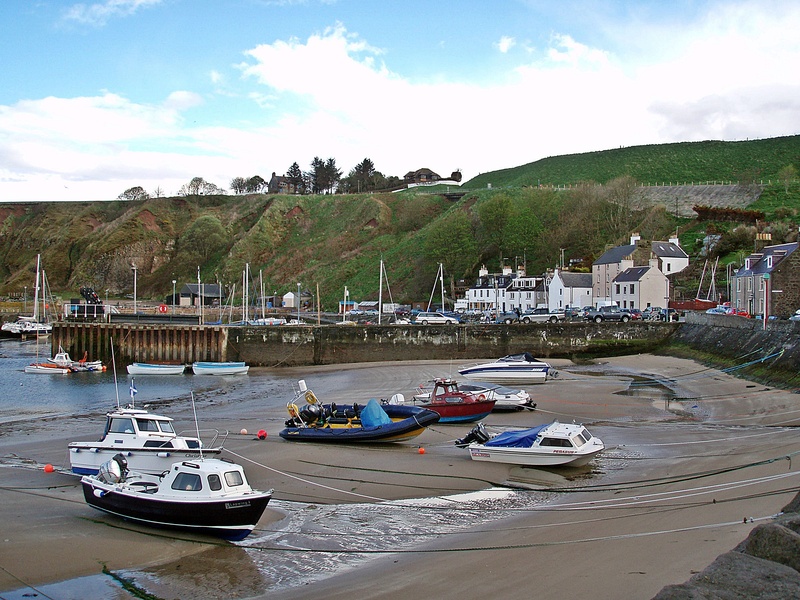 An excellent report, and really great to meet people like Sue in Stonehaven. Shame about Feughside Inn, the food there being a highlight of my first Challenge in 2007. Good luck in next year’s draw. 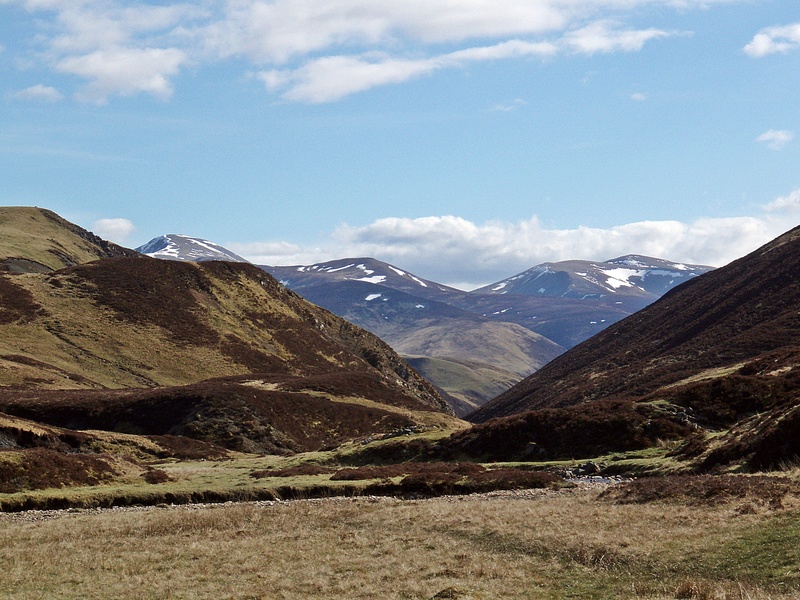 Many thanks to all for your kind comments, really hope to see you all on TGOC 2014! But I hope your holiday wasn’t completely rainy! A fabulous report Nicole. You certainly picked out an interesting route across the country and whilst I recognise several stretches and places there are lots of other parts that I don’t recognise but look good for exploration. 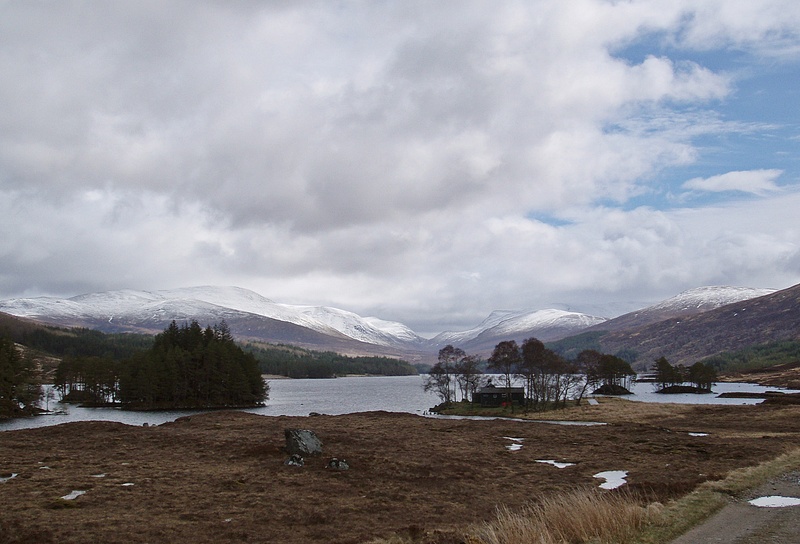 The photos from the day around Loch Ossian and Loch Ericht are particularly great and I’ve made a note of several camping sites based on your photos. 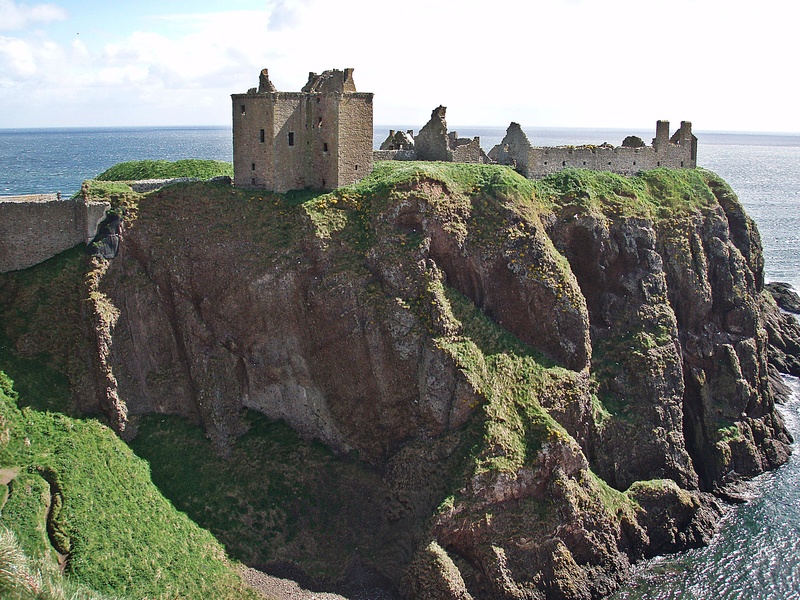 I can thoroughly recommend returning to Dunnottar when both path and castle are open – I’ve done it a few times now and it is spectacular. 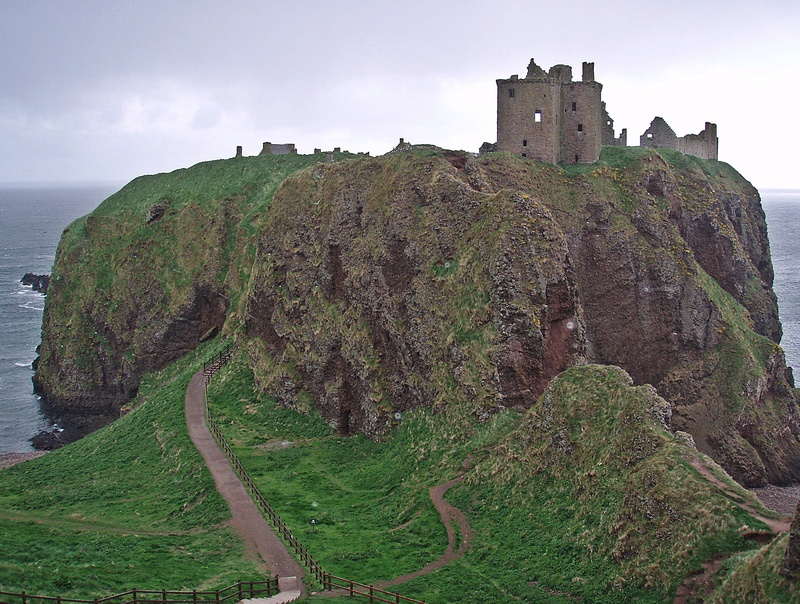 Many thanks – I am definitely planning to visit Dunnottar one day, but not on my next Challenge (and it’s unlikely I’ll get back to that area other than during the Challenge, I’m afraid). It would be nice meeting again, and somehow I’m not convinced that it will be “a few years” until you do another Challenge 😉 I really enjoyed your report, too! Great trip report (as usual!). I’m still trying decide whether to apply for 2014, so your tales of joy, despite the rubbish weather, may inspire me! Thank you! Hi Nicole. I was on the 2013 and 2014 Challenges but don’t think we met unfortunately. 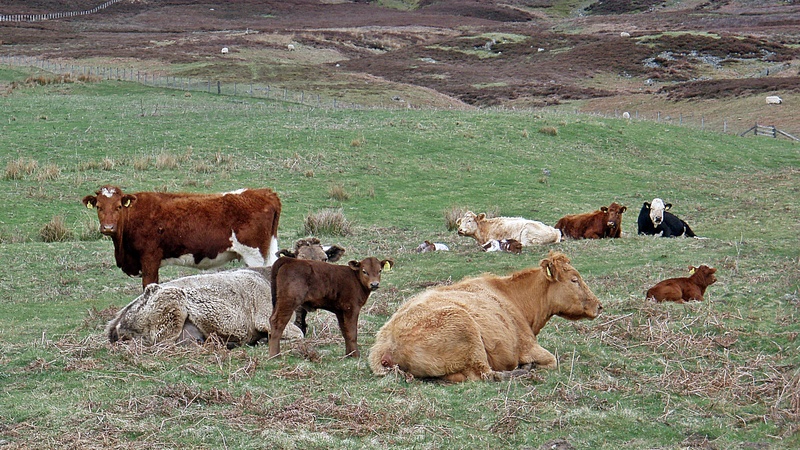 At last I have found someone who shares my aversion / phobia of cattle! I make long detours to avoid them, including, like you, those on that track going into the Fetteresso in 2013 which we were warned about on the message board. I continued on the road to avoid them. I’m slightly braver when I can hide behind other people! Great read. My accounts of 2013 and 2014 are on my blog if you are interested. I’ve been following your blog since TGOC 2013 and really enjoy your write-ups, especially the Challenge ones (although I must admit to finding your obsession with Primula slightly worrying 😆 )! Arggghhhh! So sorry! As I didn’t see a close up photos of you on your blog I didn’t associate you with this post. The Primula stuff isn’t entirely serious, of course, although I have just thrown another tube in my rucksack as I head up to the Lakes to meet Andy Walker in the rain. I usually take some Primula on backpacking trips as well, but only as an additional ingredient for my (pasta and sauce) dinner. 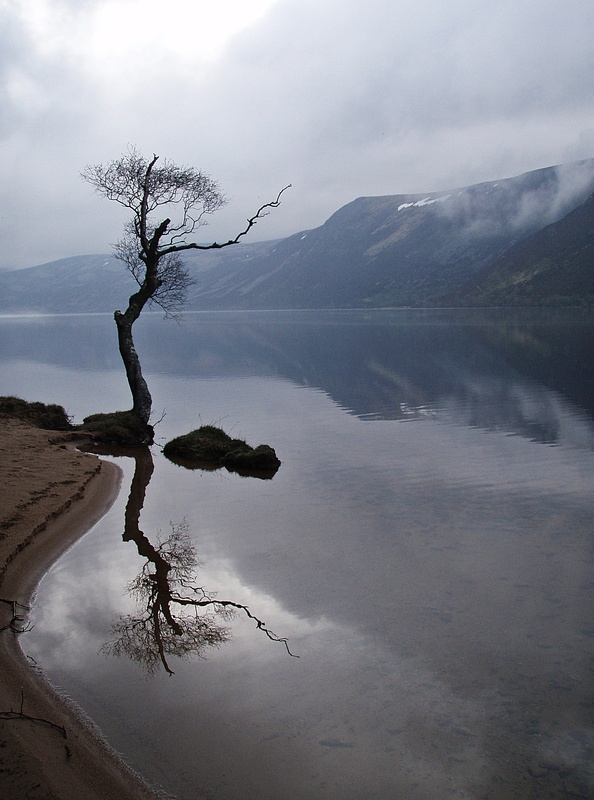 Have a nice trip to the Lakes, hopefully it won’t be raining all the time!